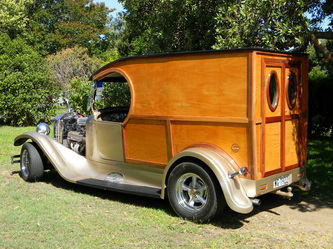 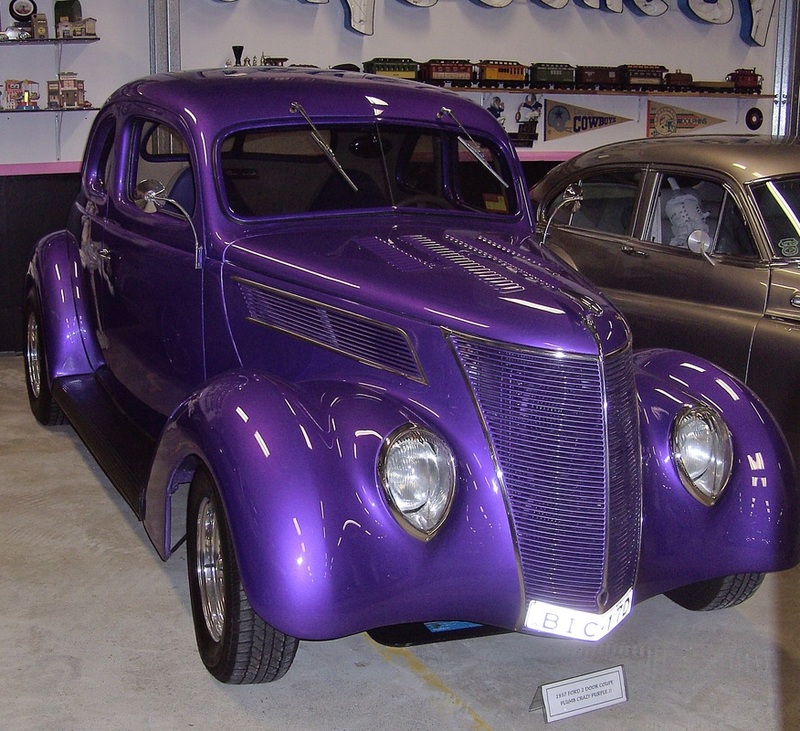 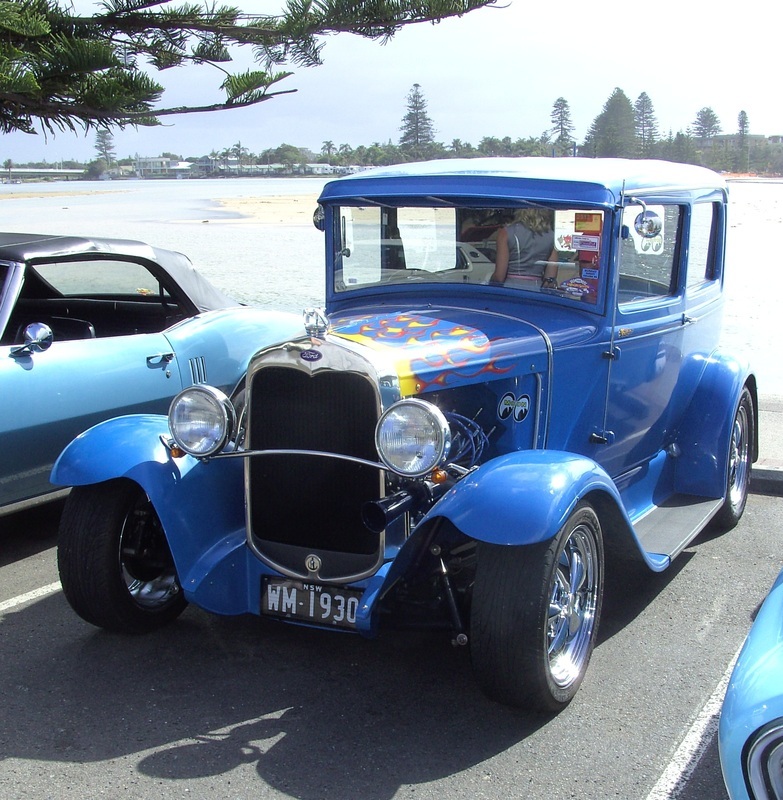 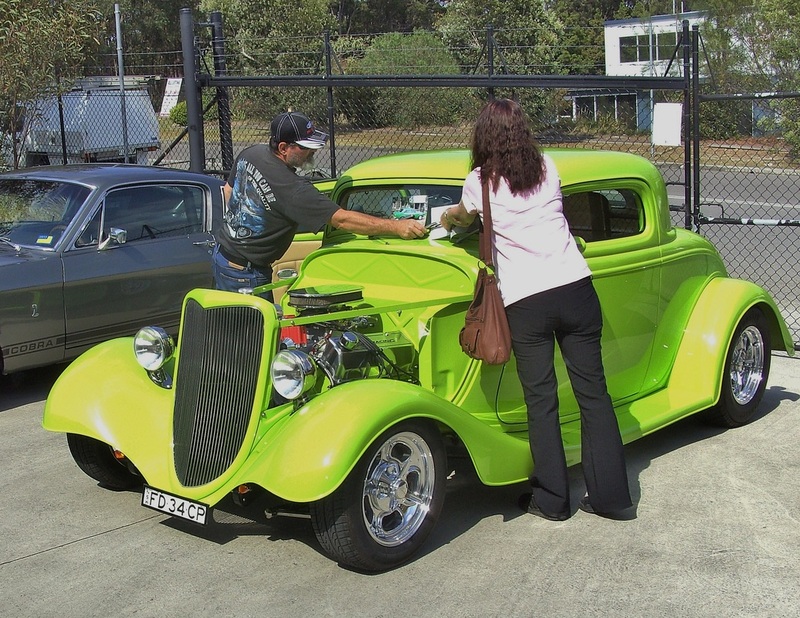 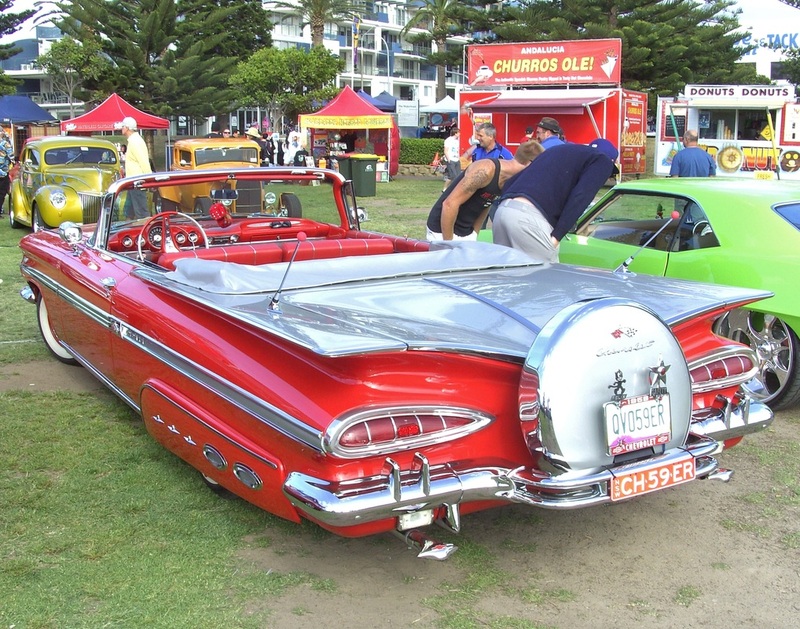 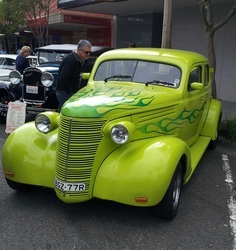 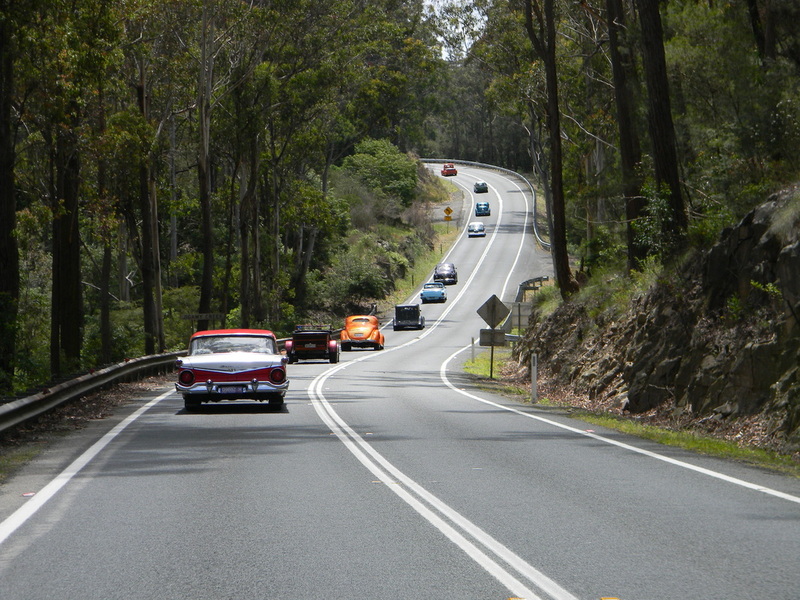 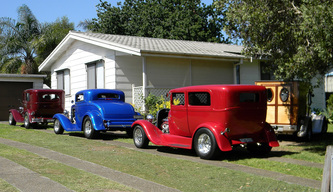 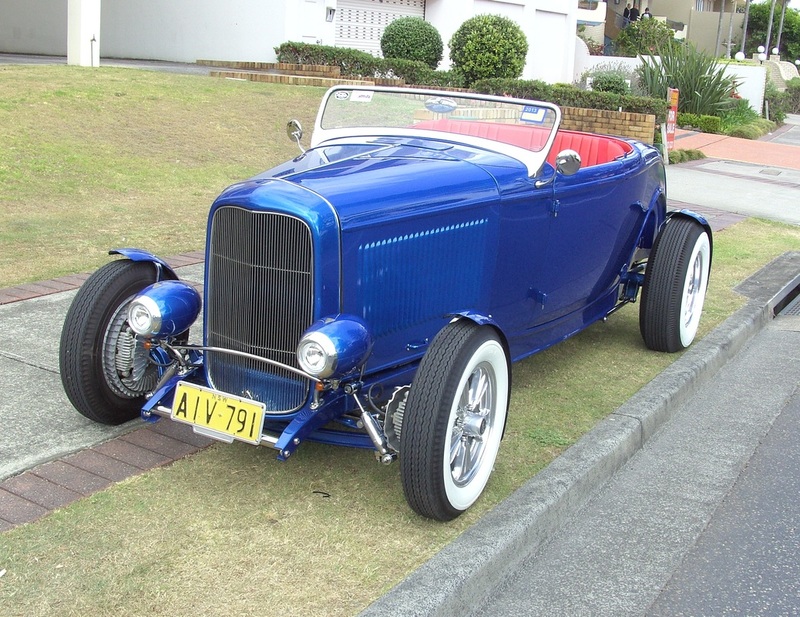 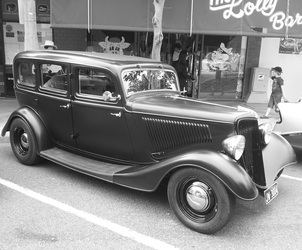 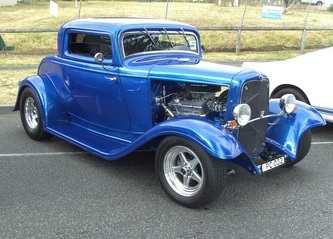 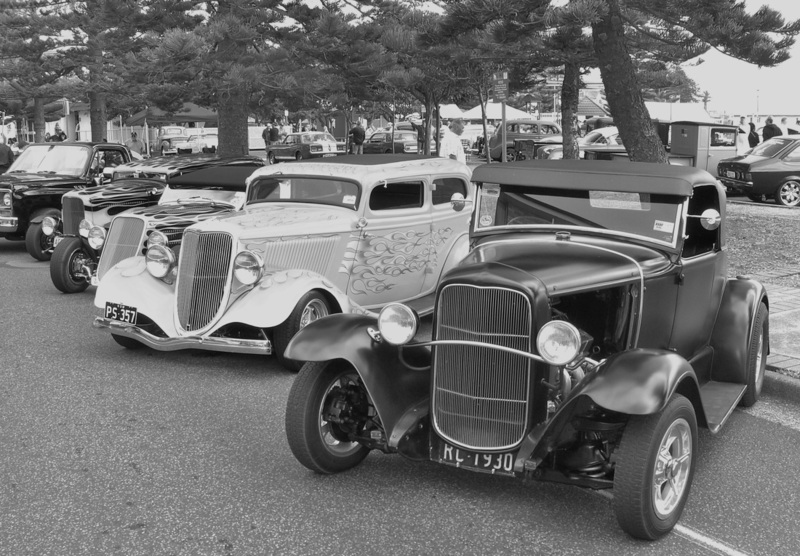 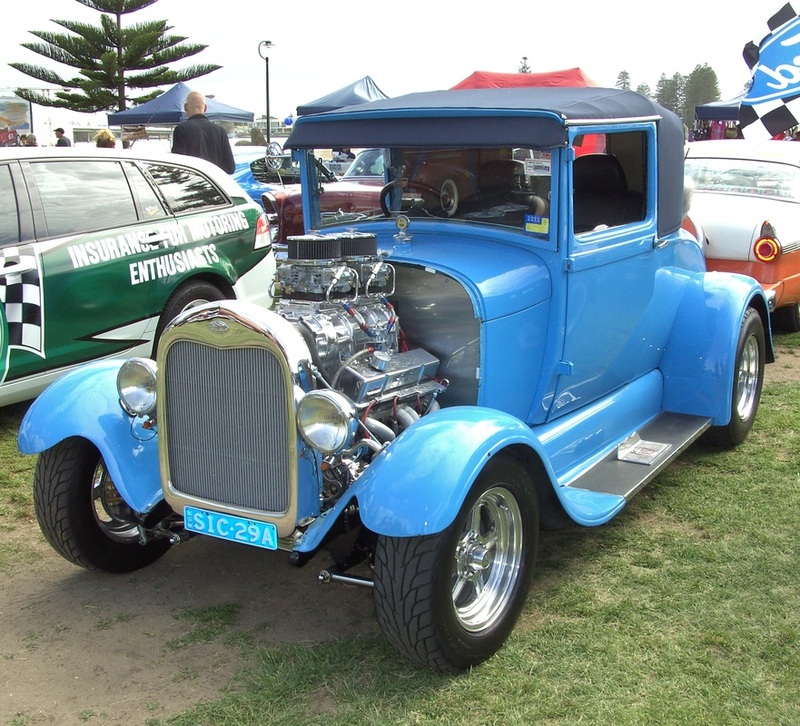 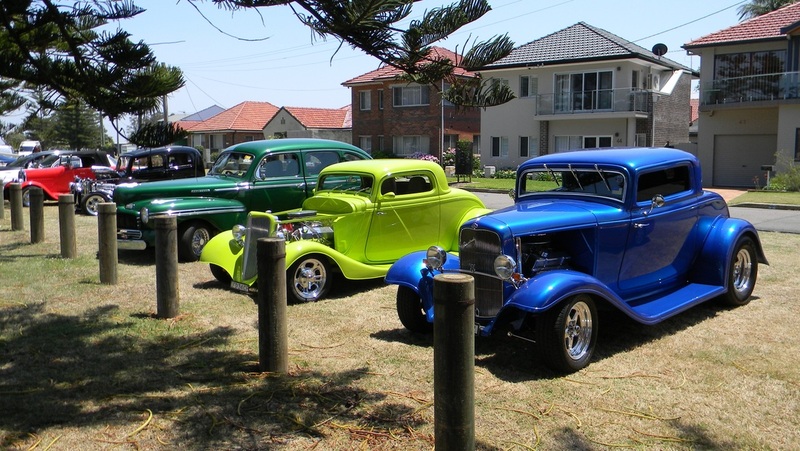 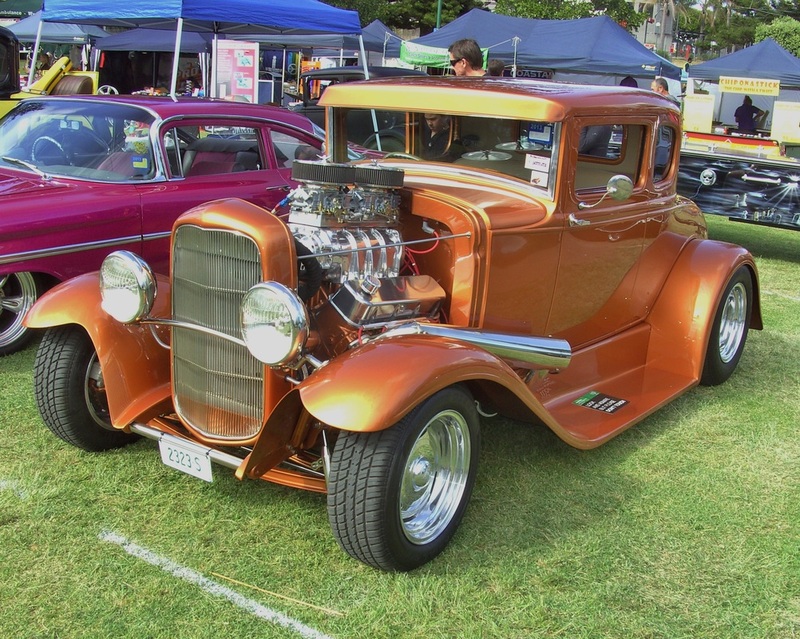 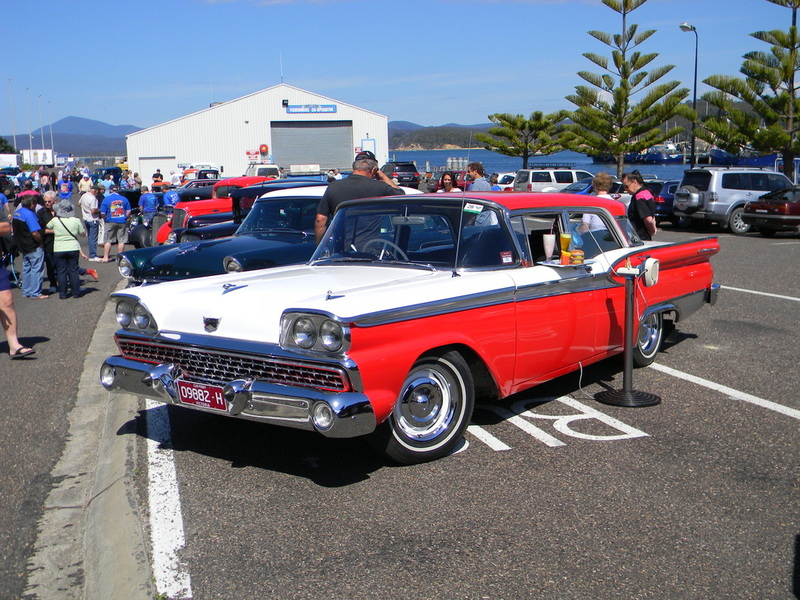 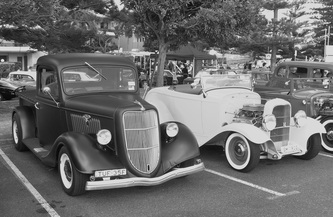 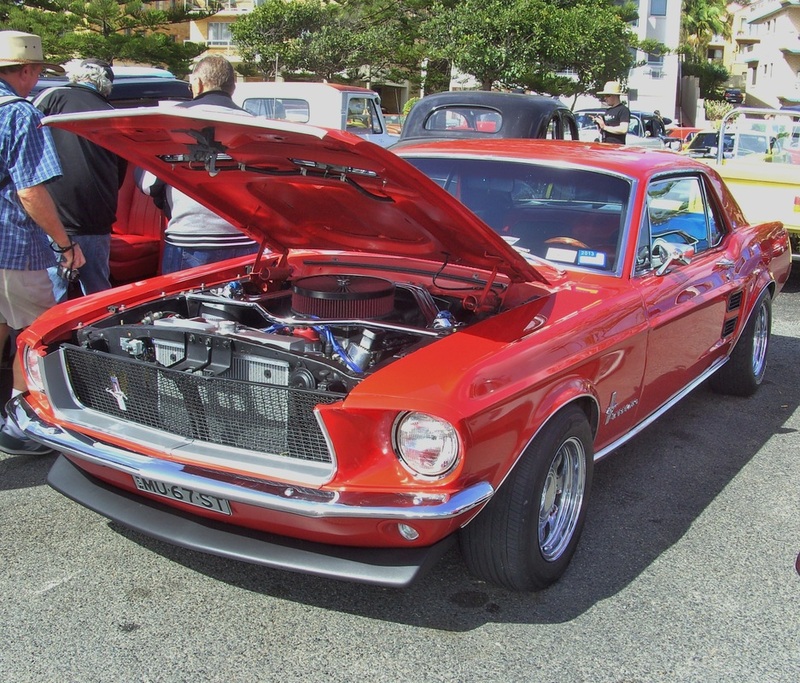 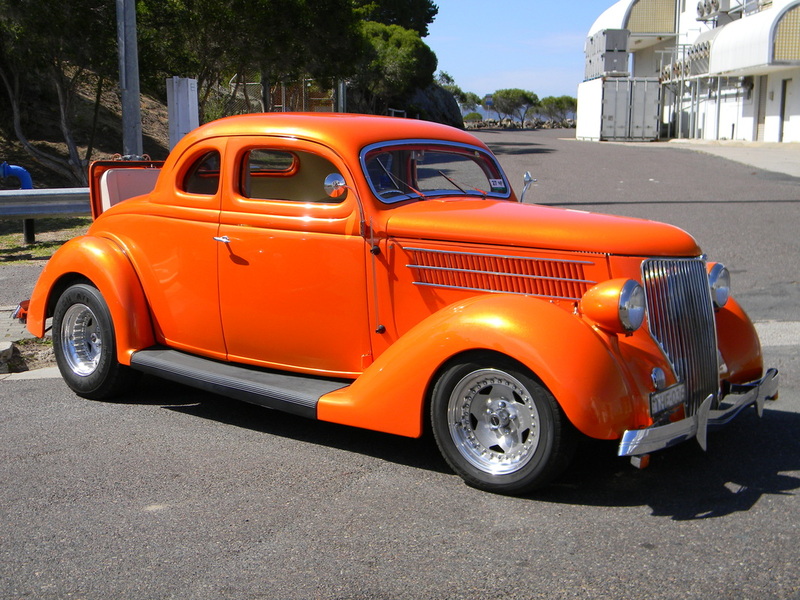 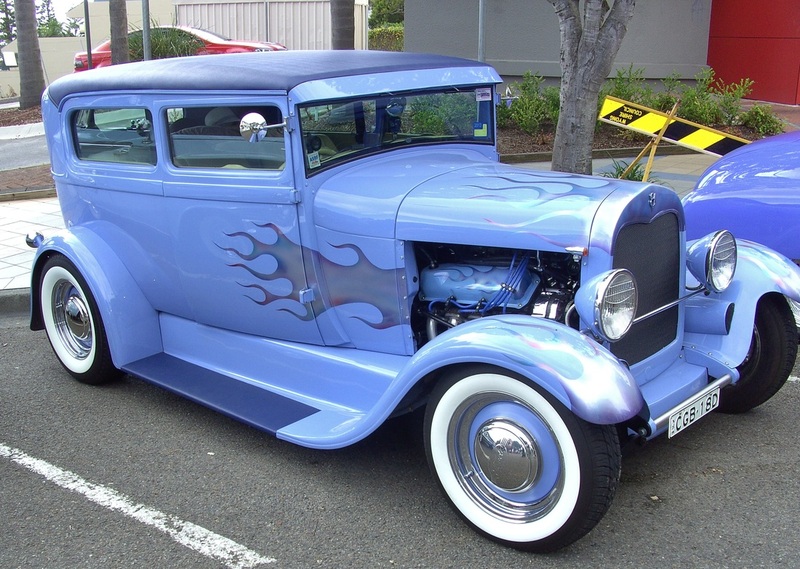 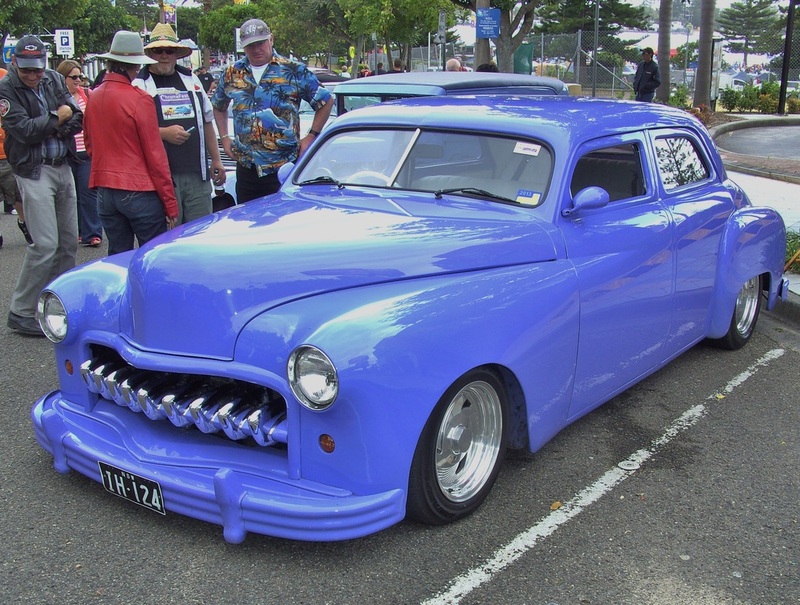 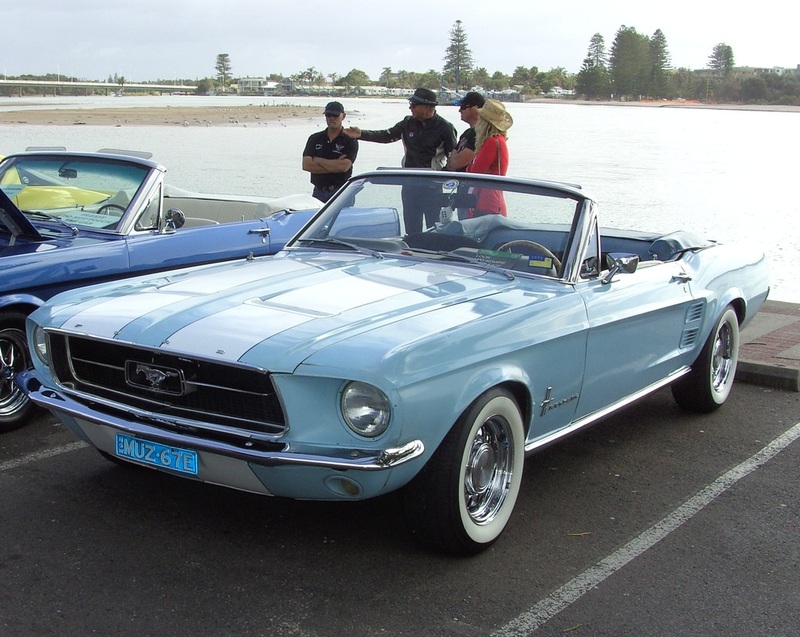 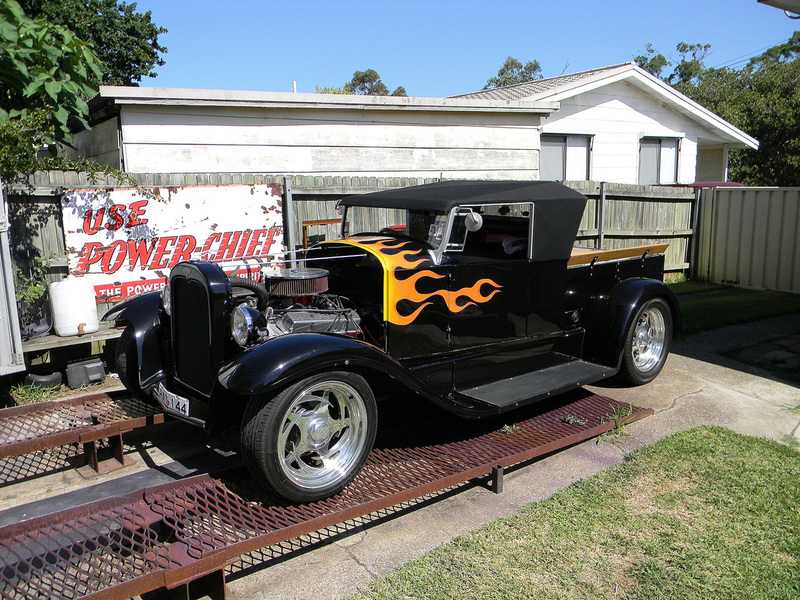 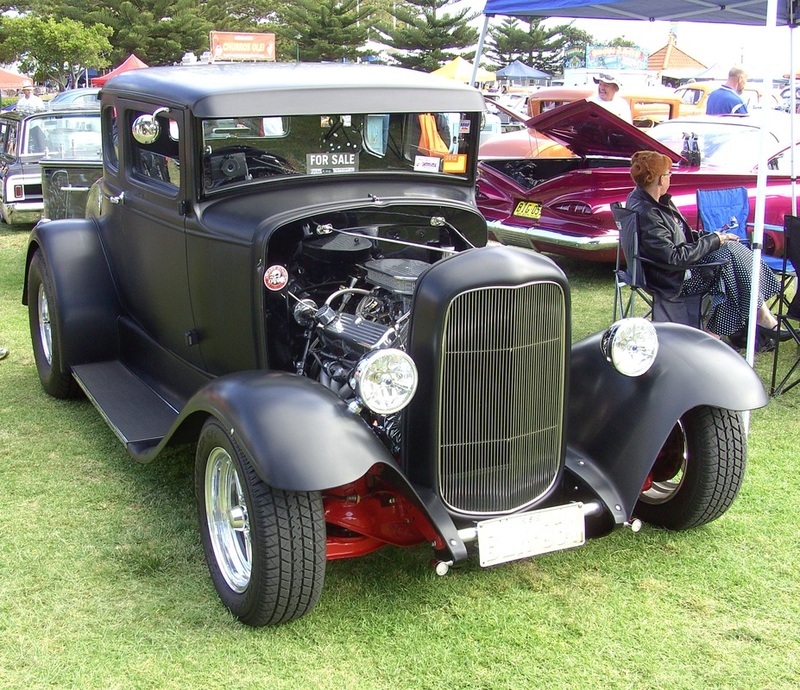 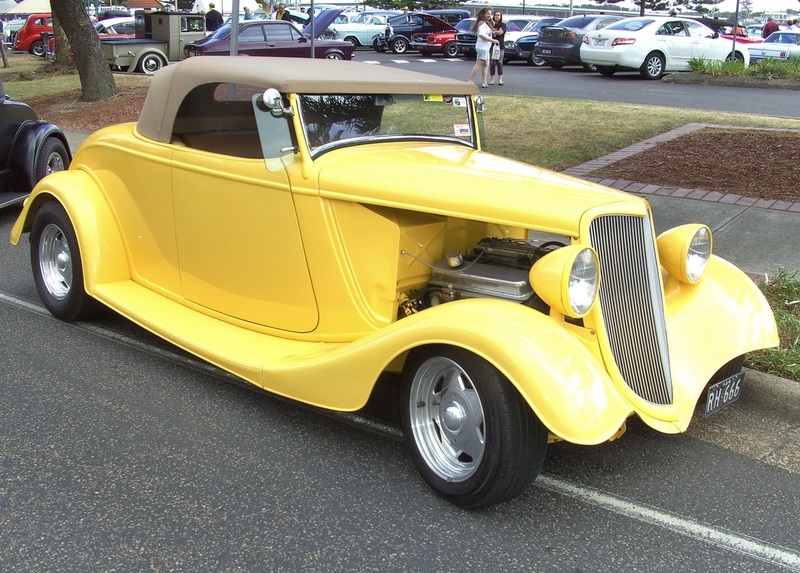 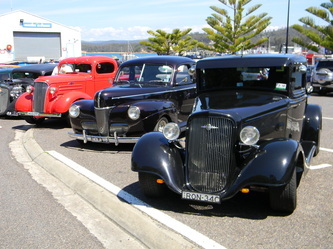 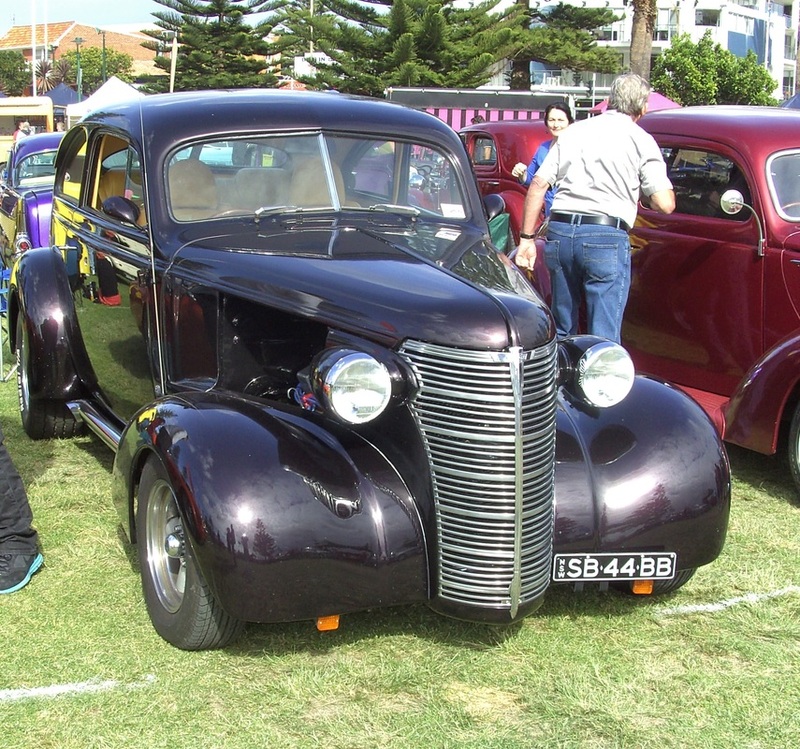 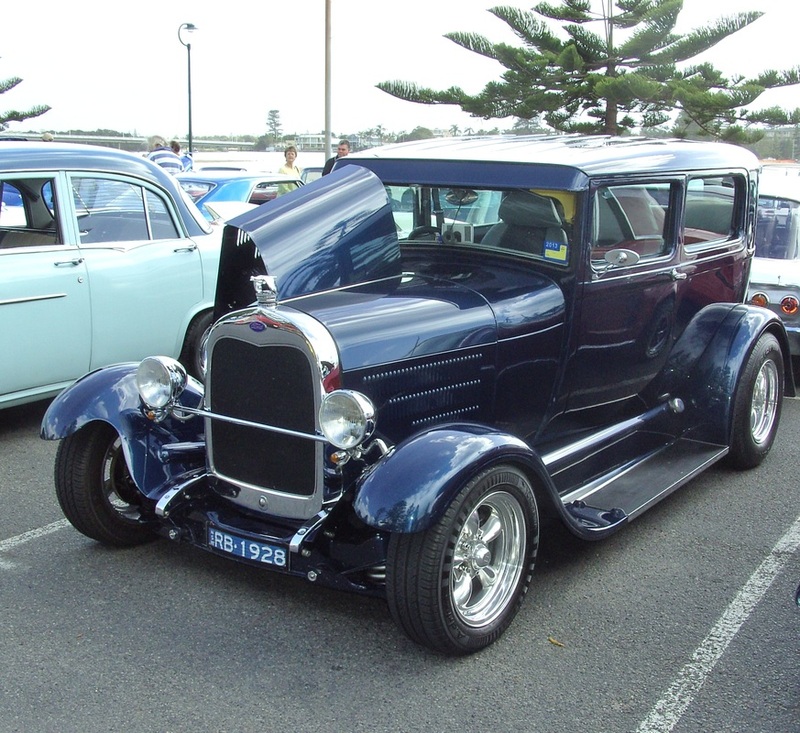 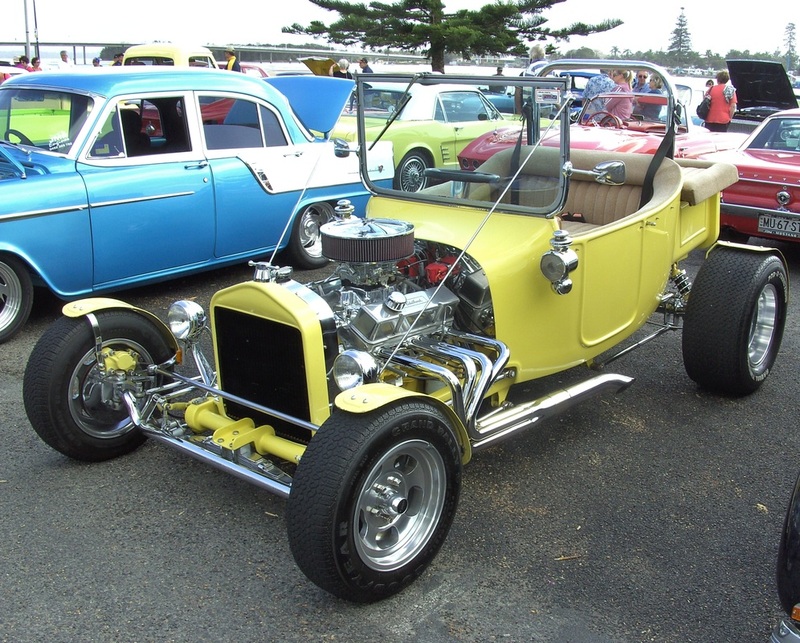 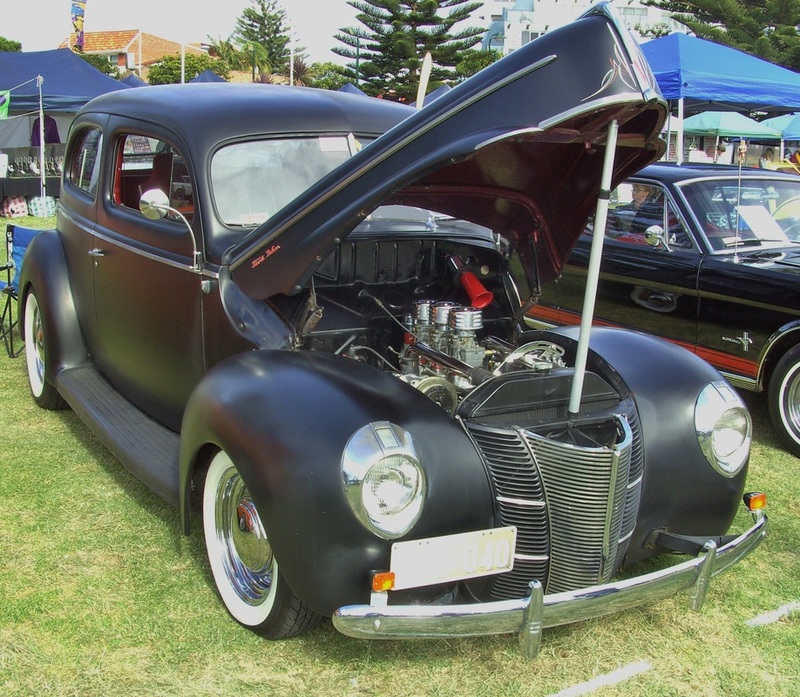 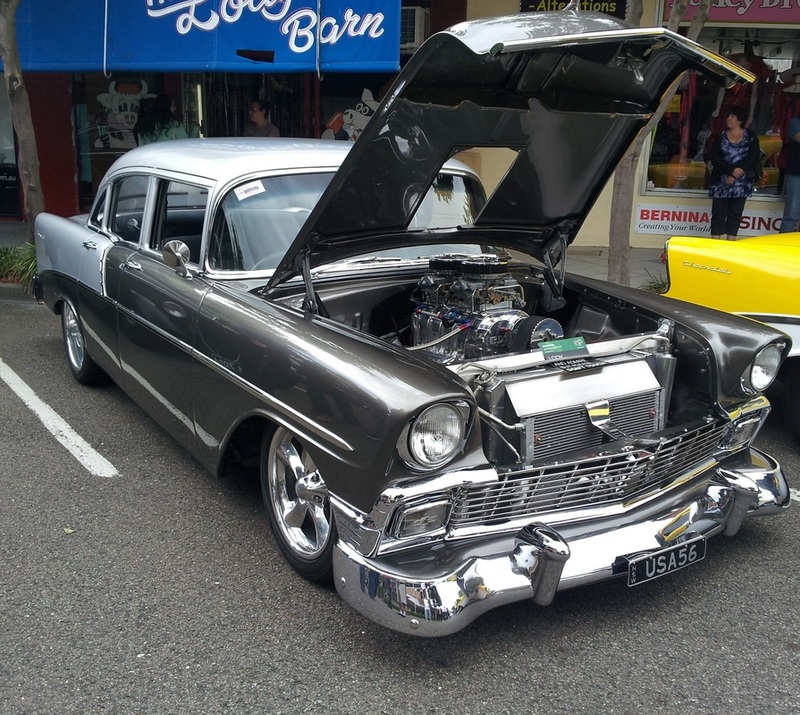 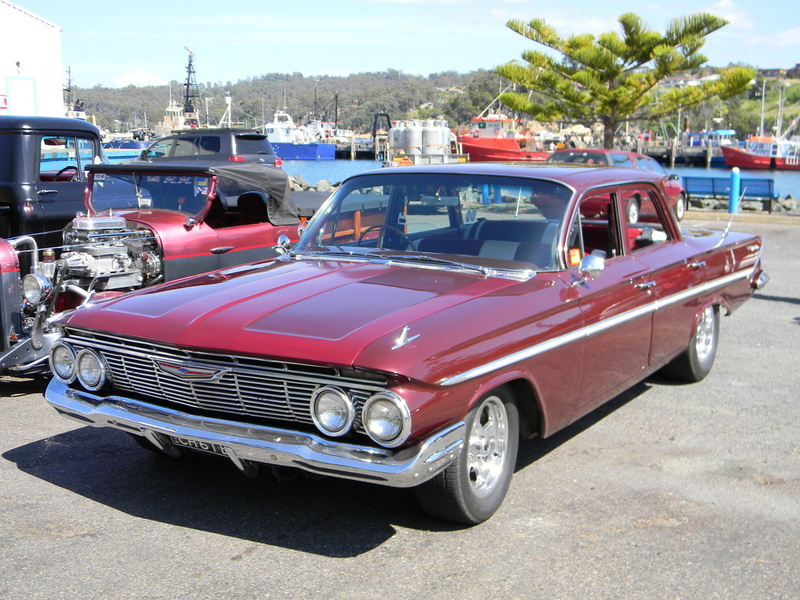 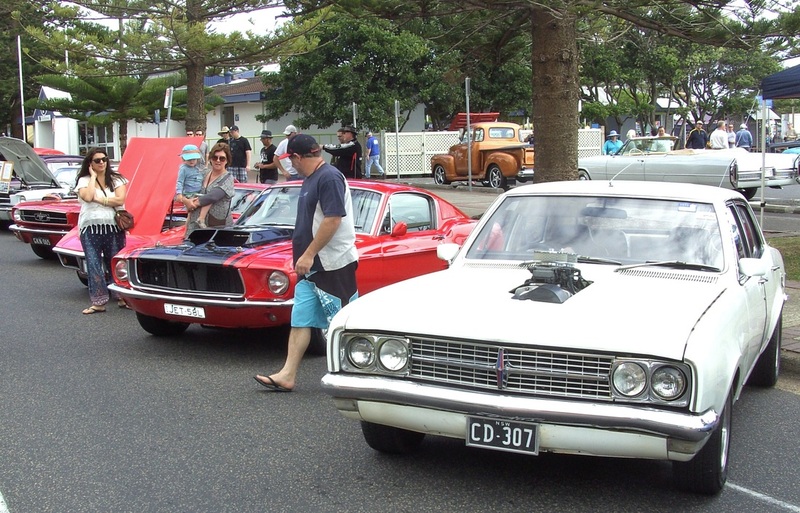 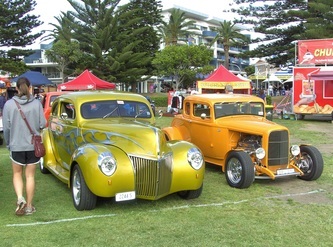 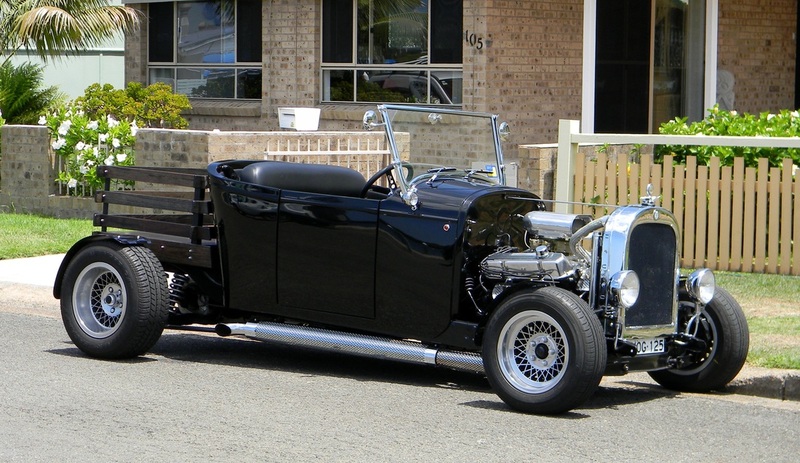 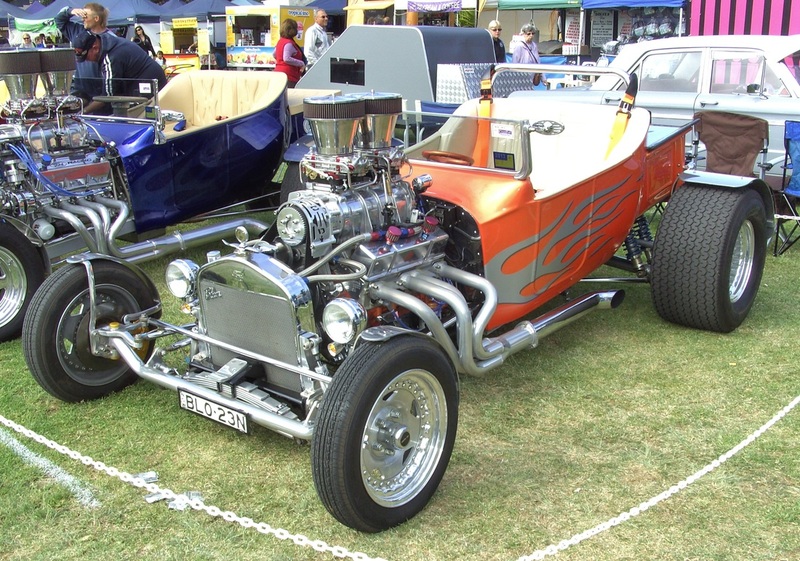 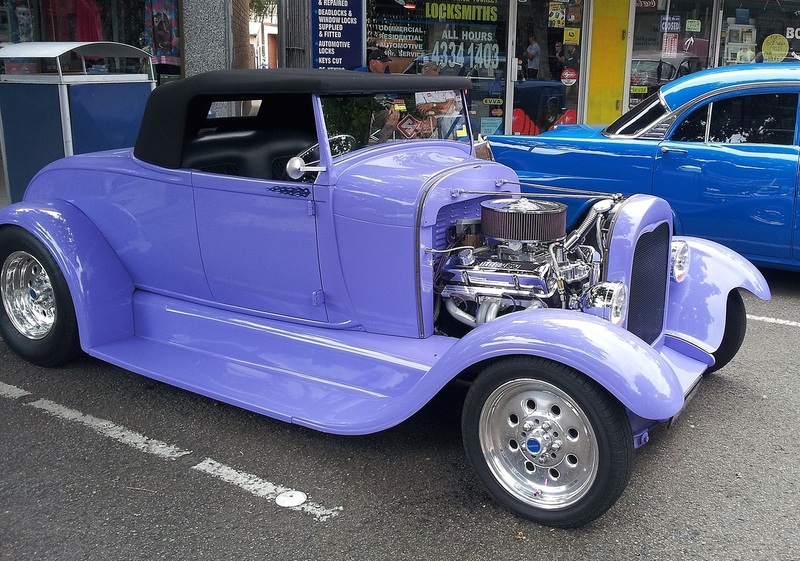 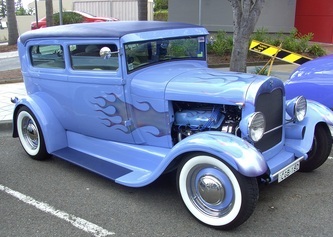 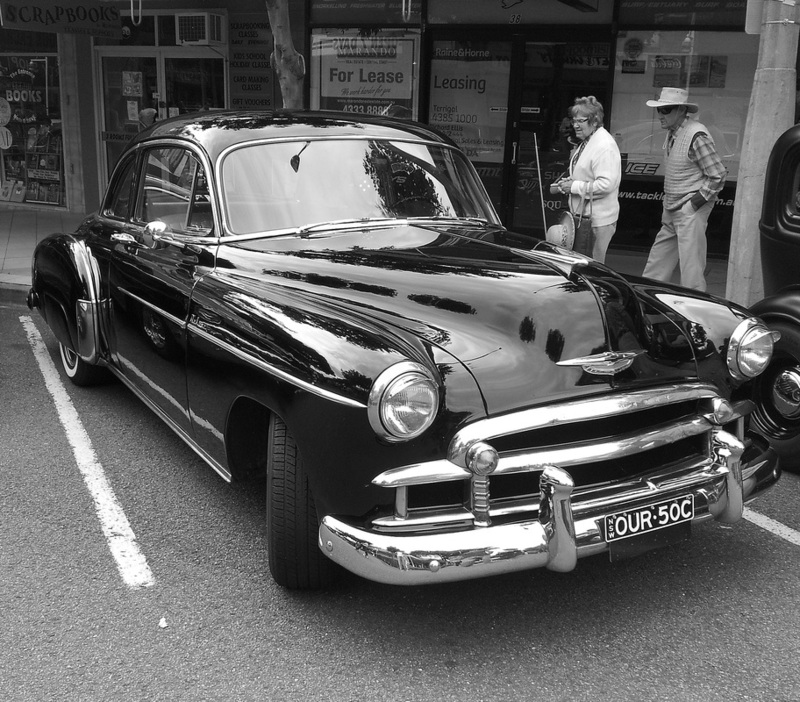 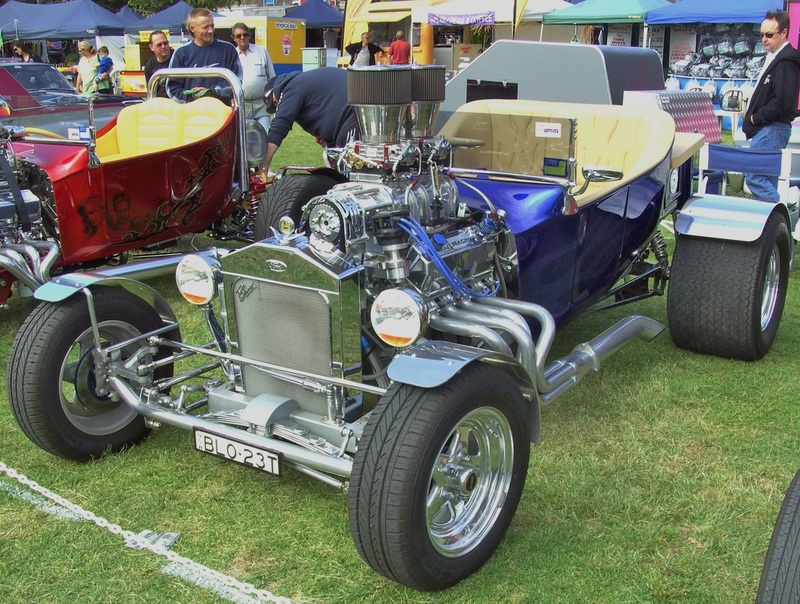 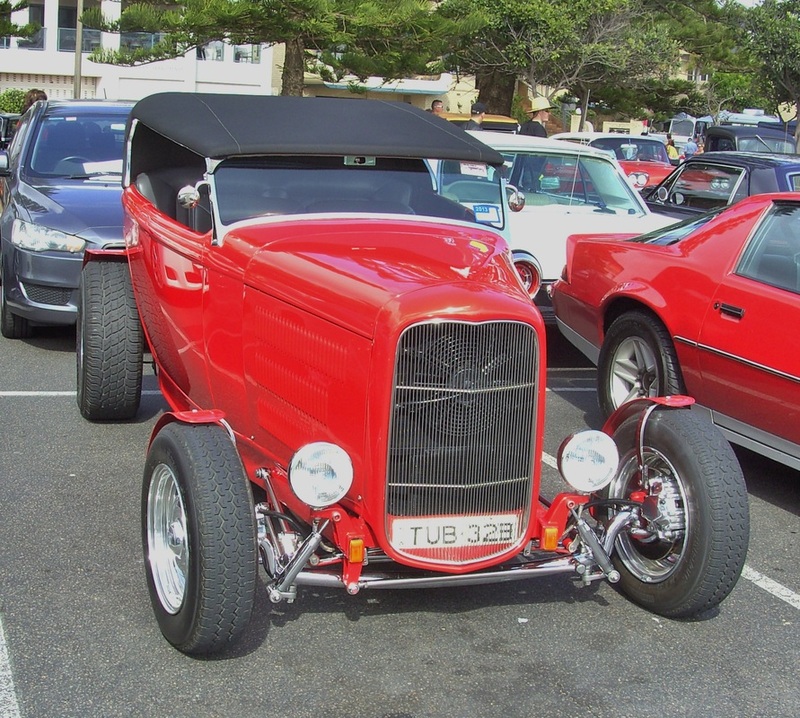 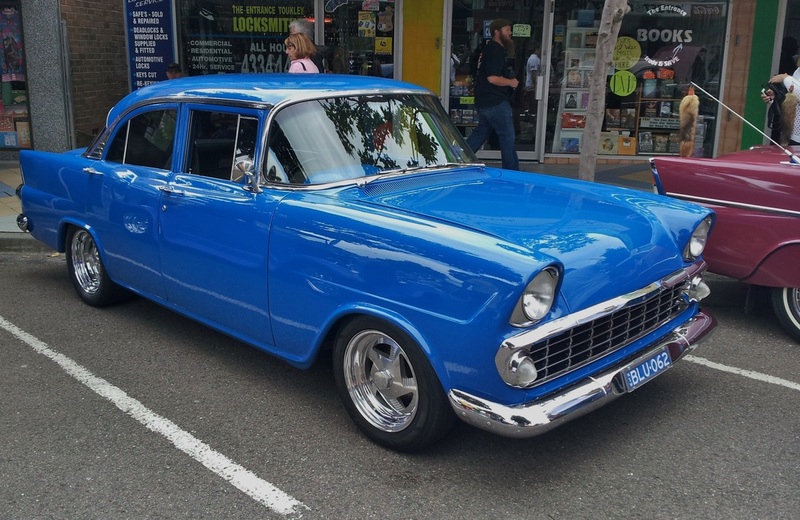 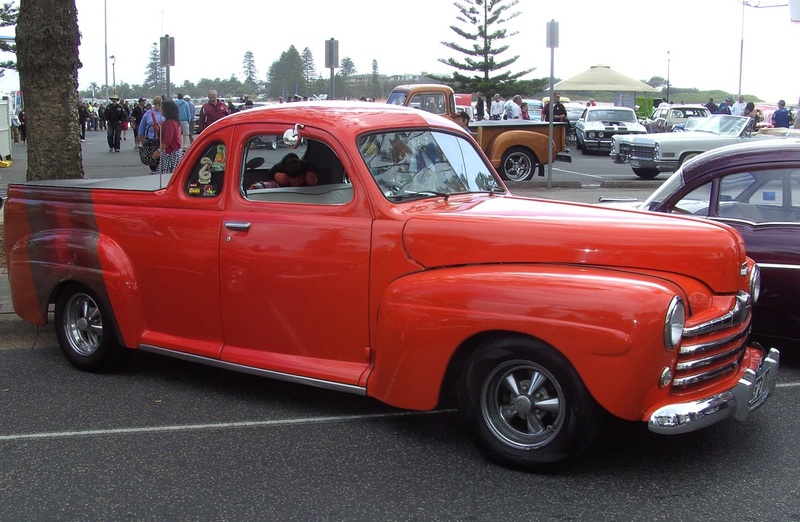 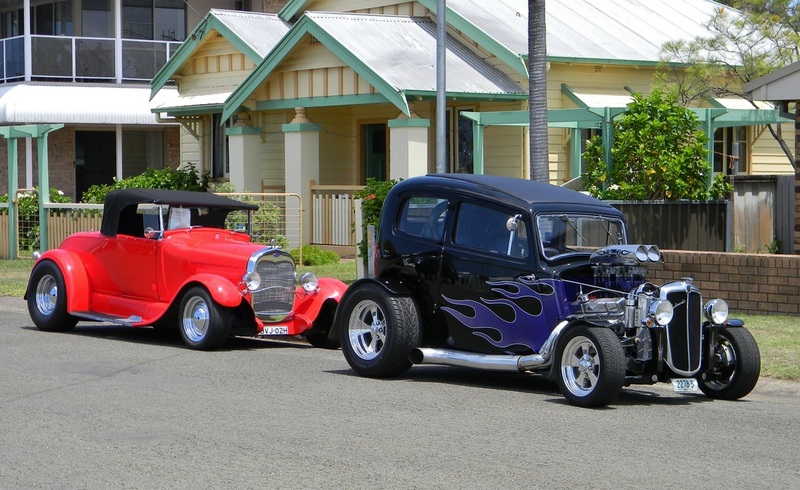 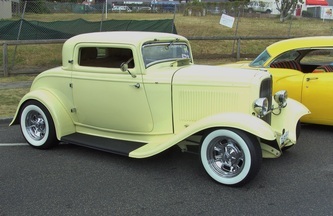 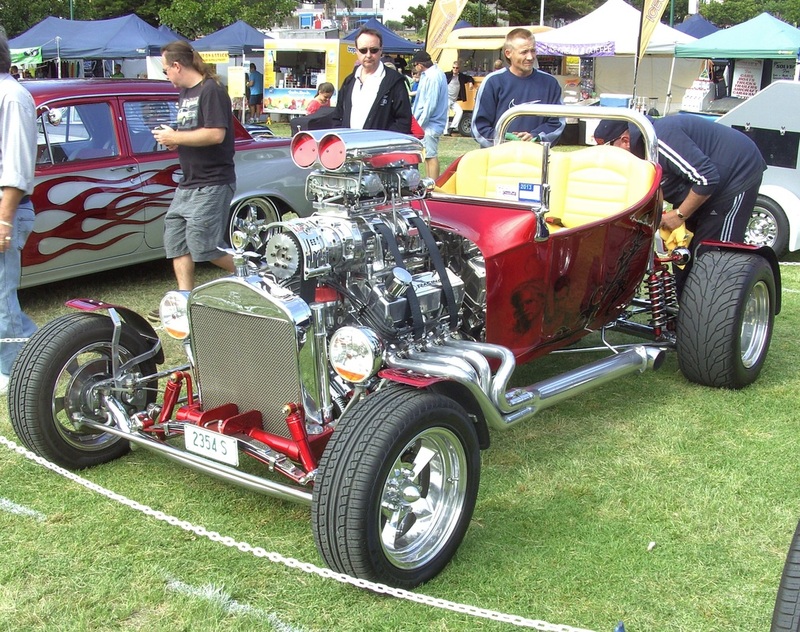 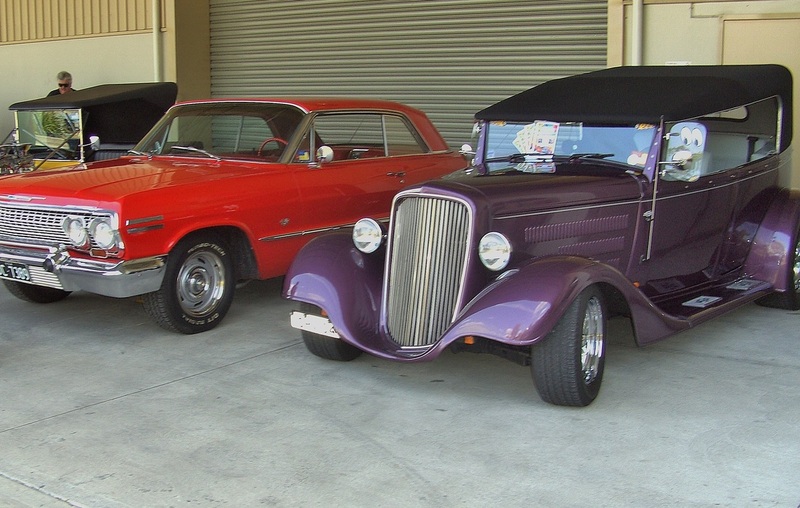 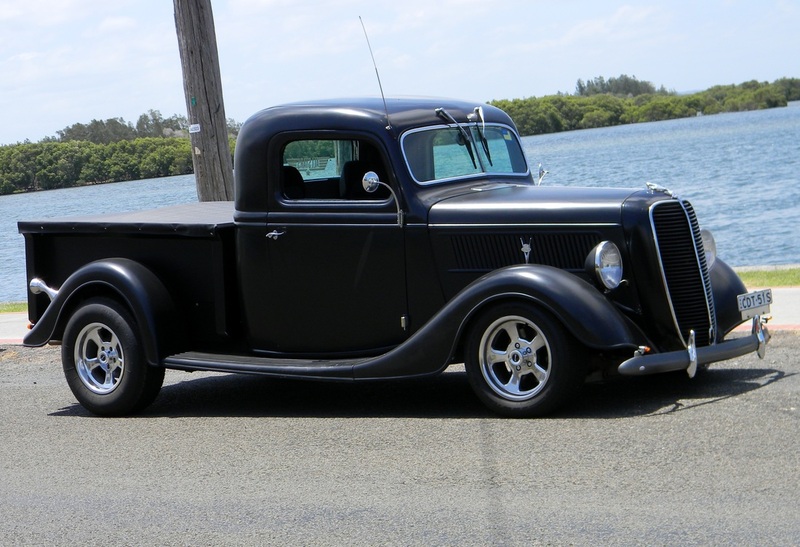 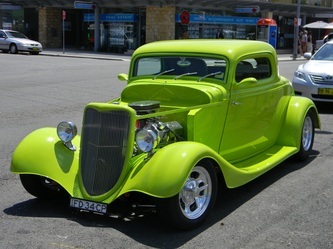 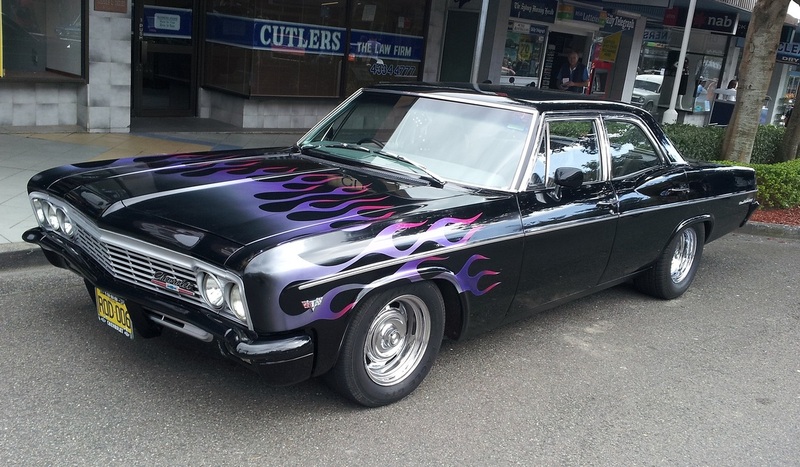 This rod run supports the Eden Whale Festival and is hosted by Shoalhaven Street Rodders who really know how to look after the entrants. 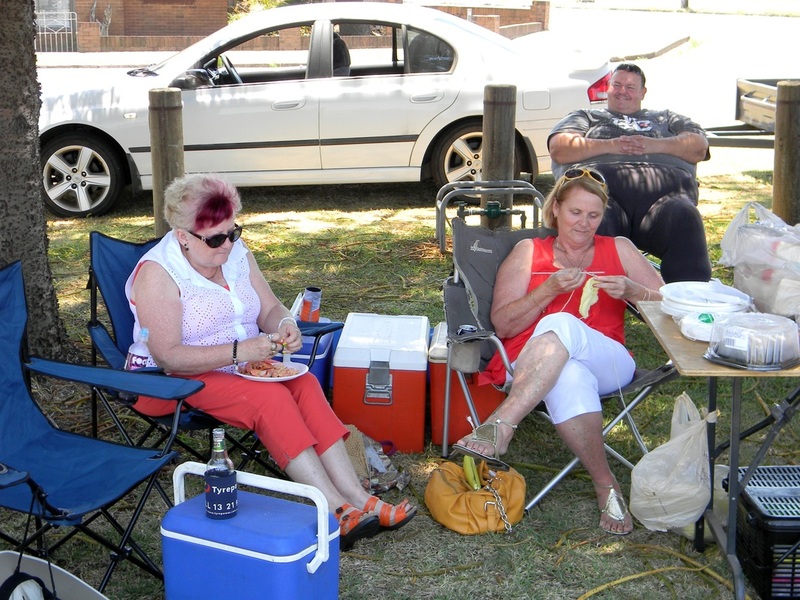 On Friday night they had snacks and drinks at the pub followed by breakfast the next morning. 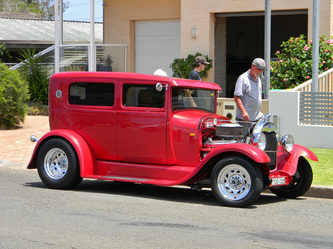 The rods were included in the street parade on Saturday morning which saw most of the towns residents come and cheer us along the main street. 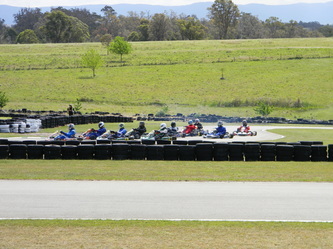 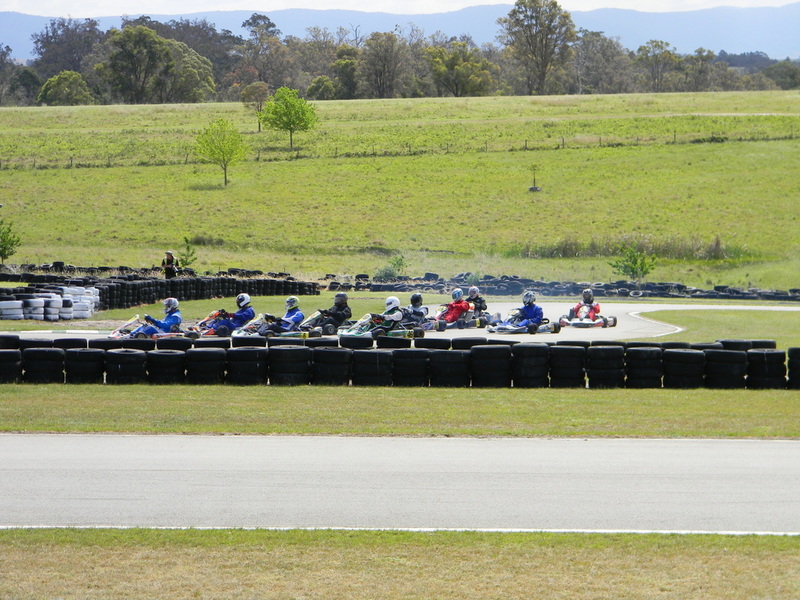 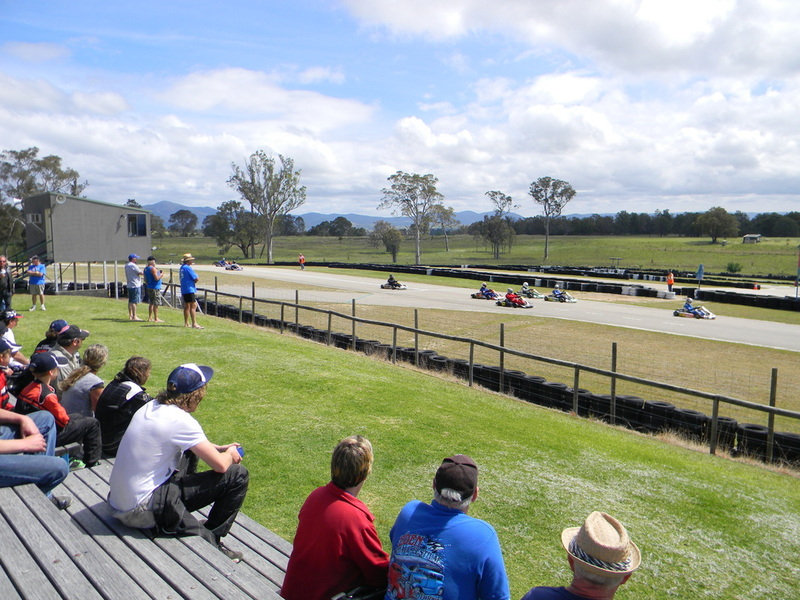 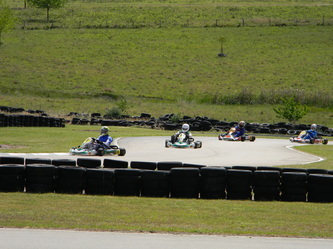 After lunch we had a cruise to the go cart races before heading back to the pub for dinner. 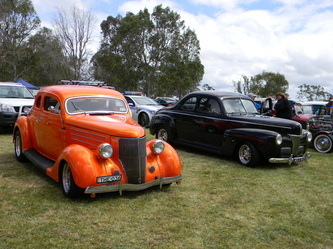 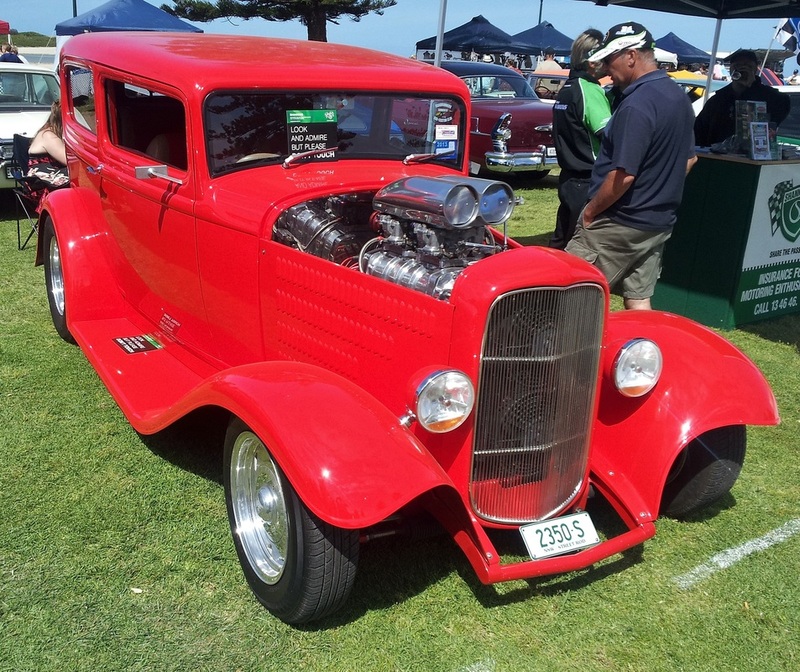 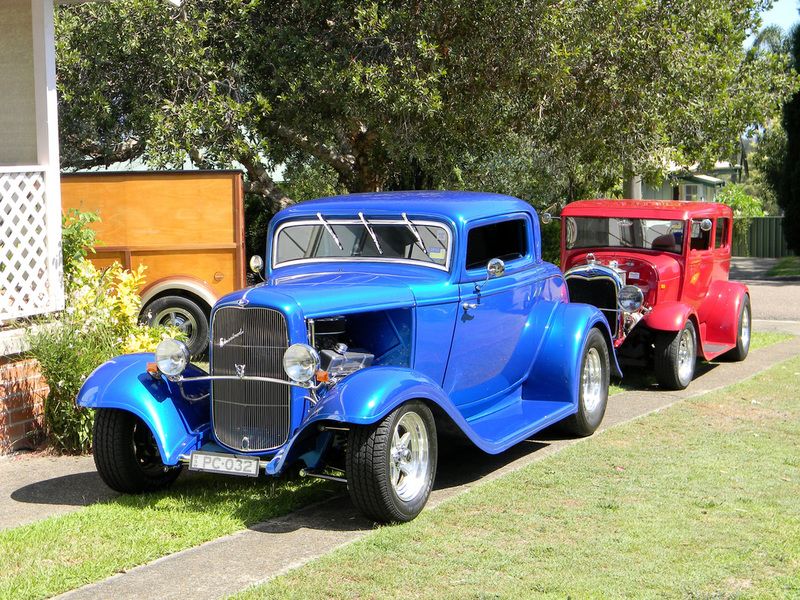 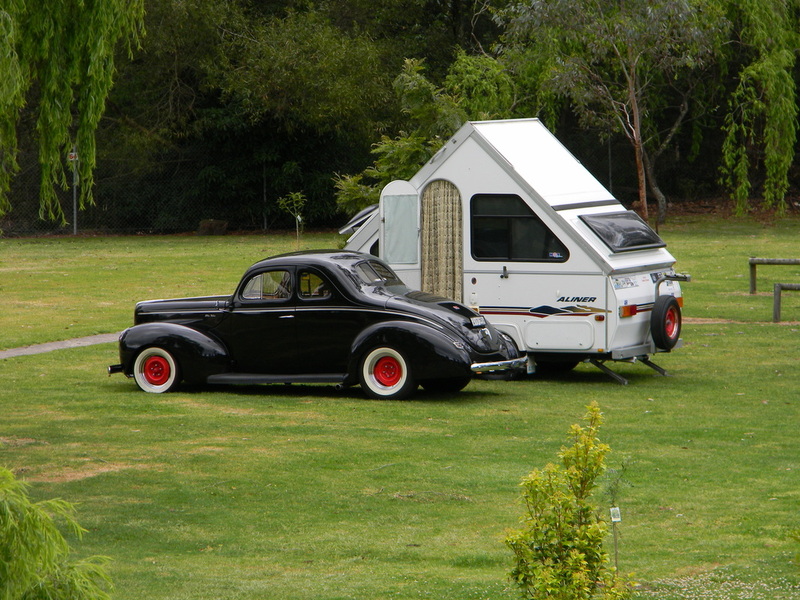 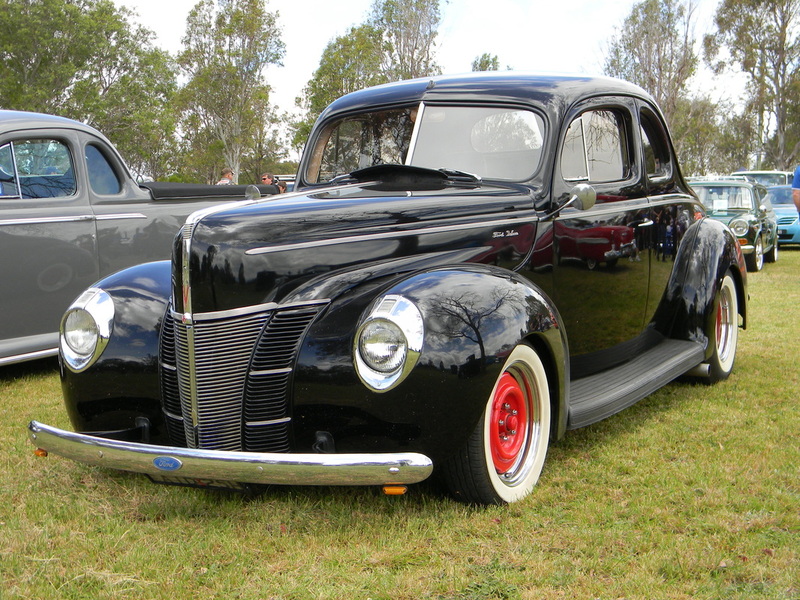 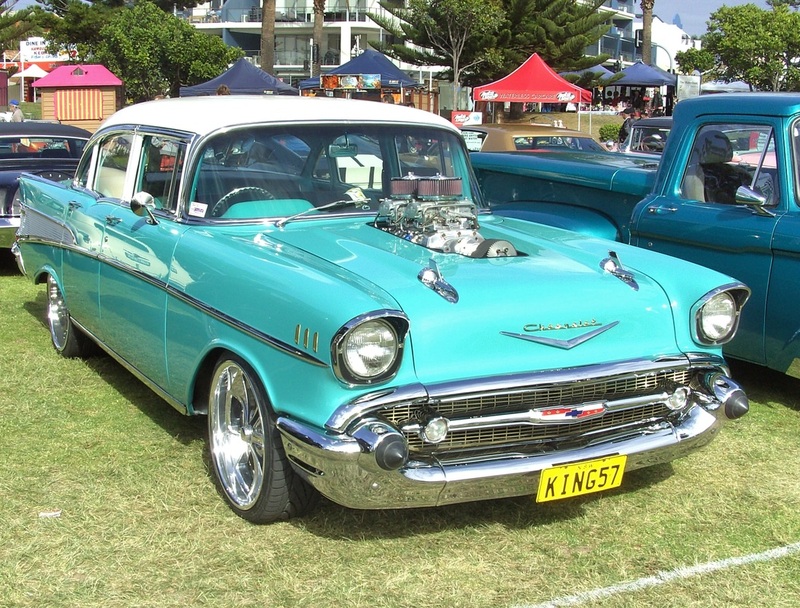 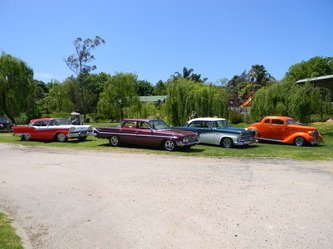 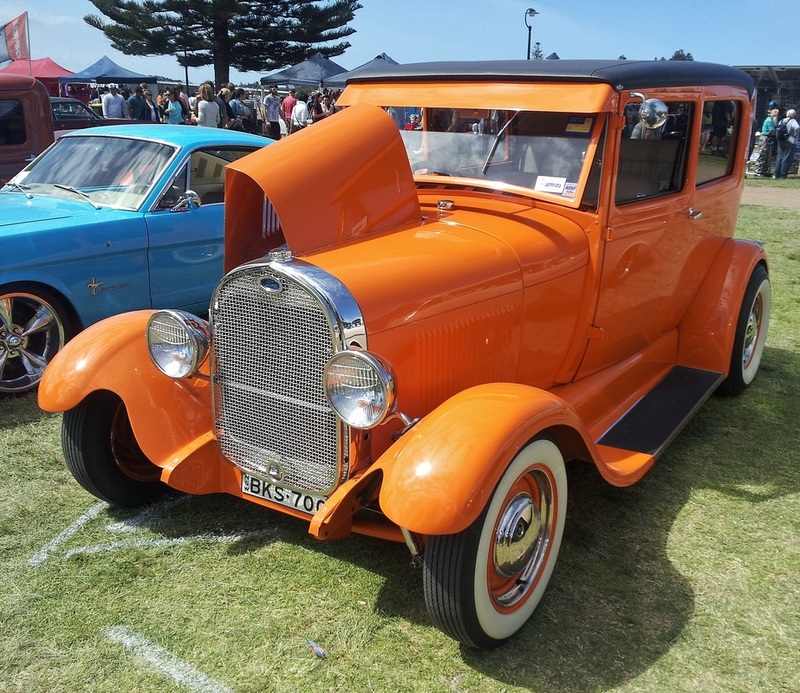 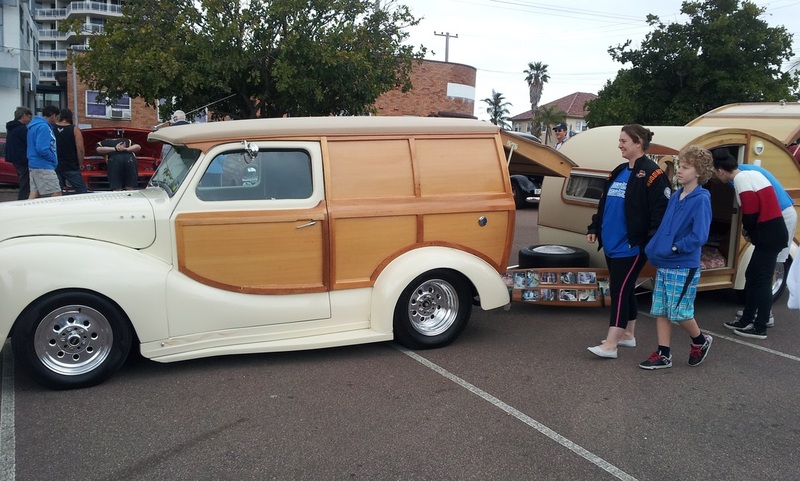 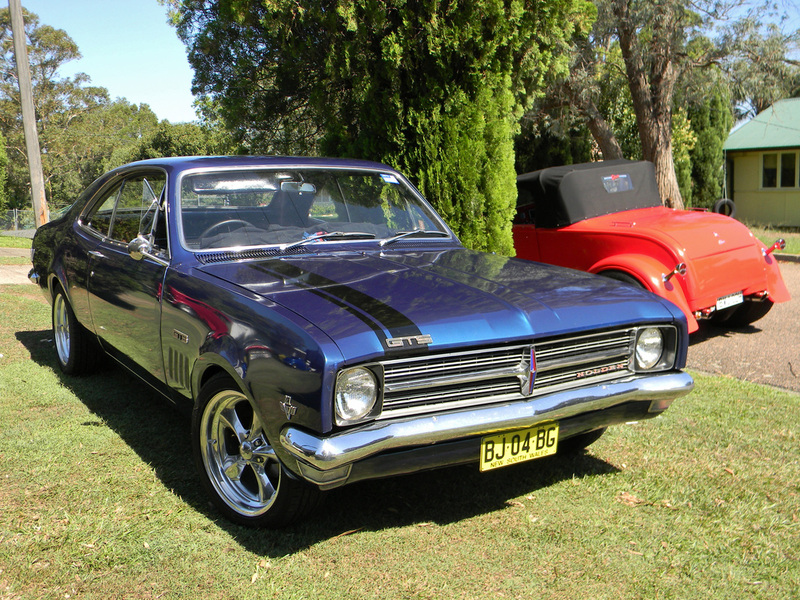 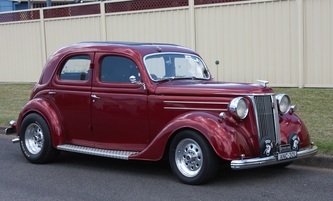 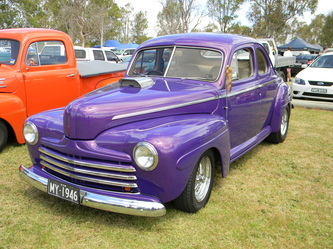 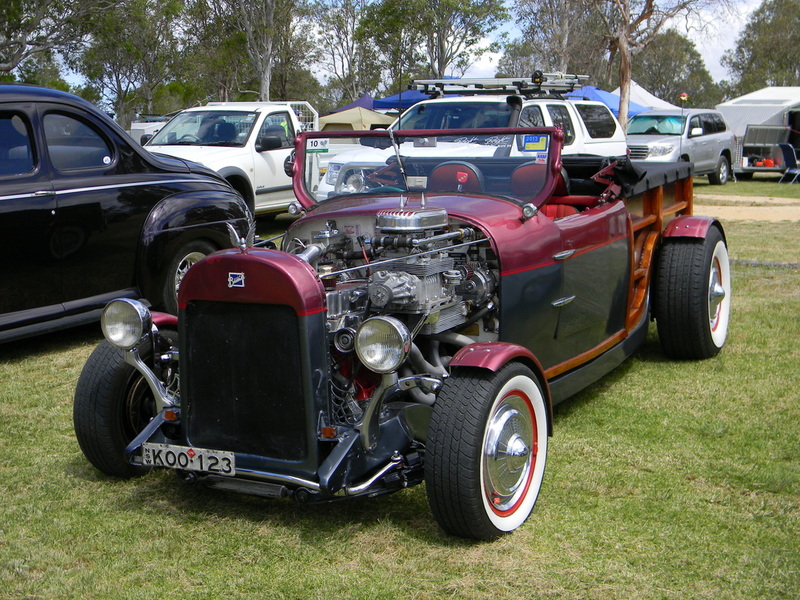 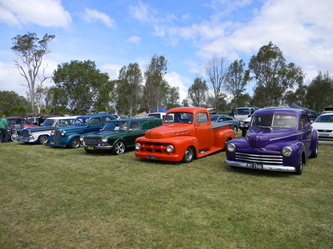 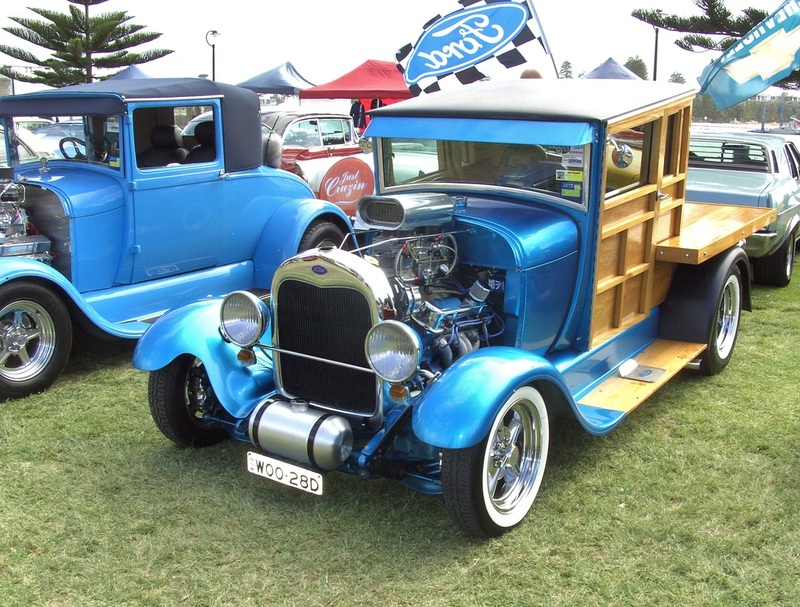 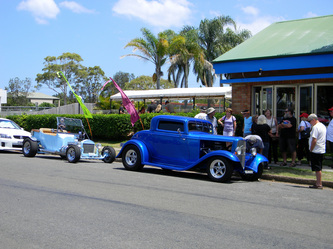 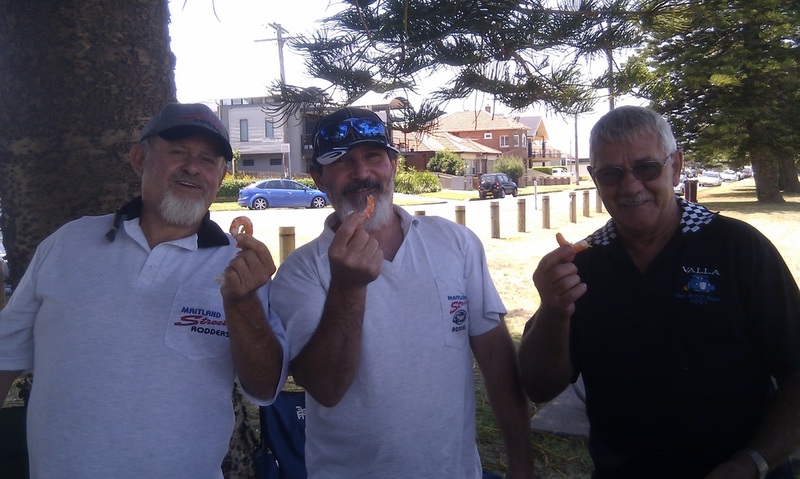 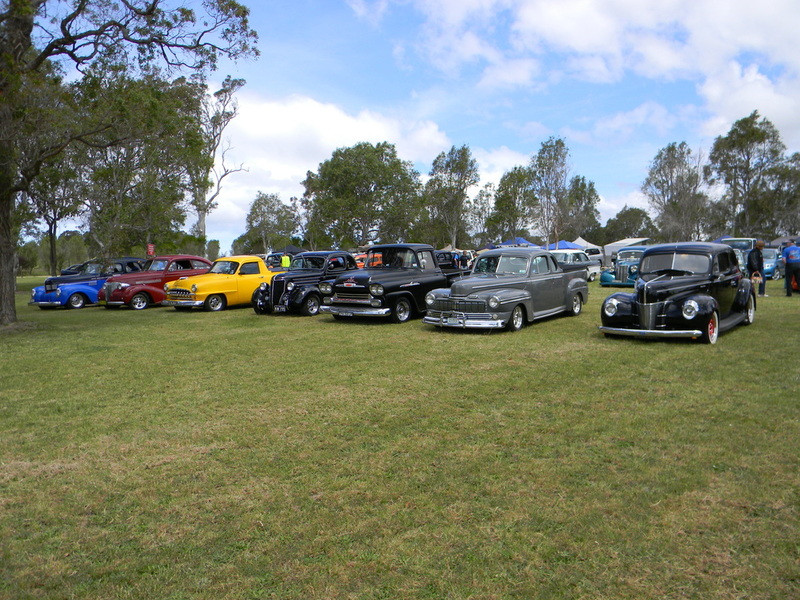 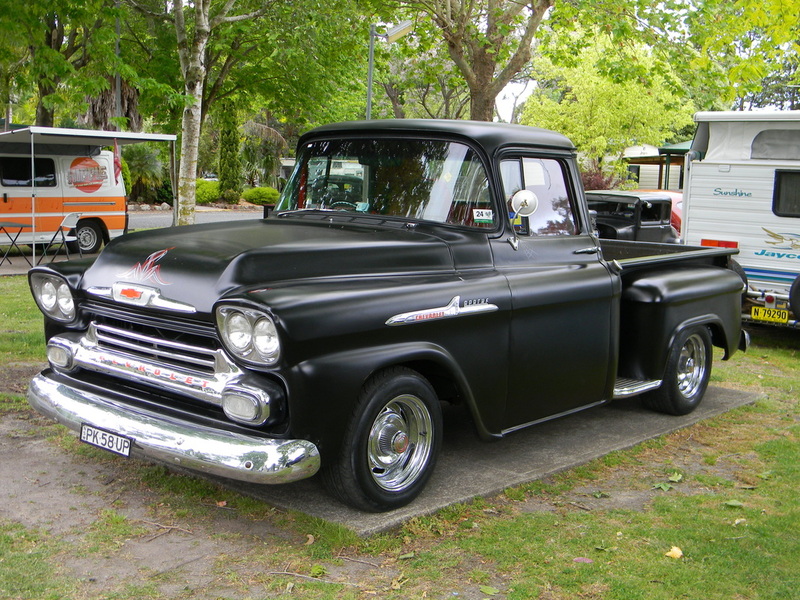 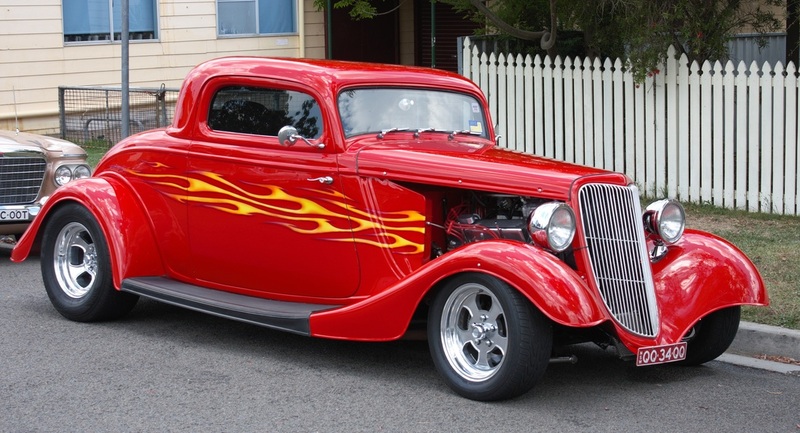 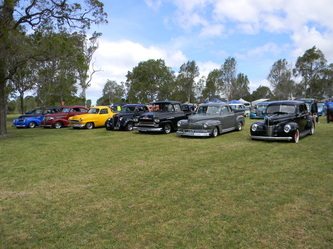 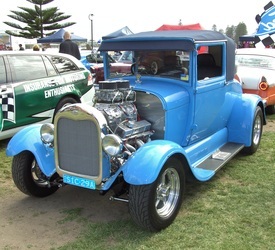 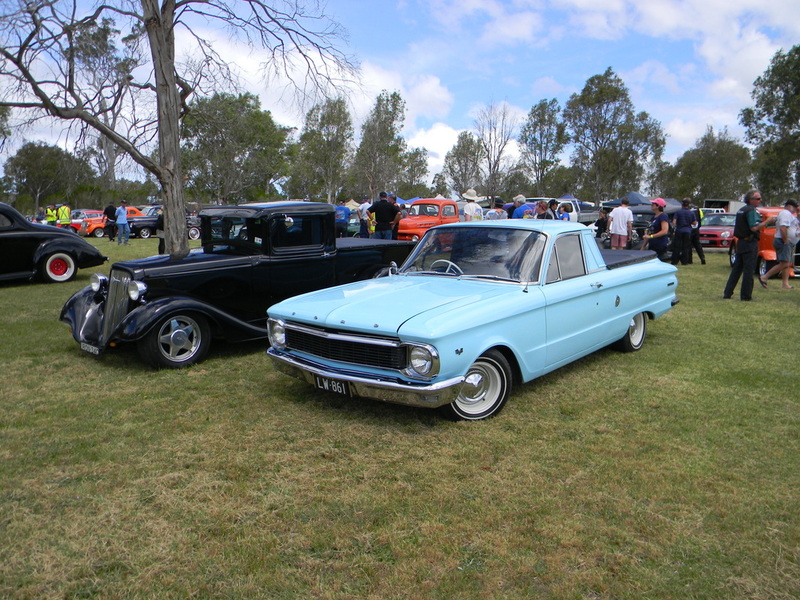 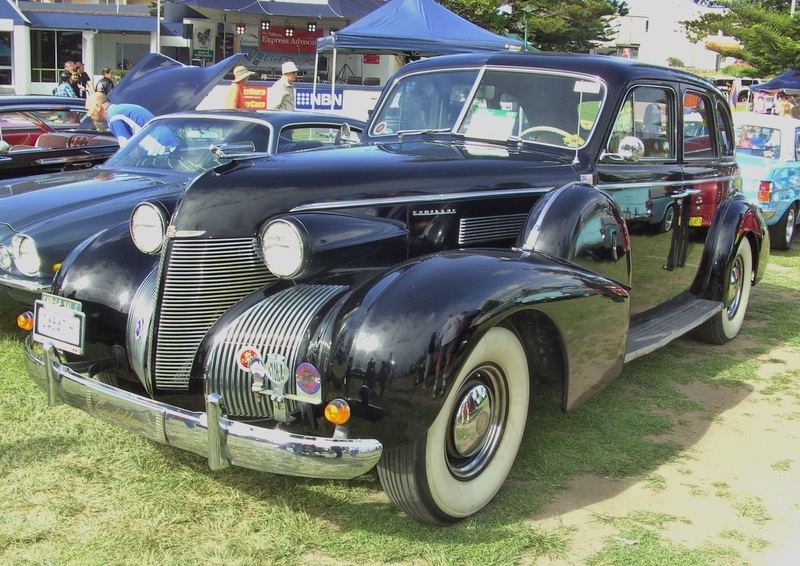 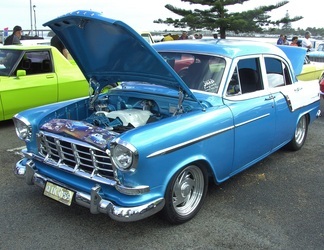 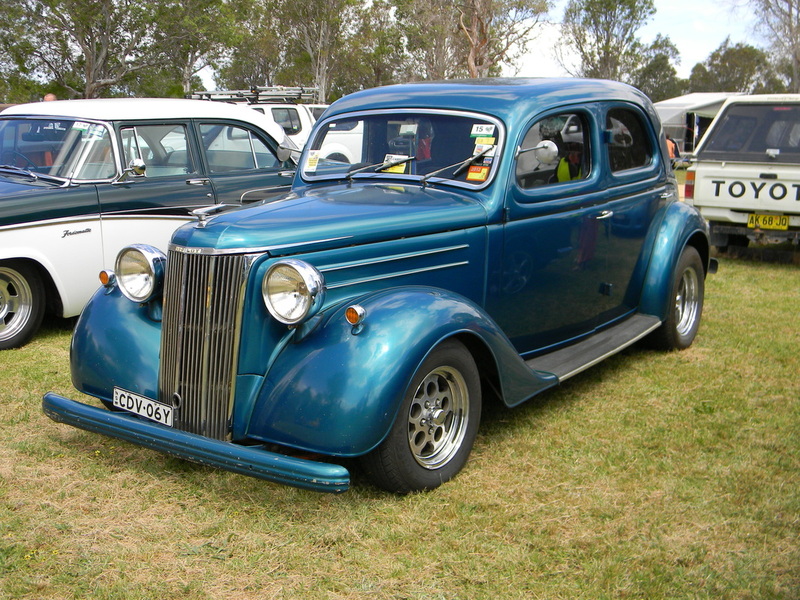 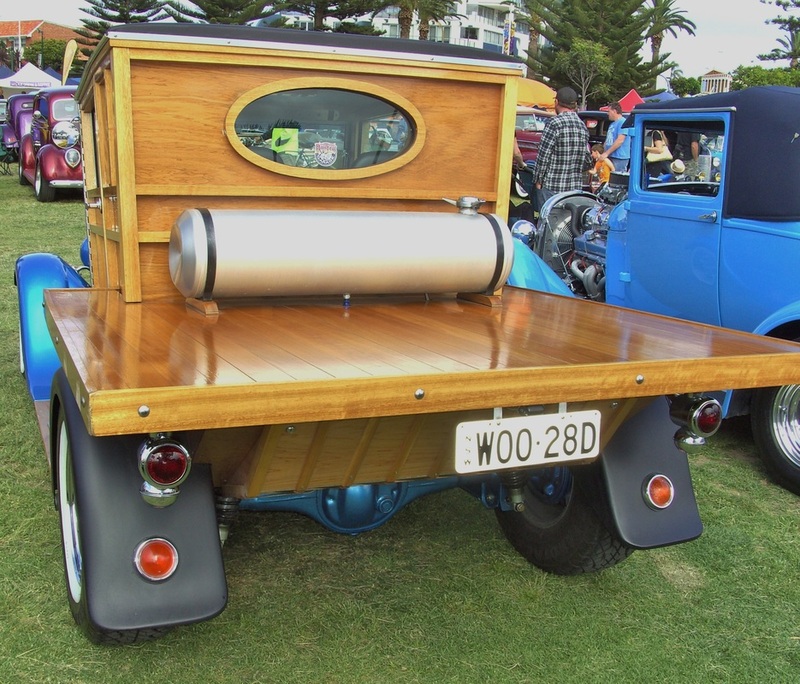 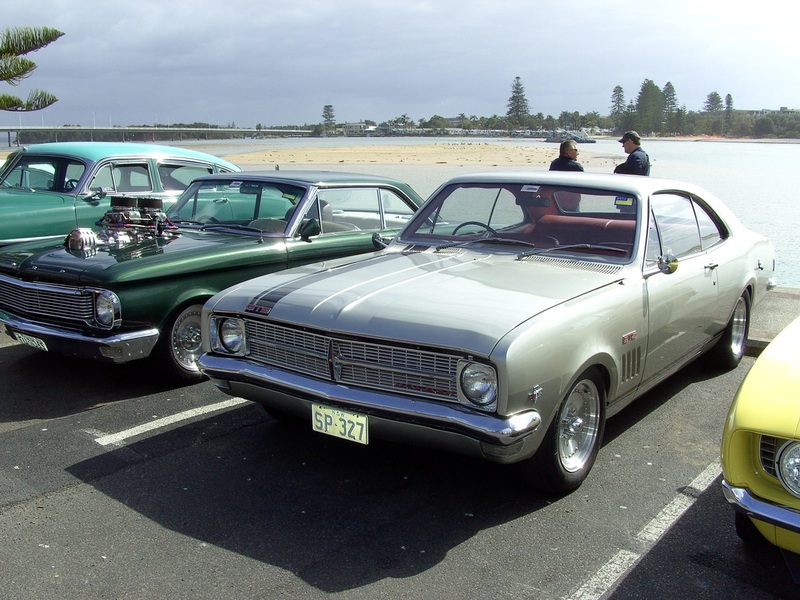 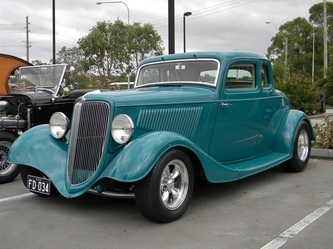 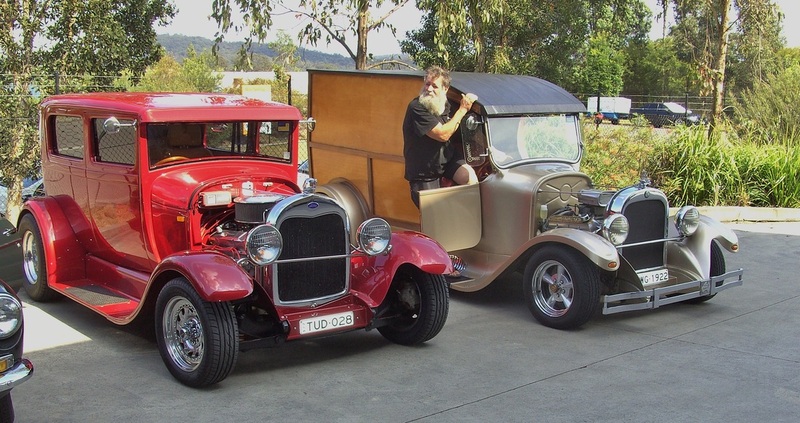 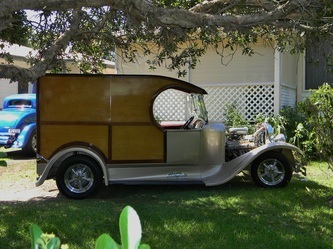 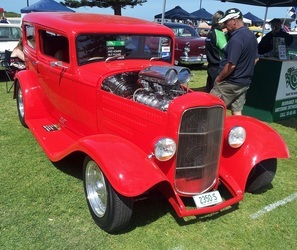 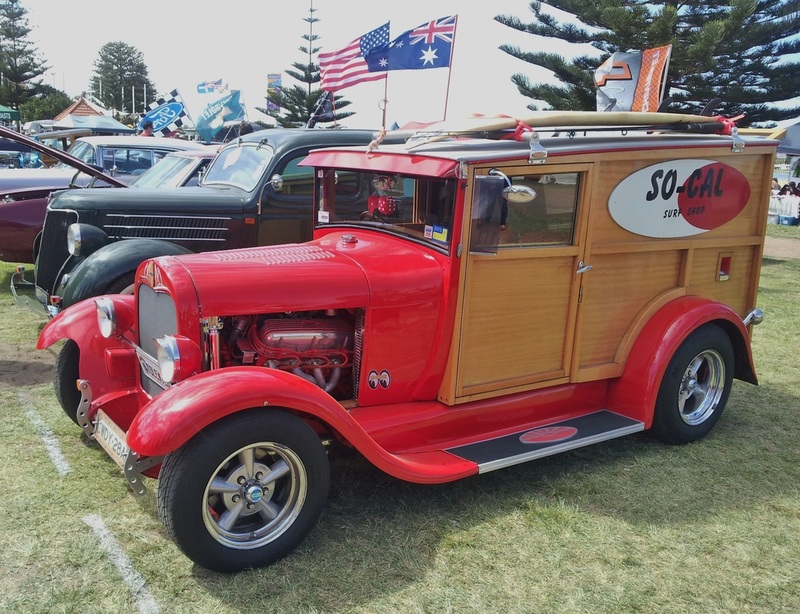 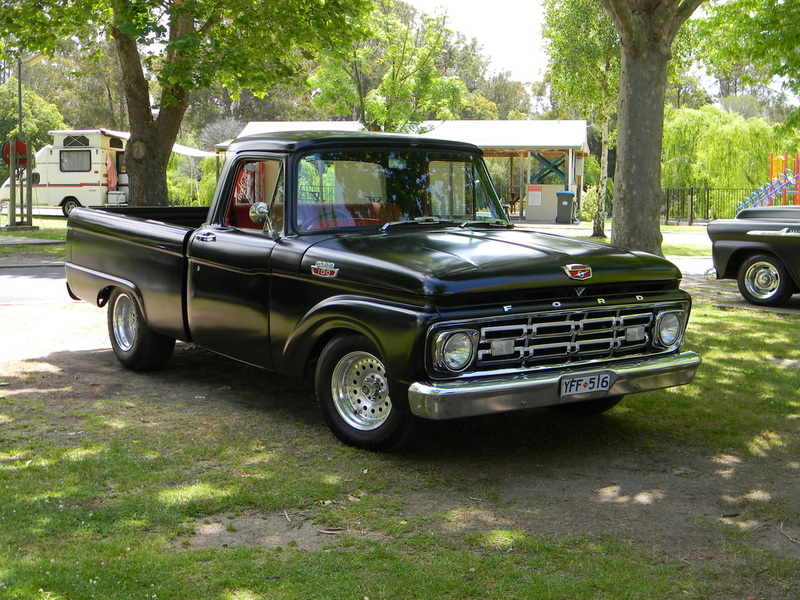 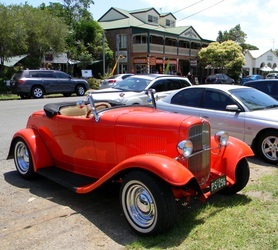 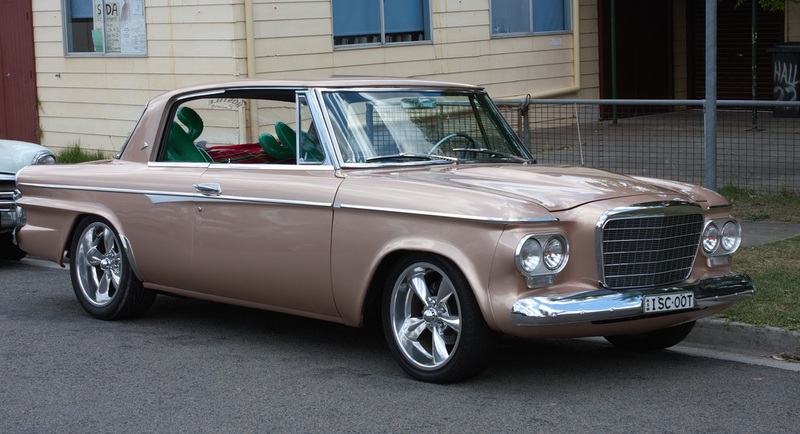 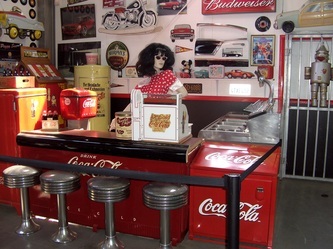 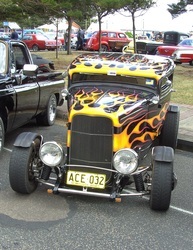 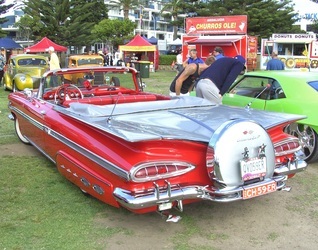 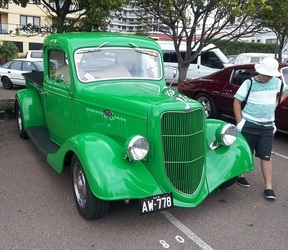 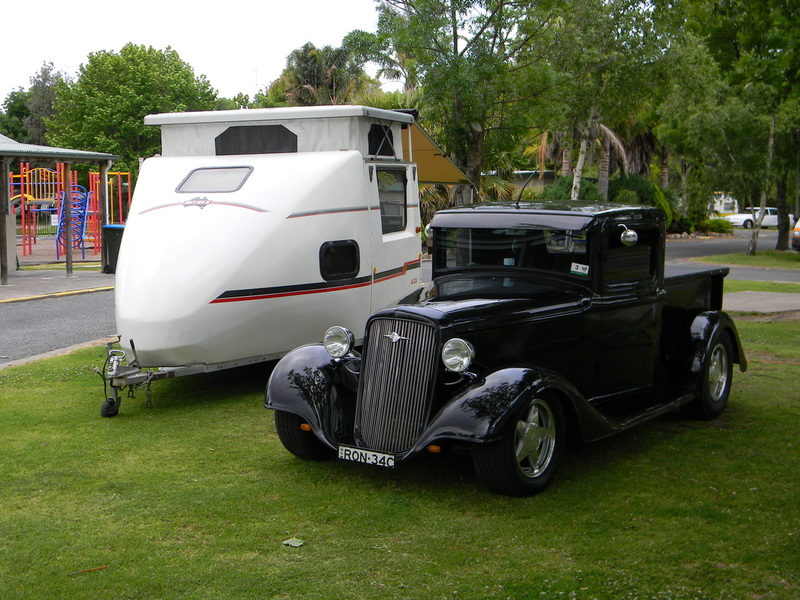 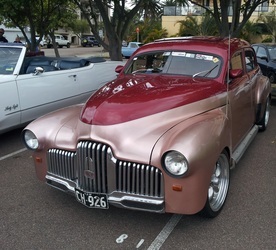 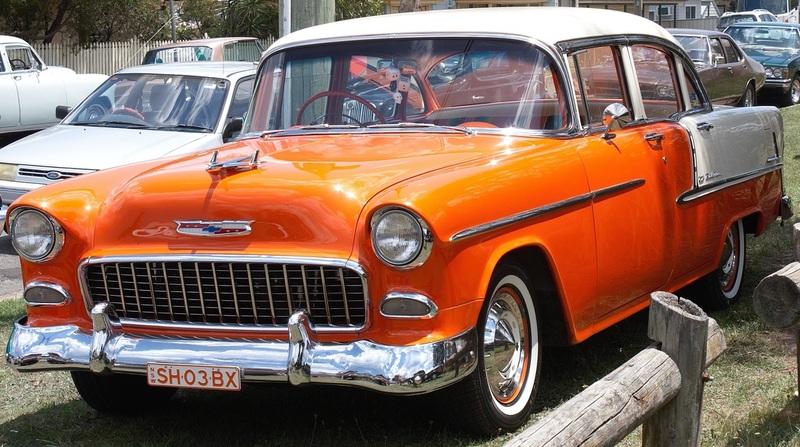 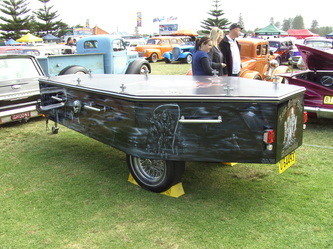 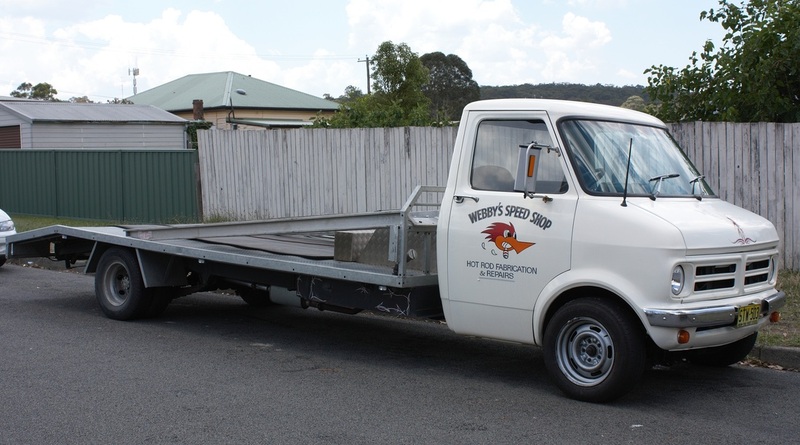 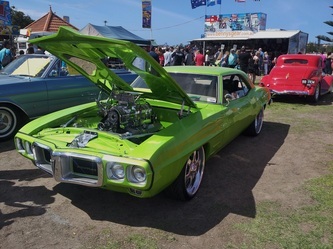 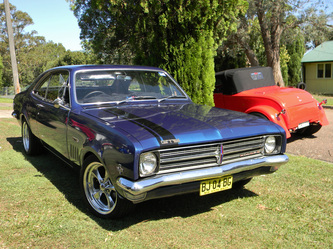 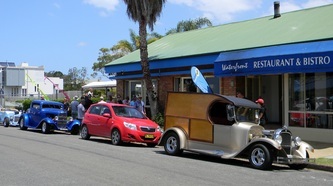 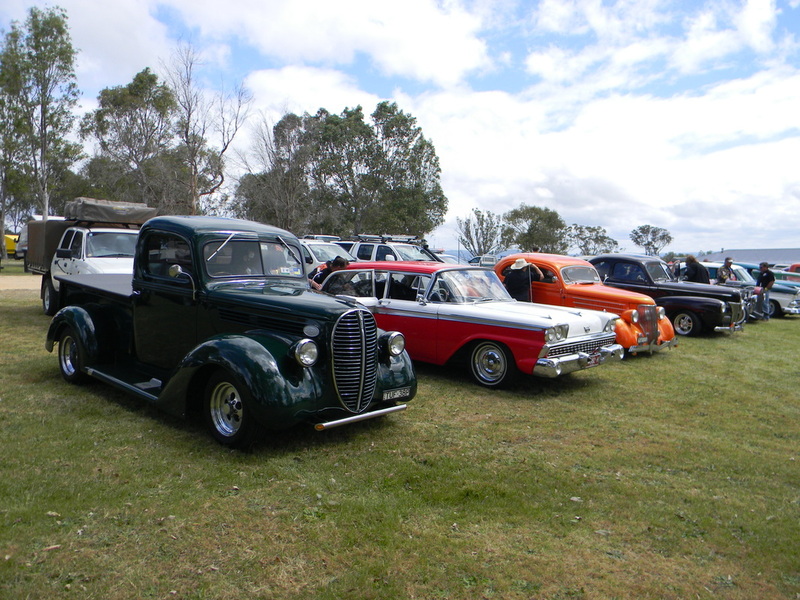 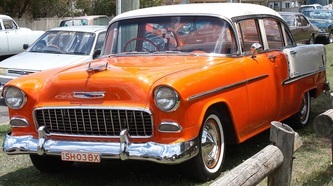 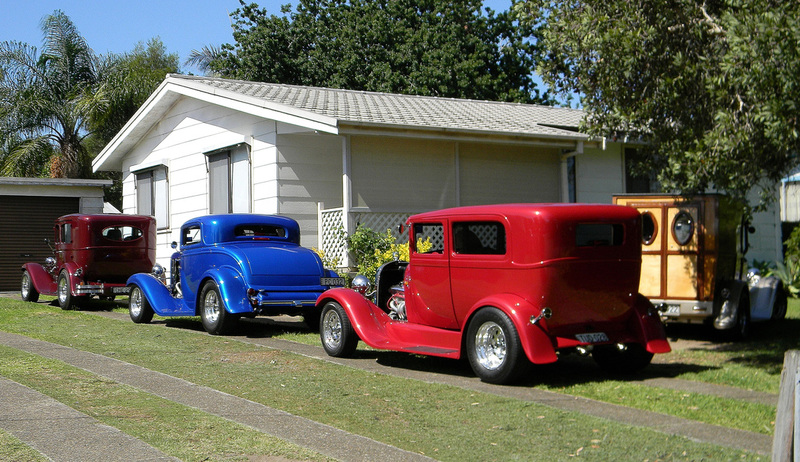 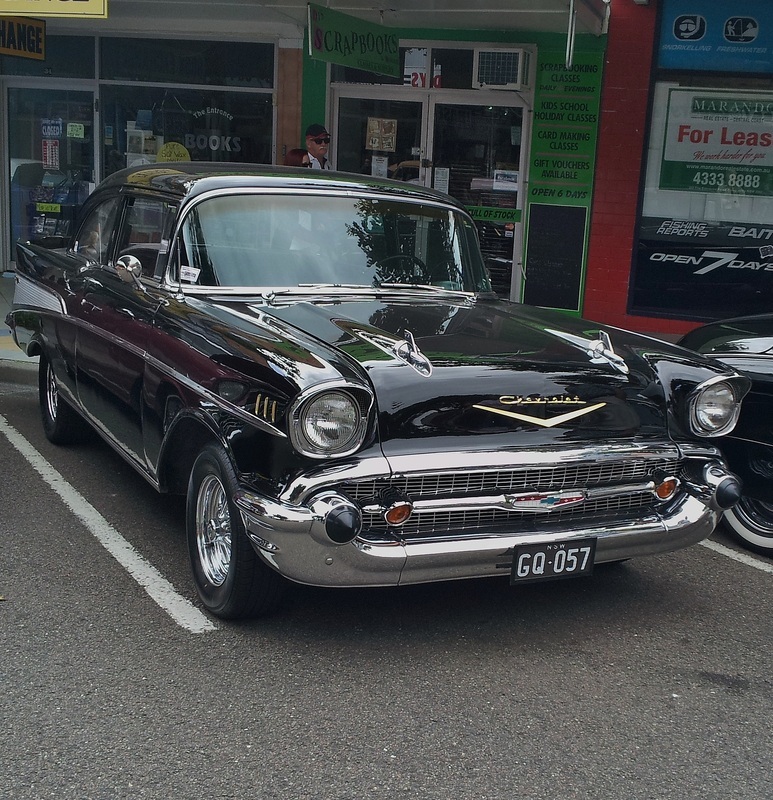 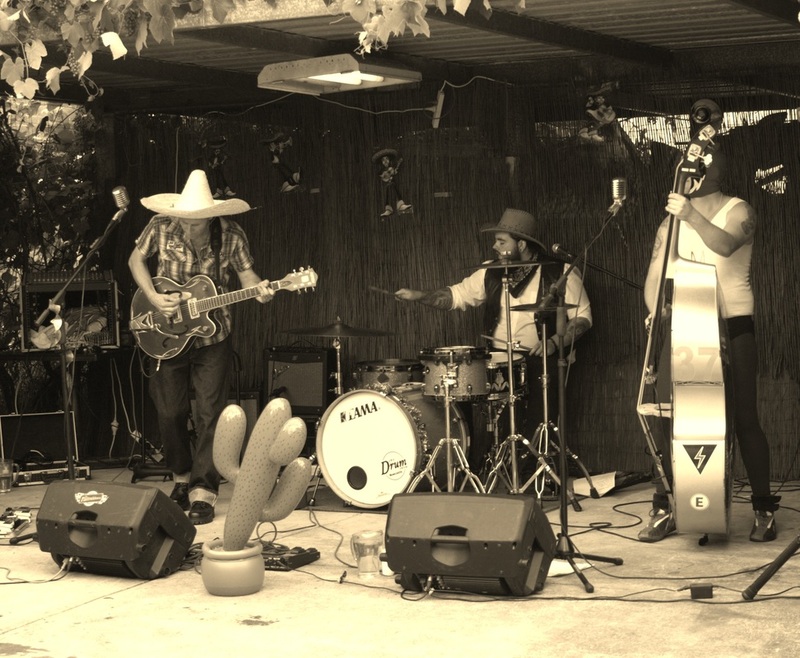 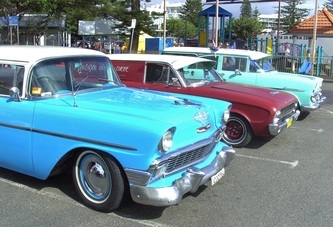 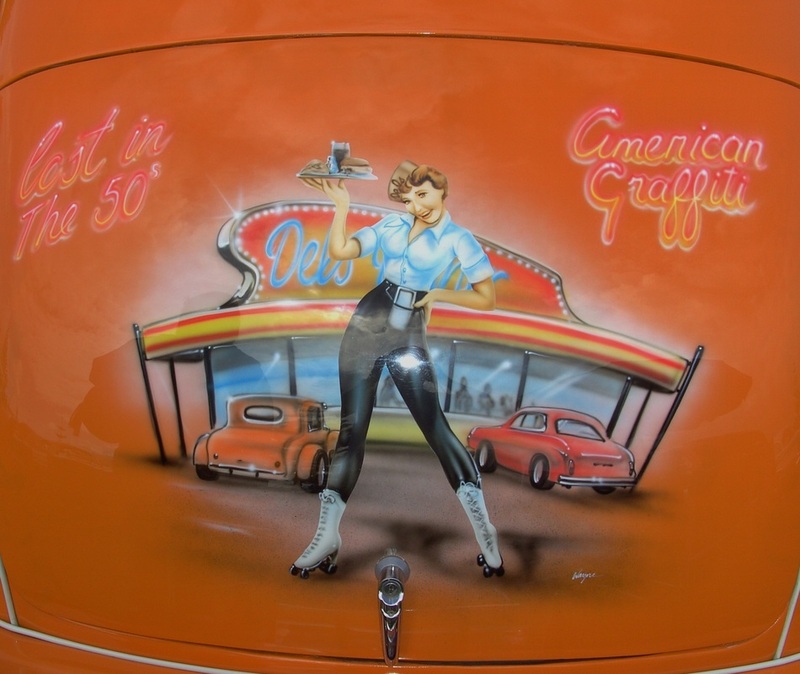 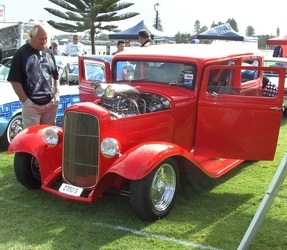 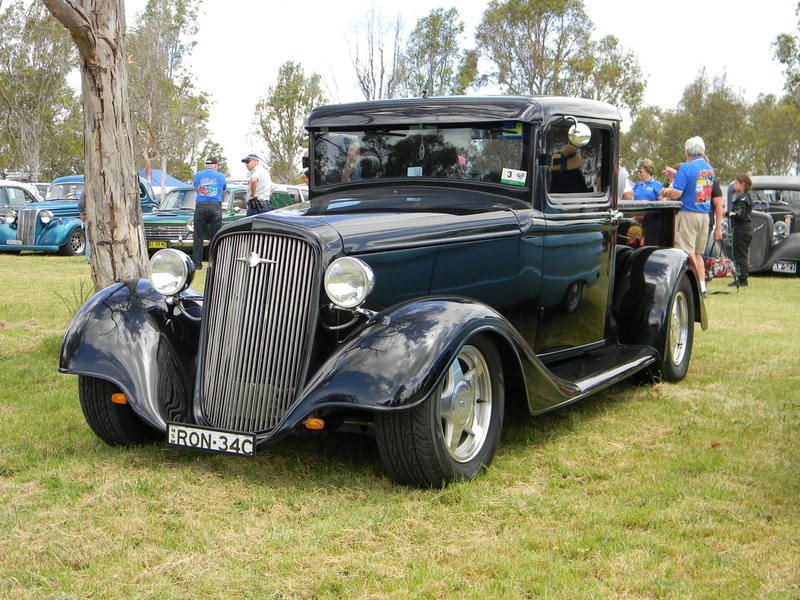 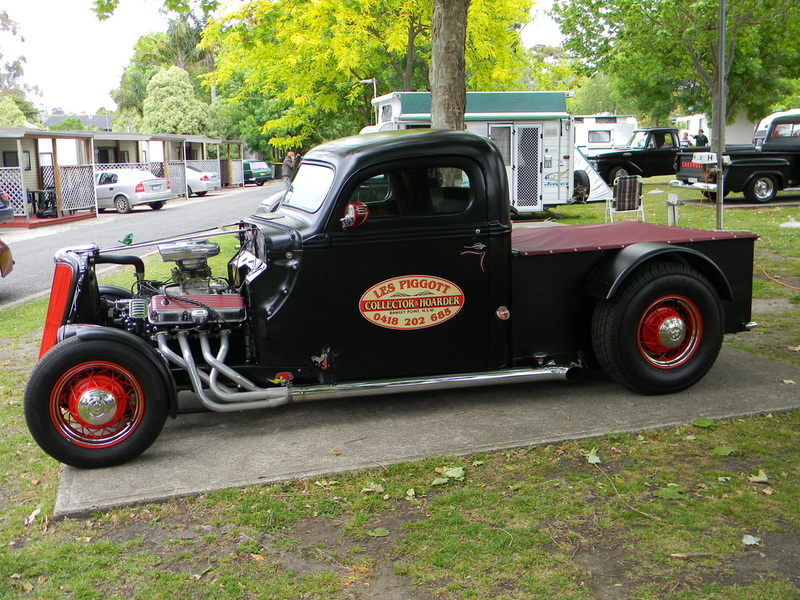 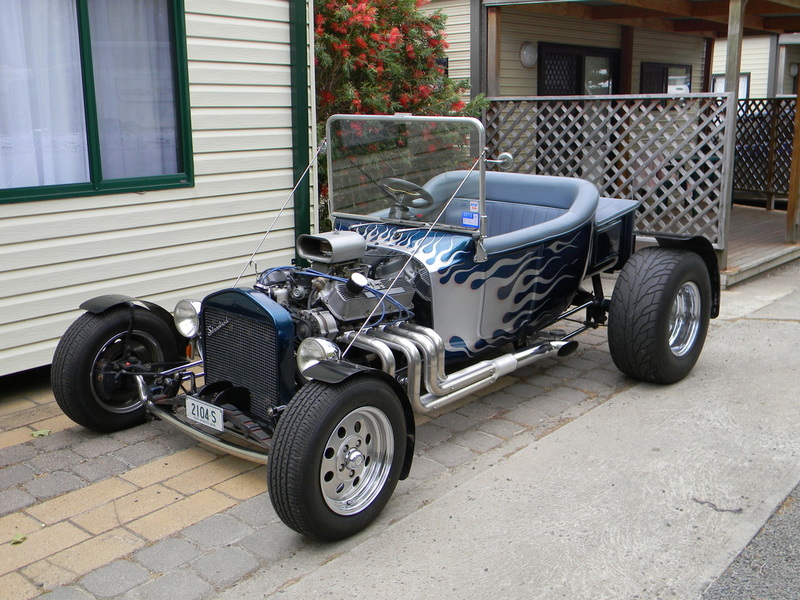 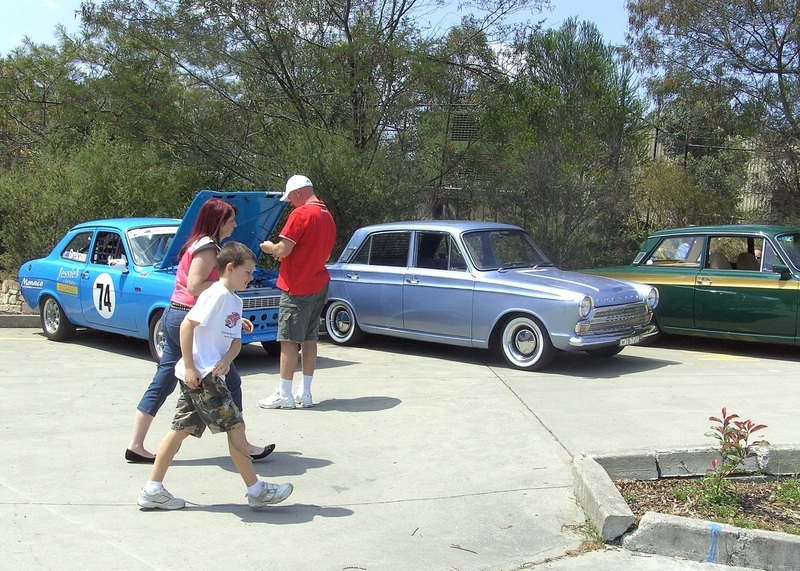 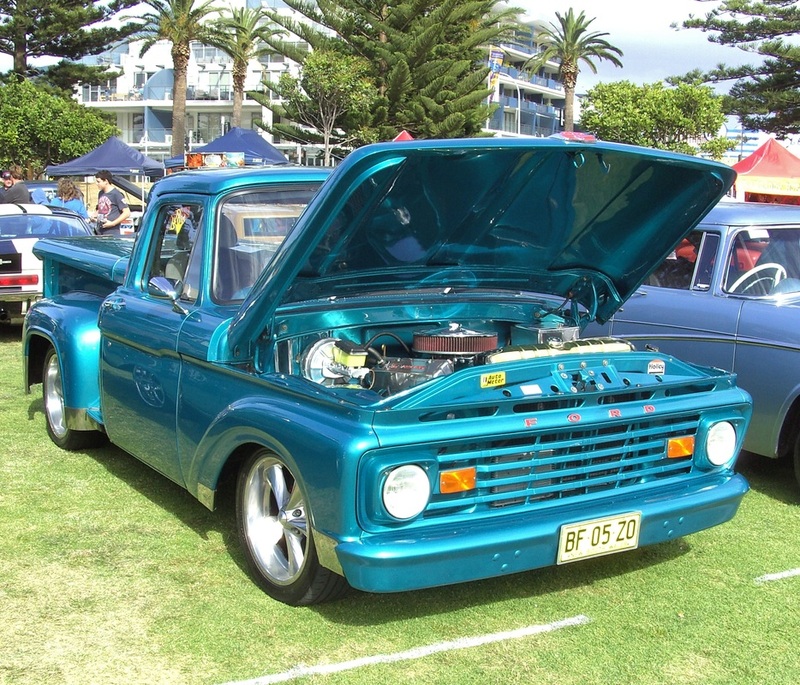 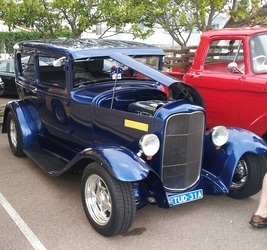 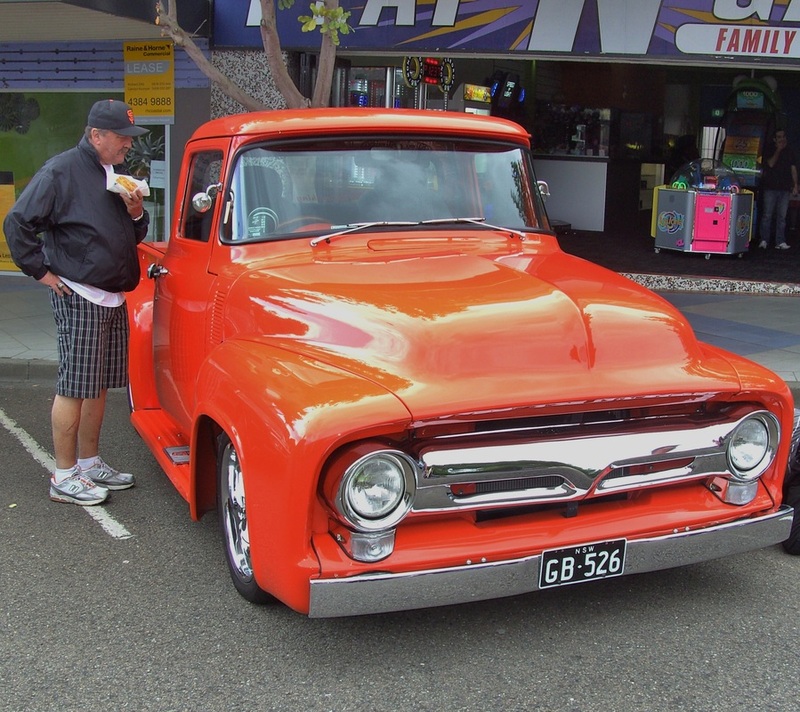 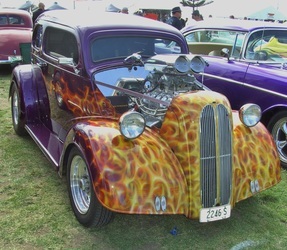 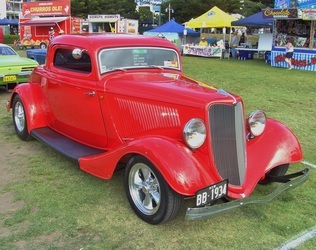 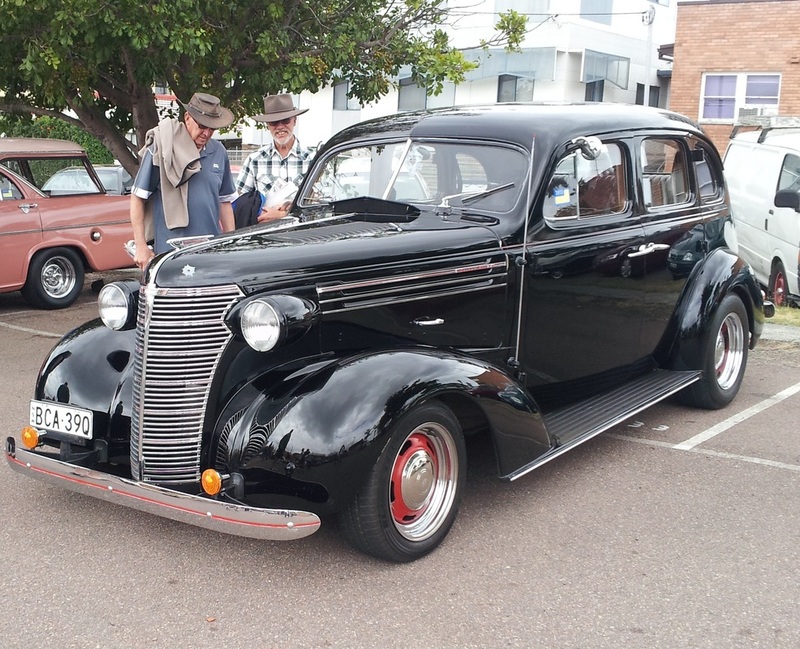 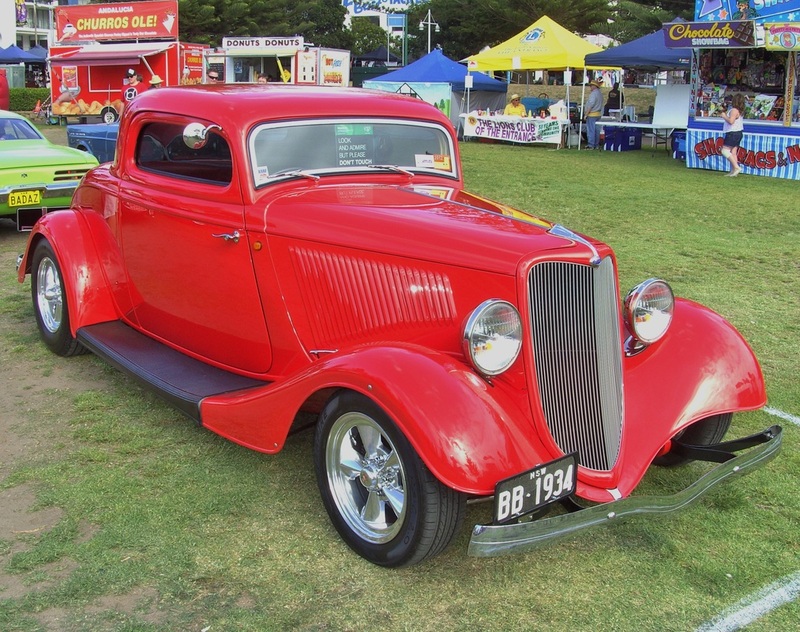 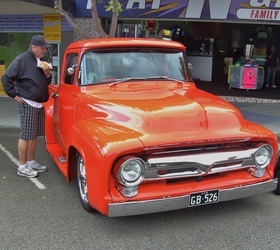 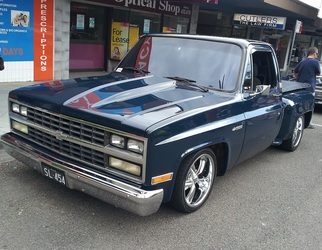 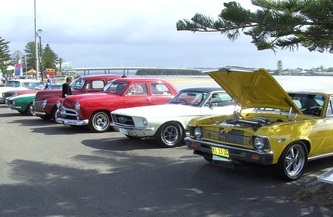 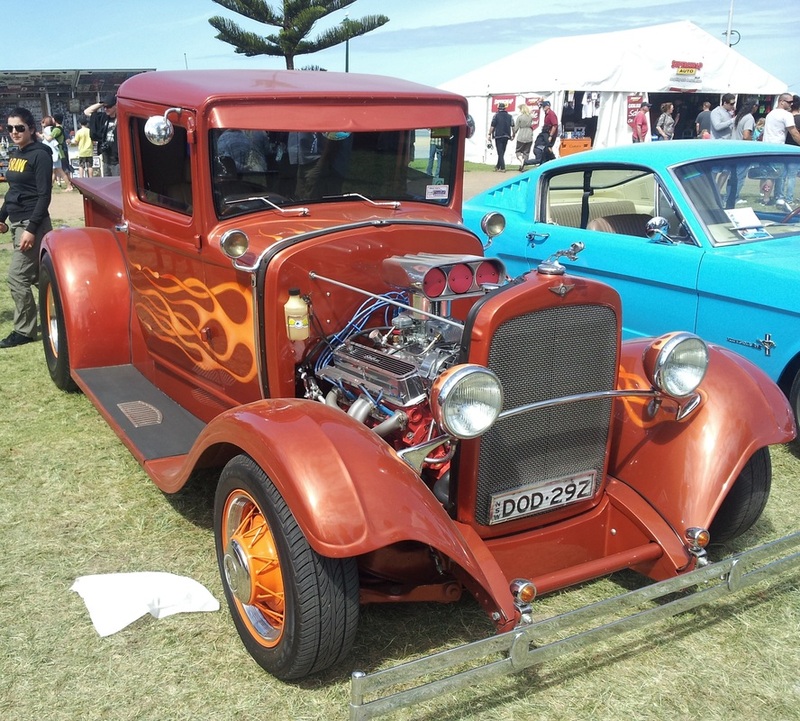 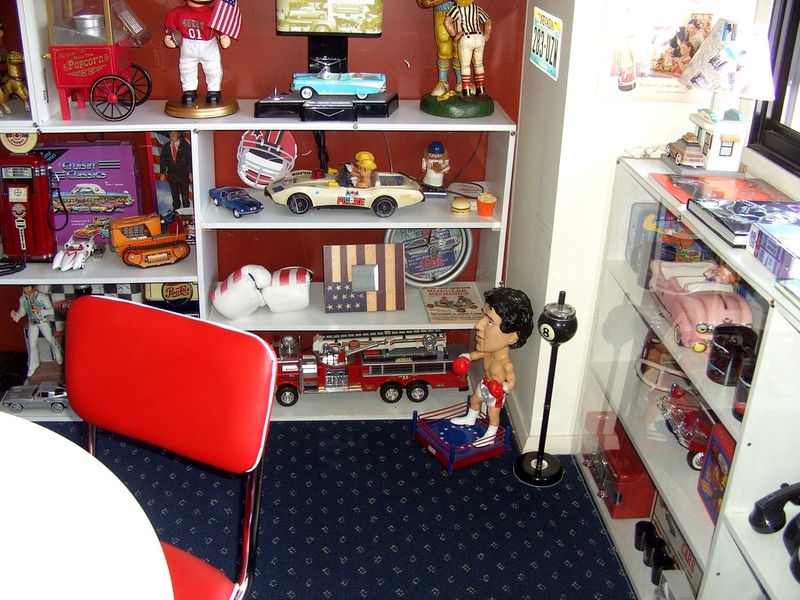 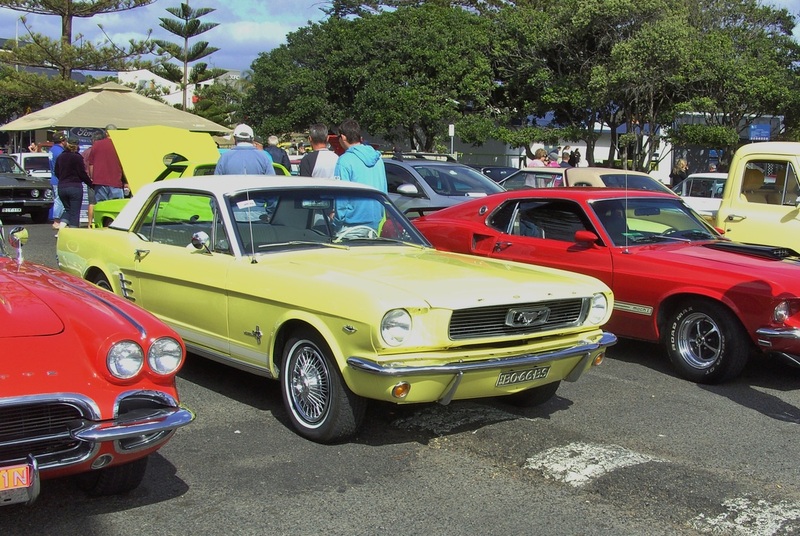 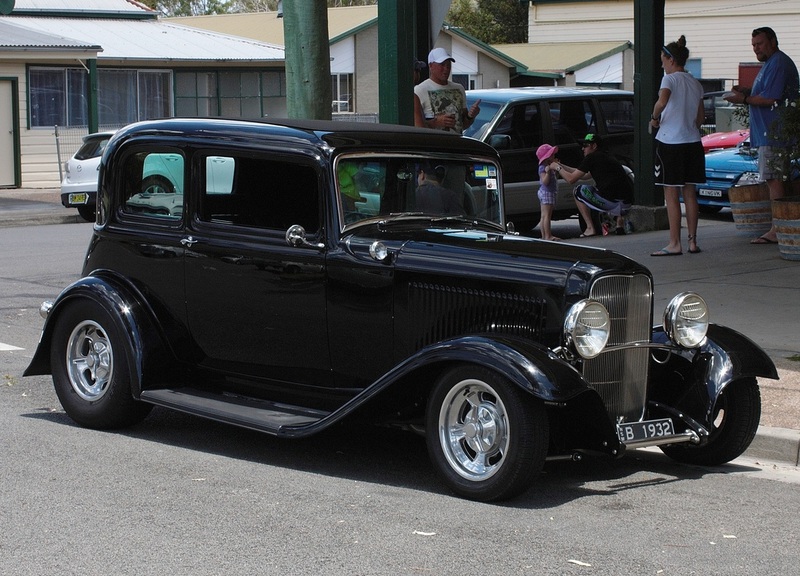 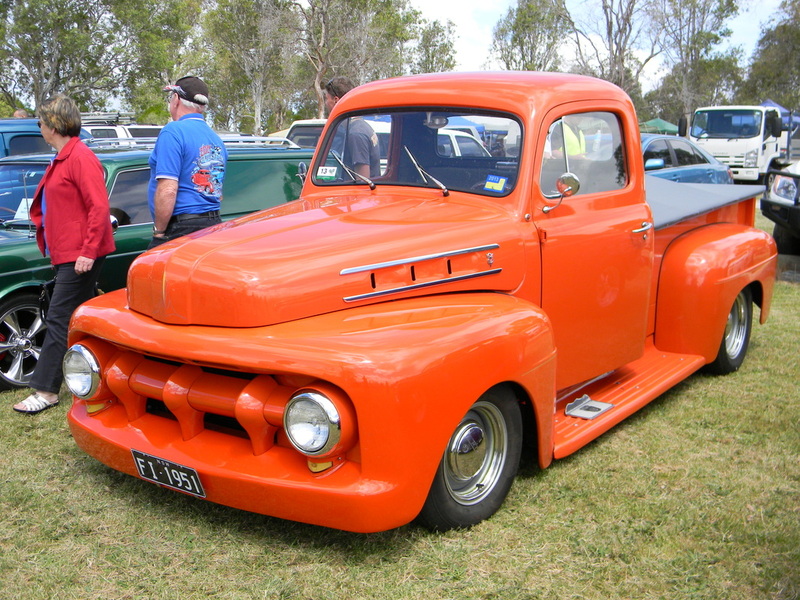 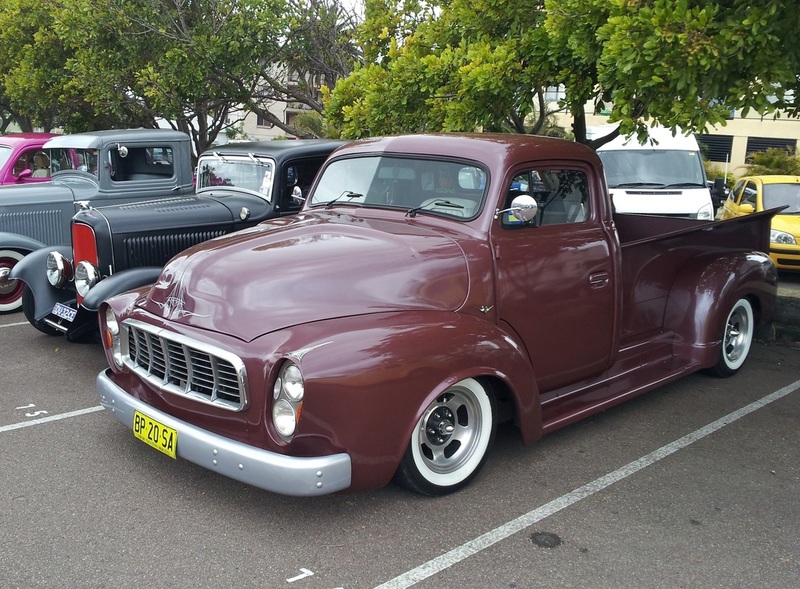 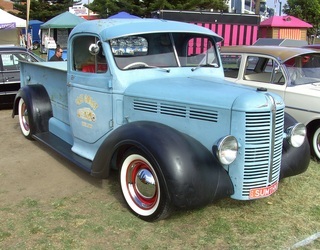 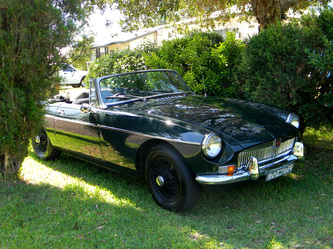 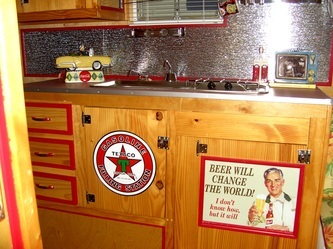 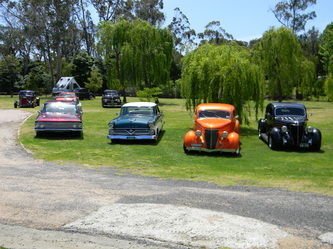 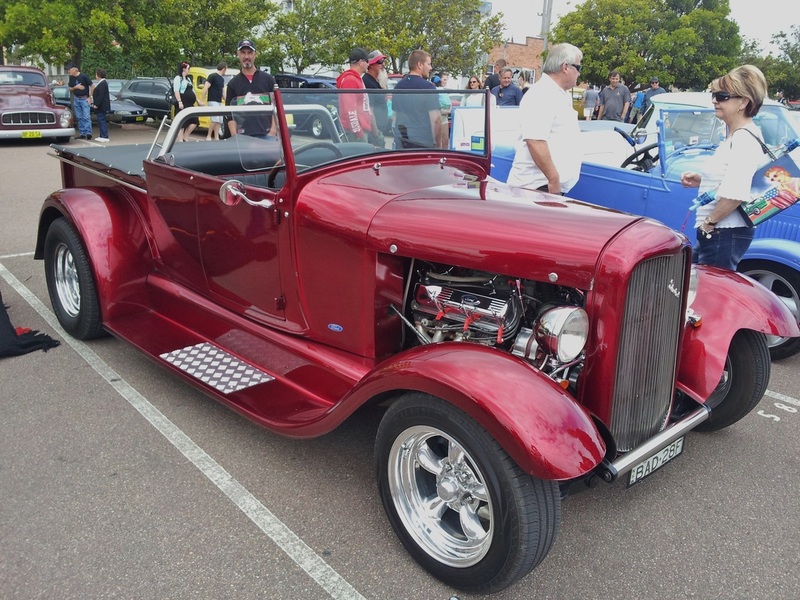 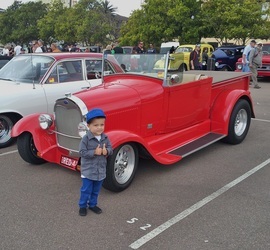 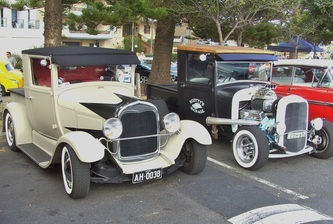 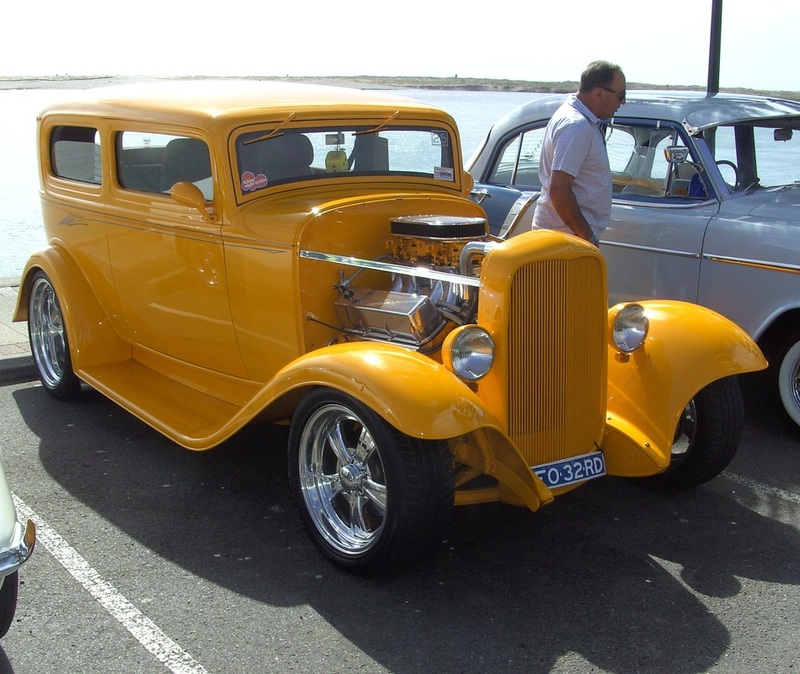 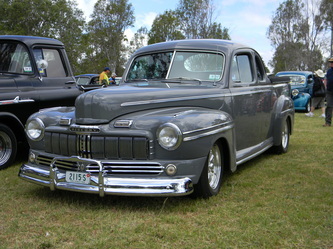 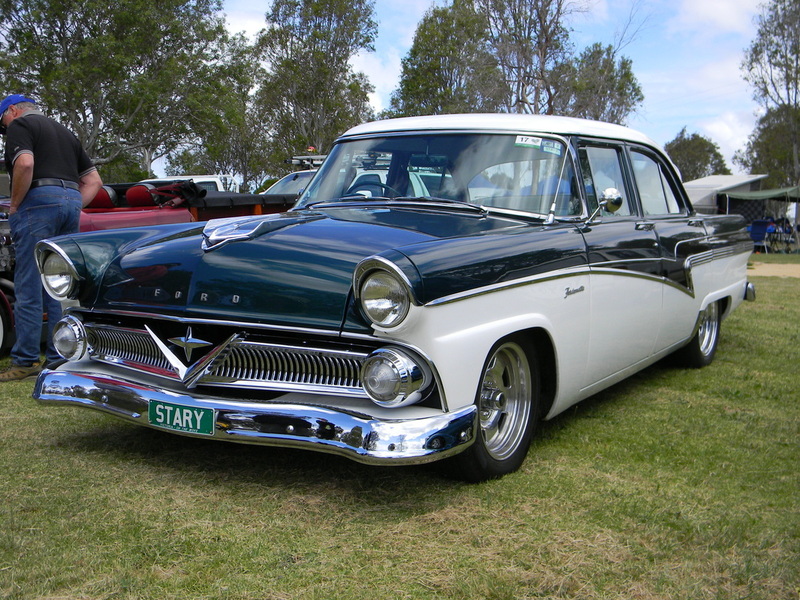 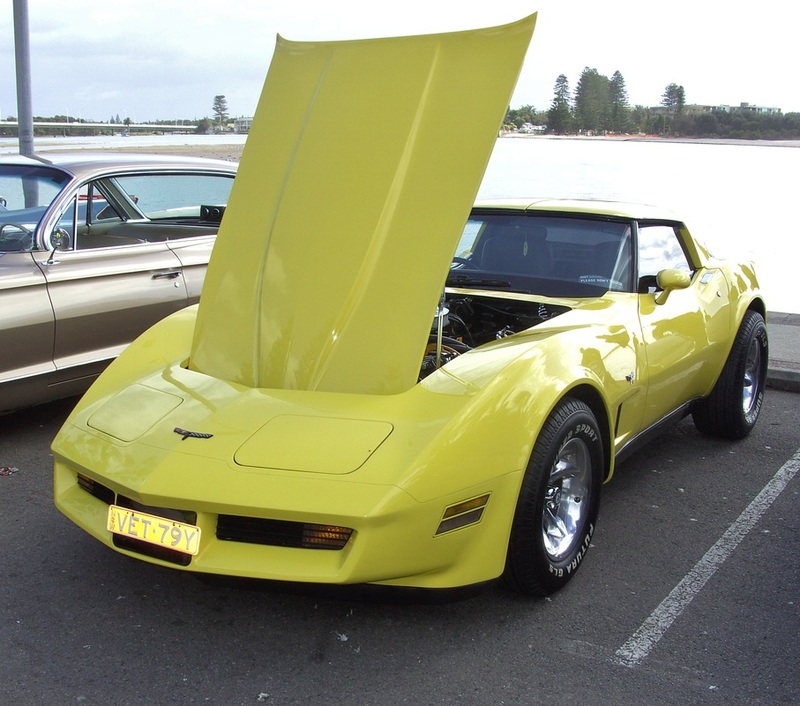 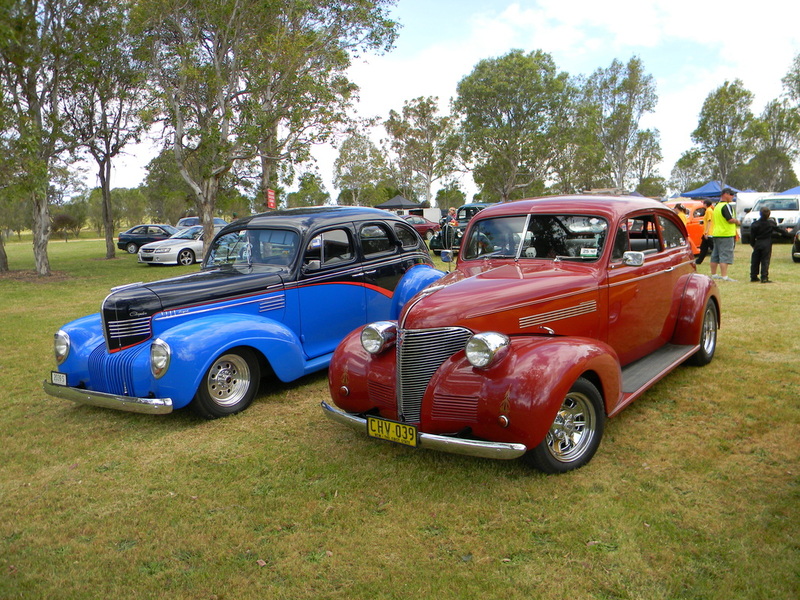 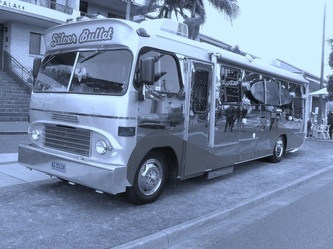 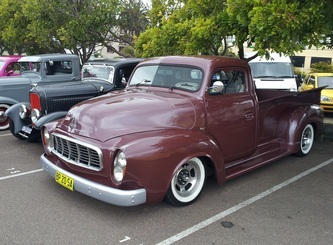 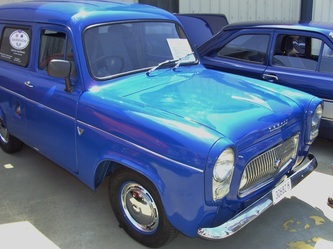 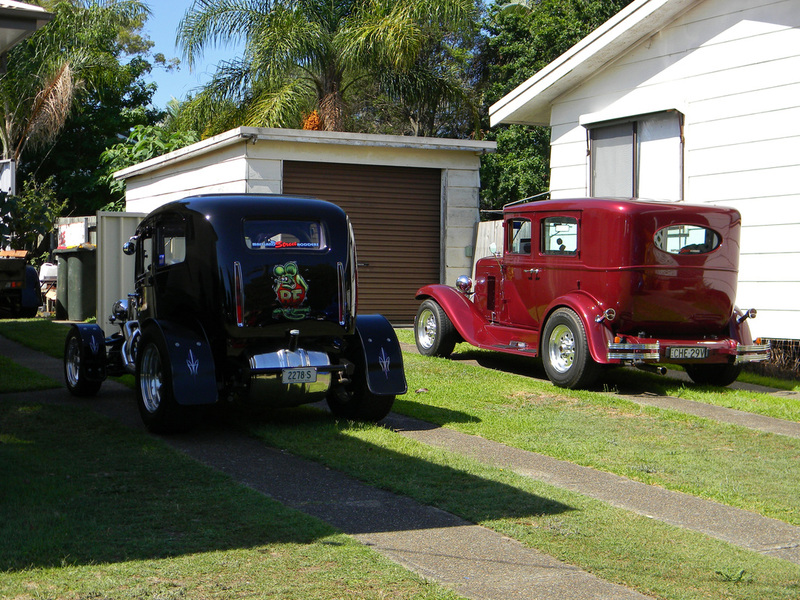 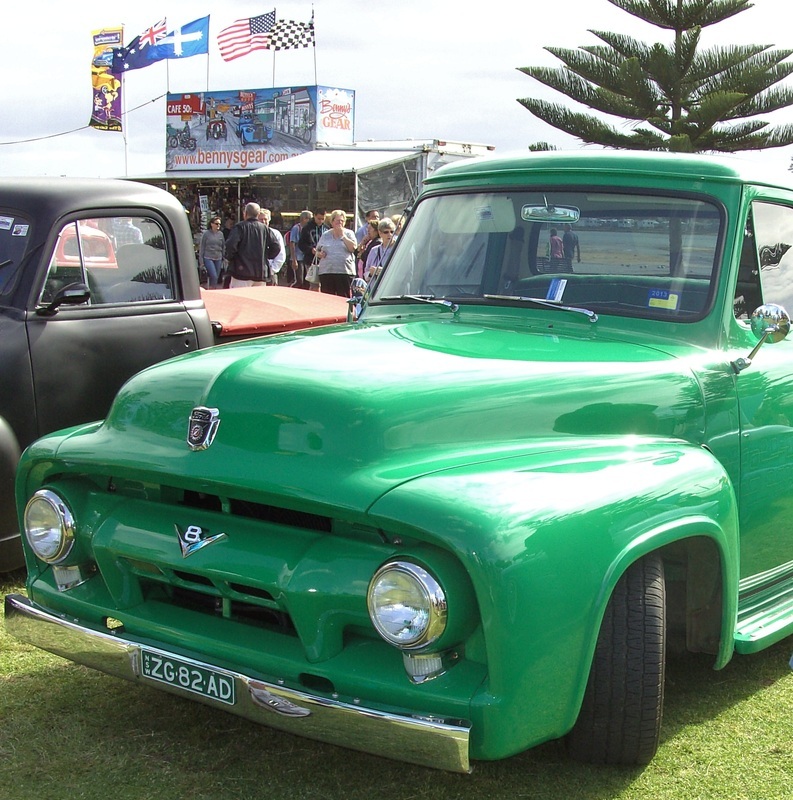 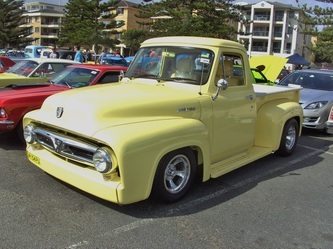 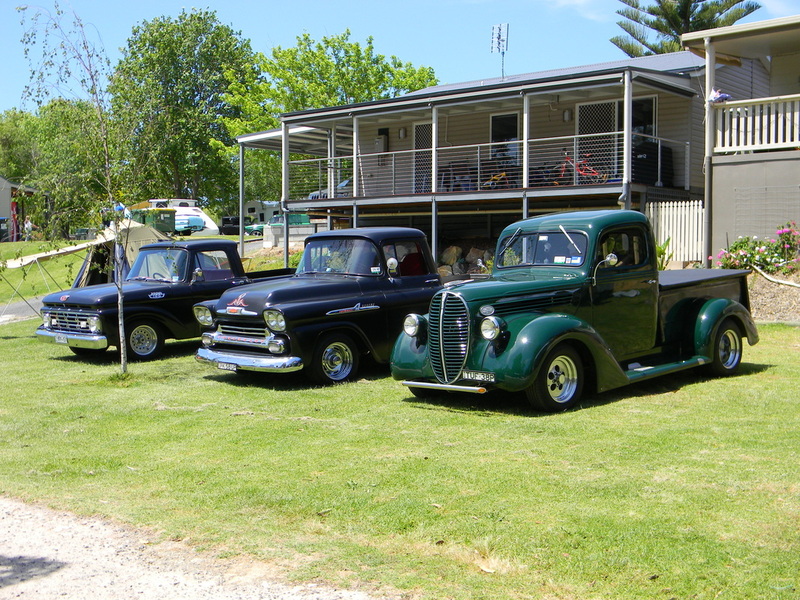 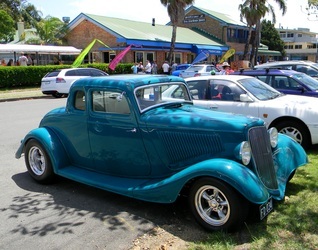 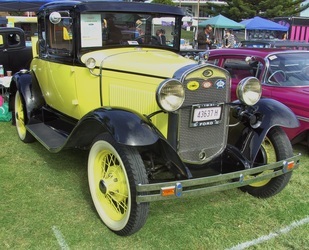 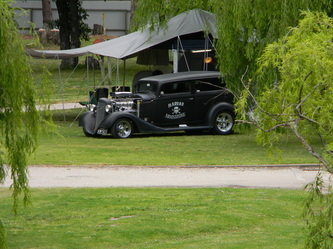 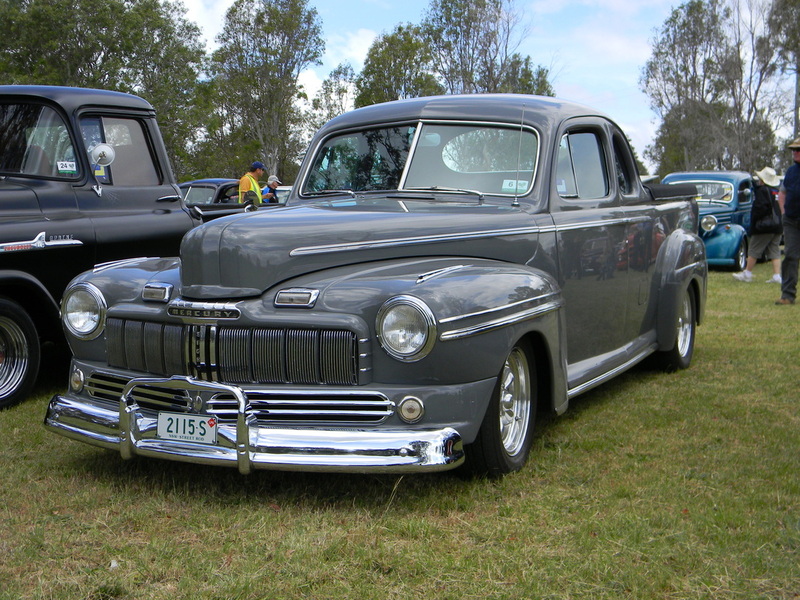 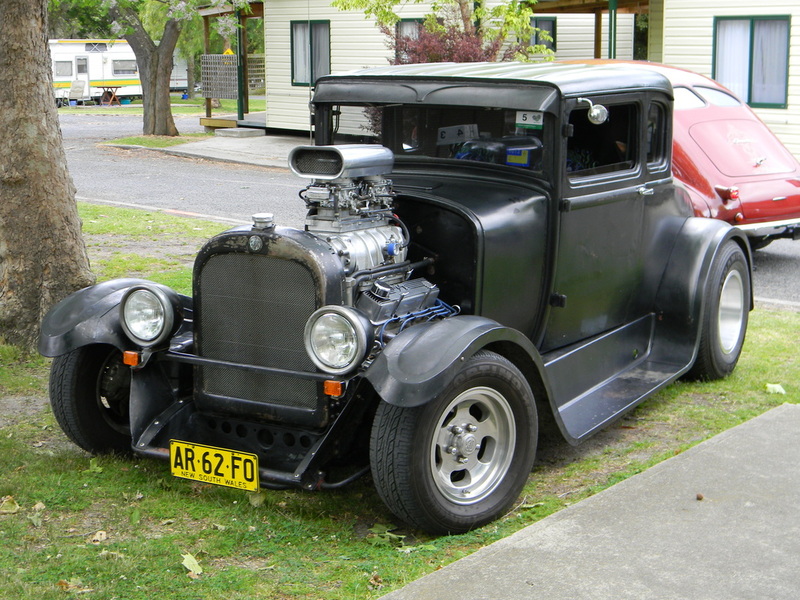 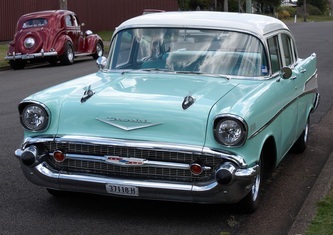 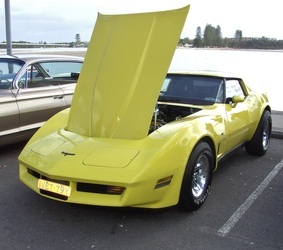 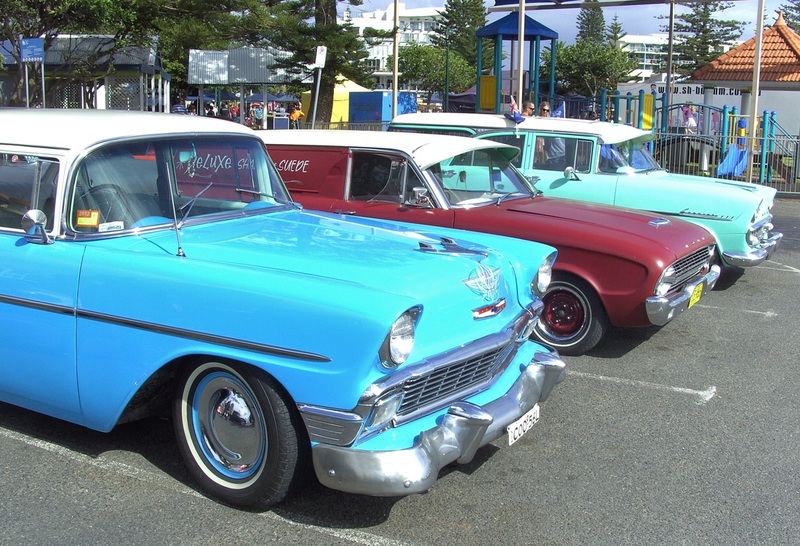 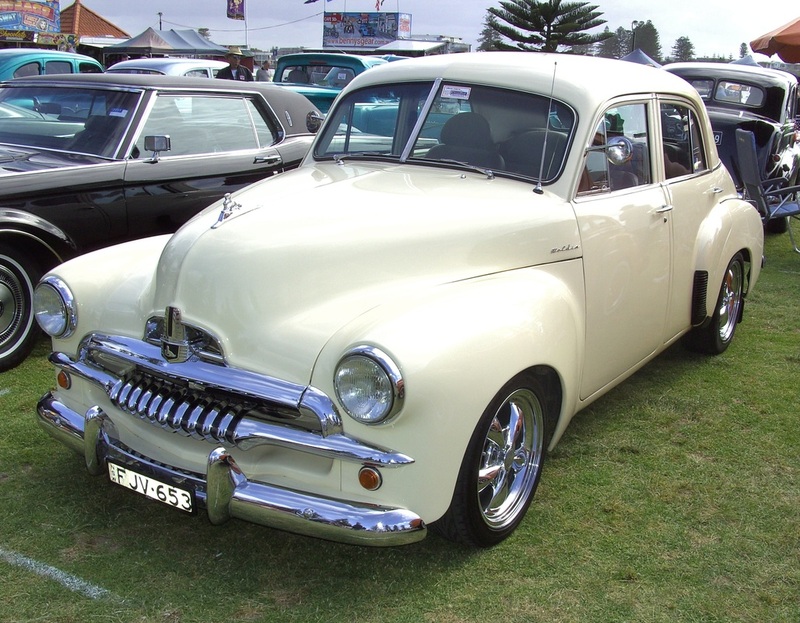 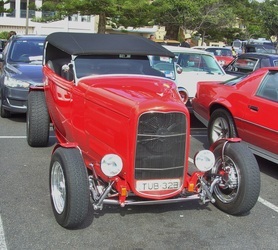 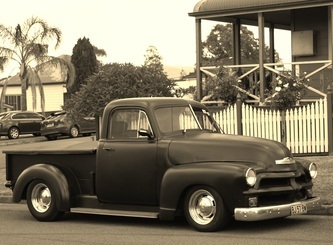 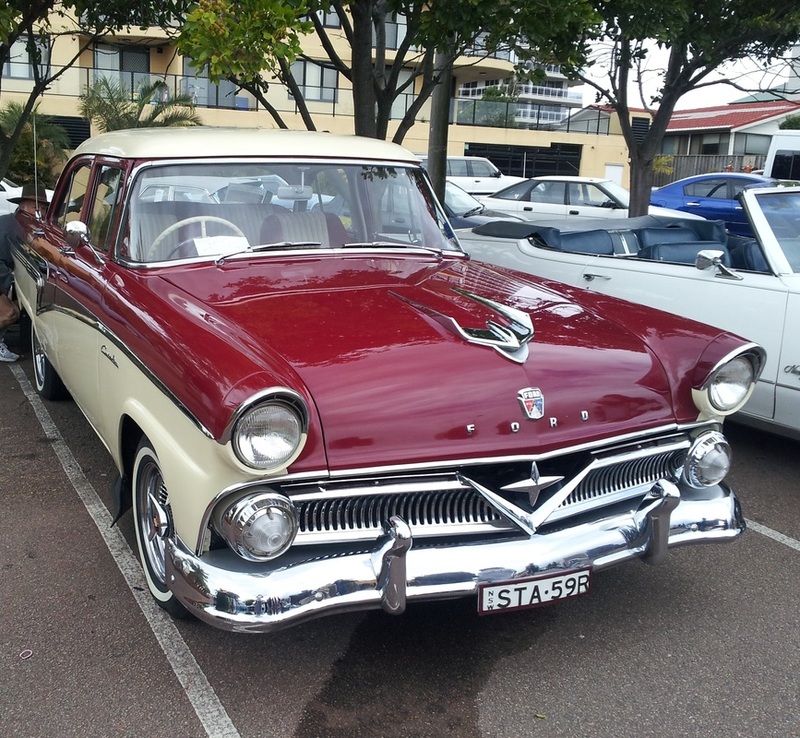 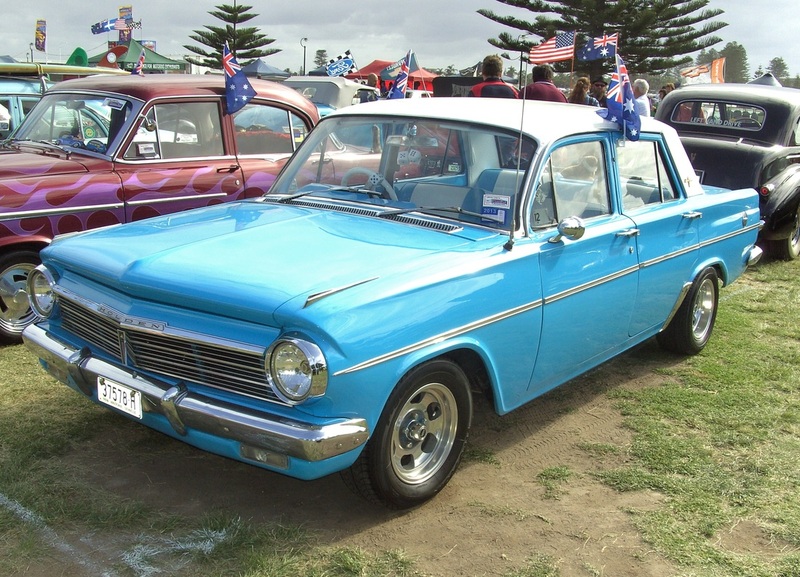 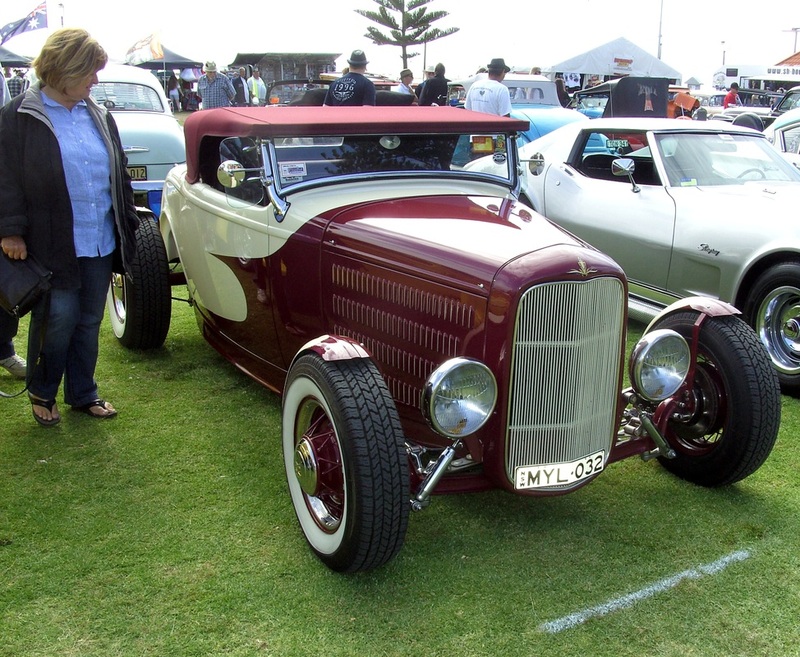 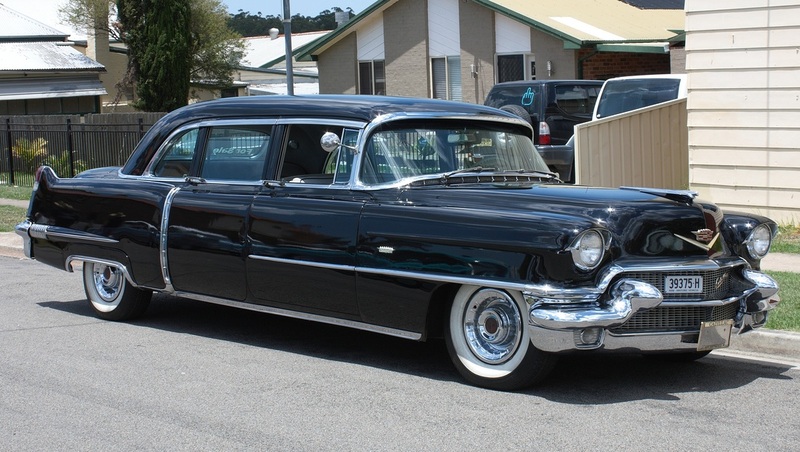 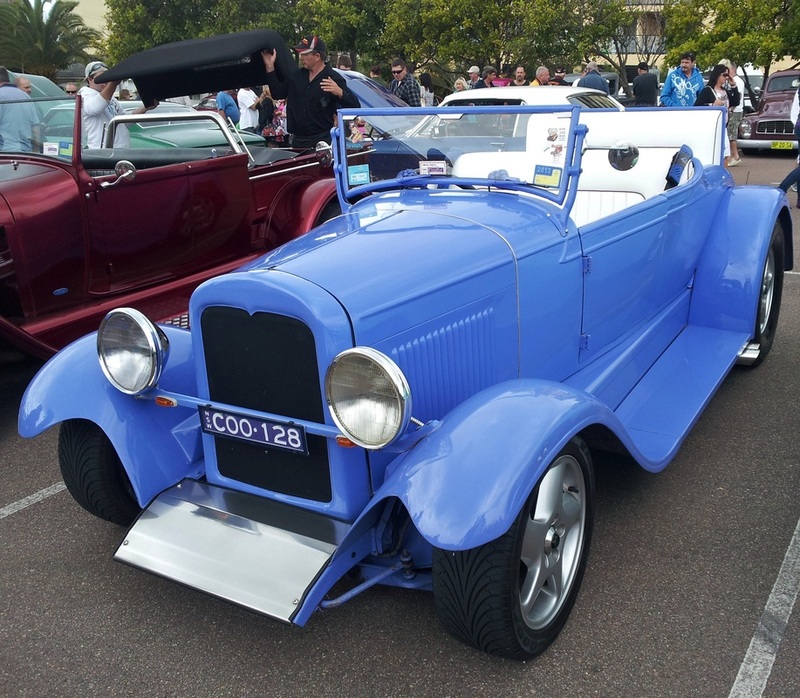 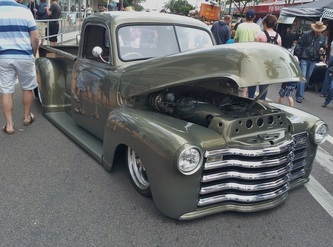 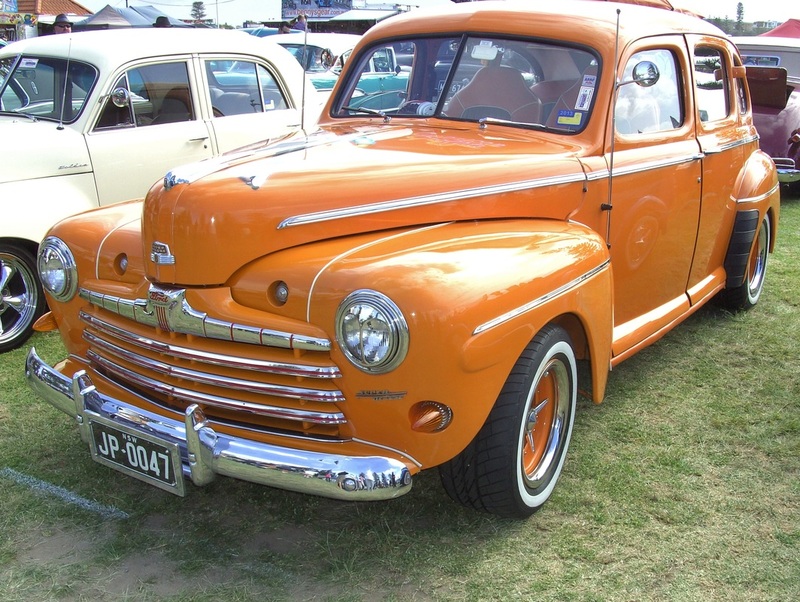 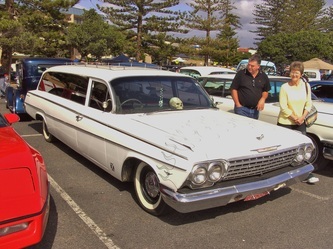 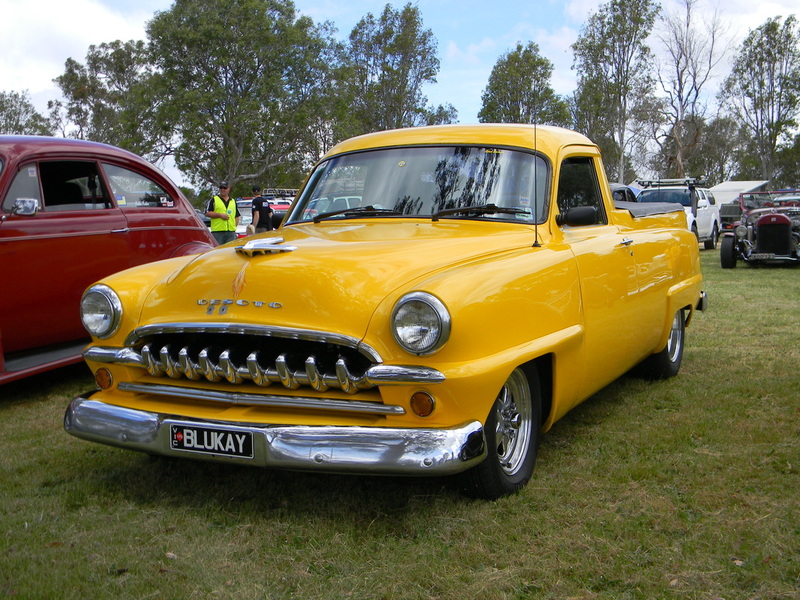 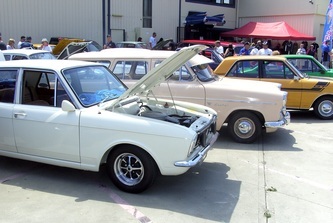 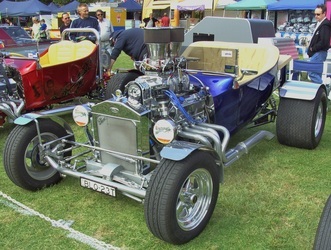 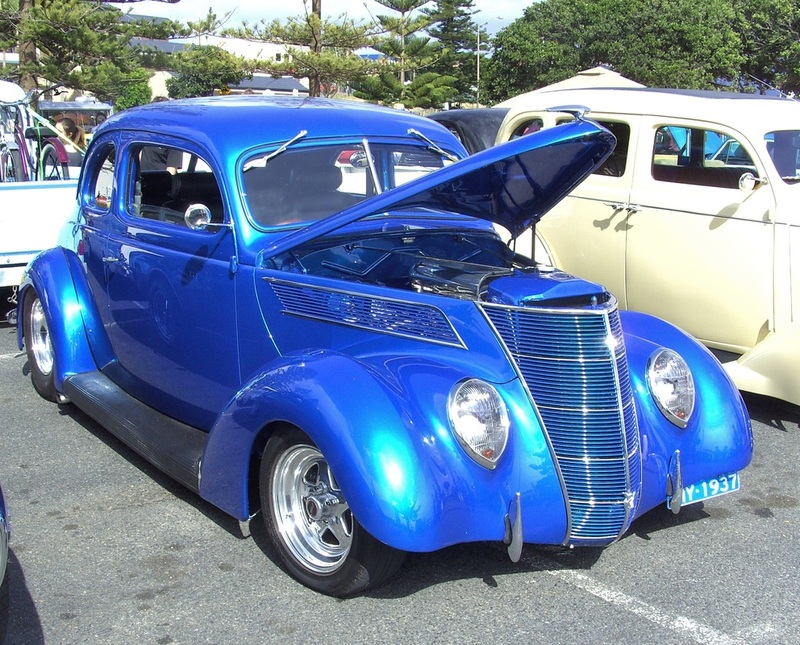 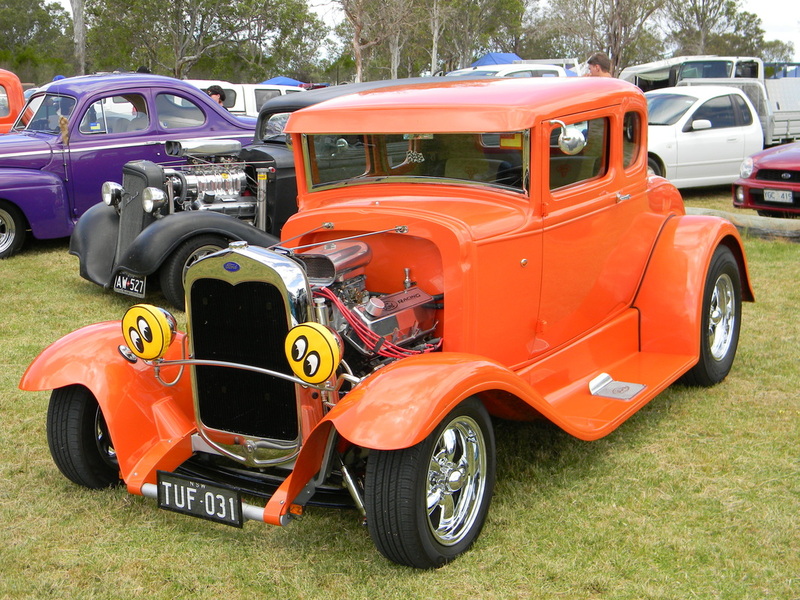 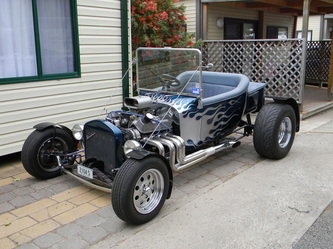 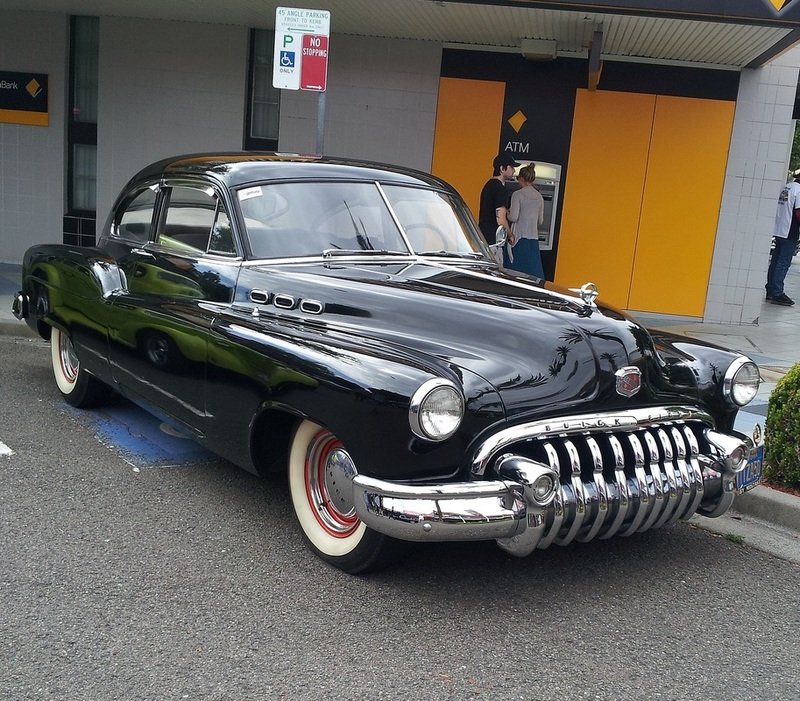 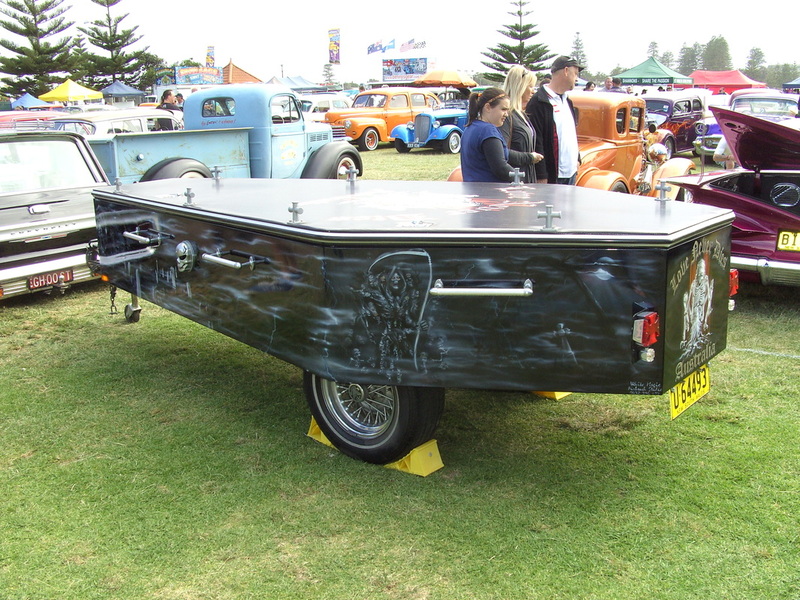 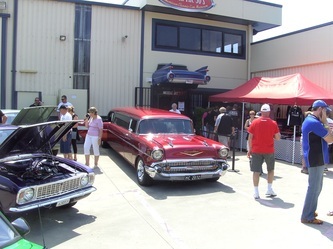 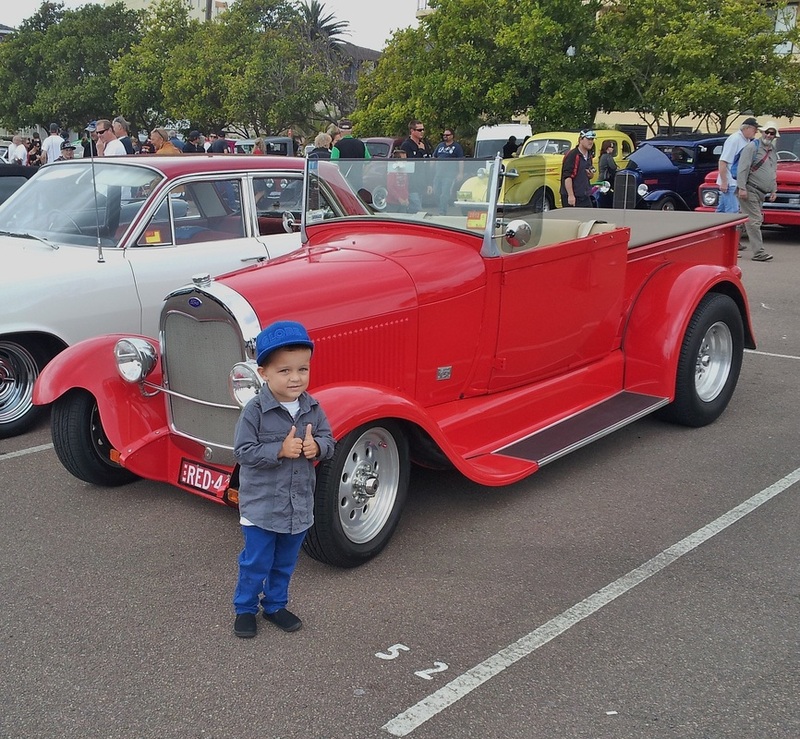 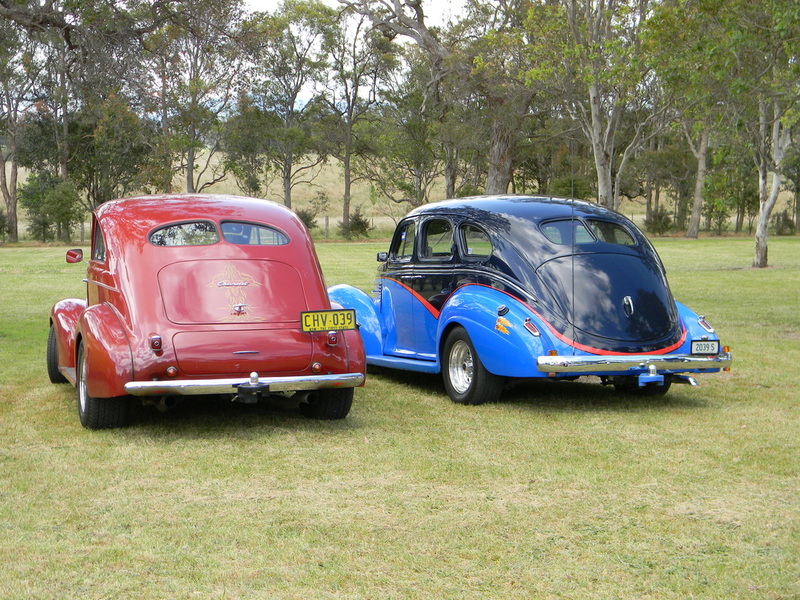 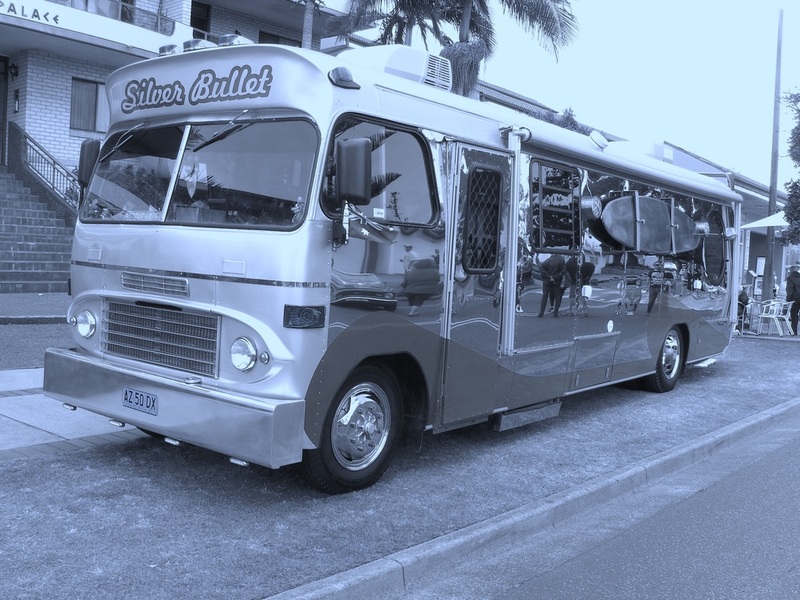 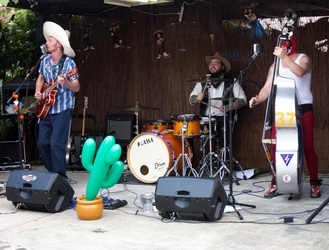 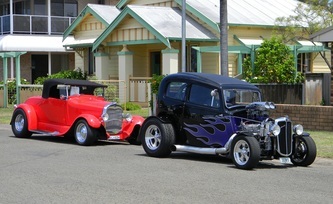 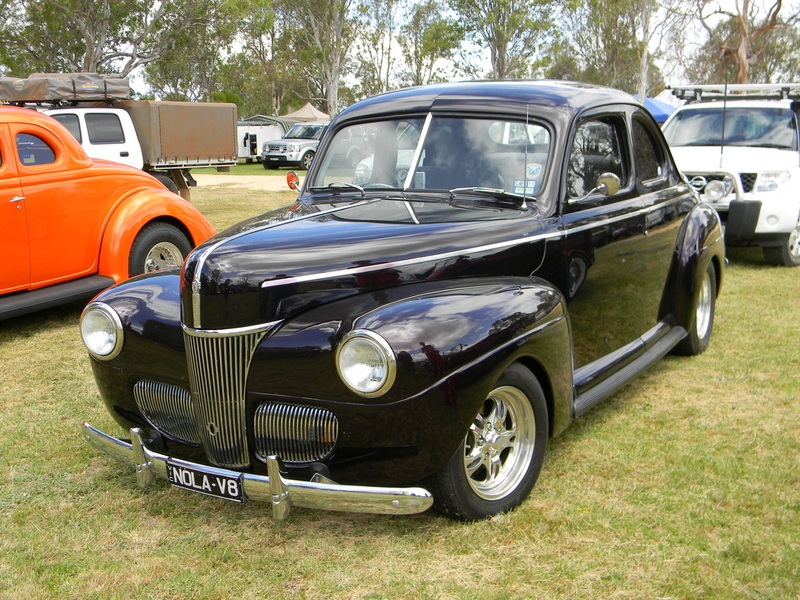 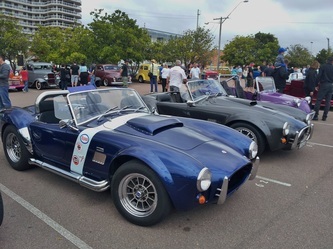 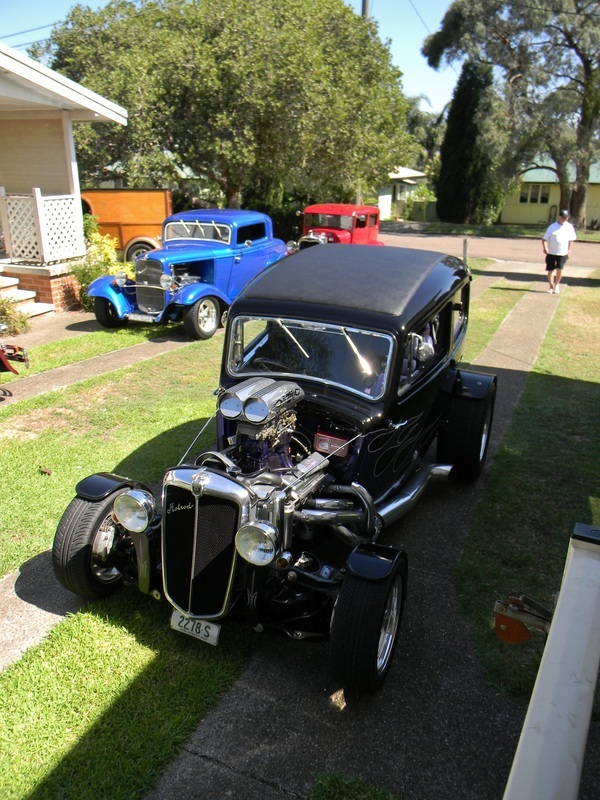 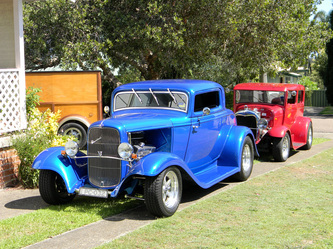 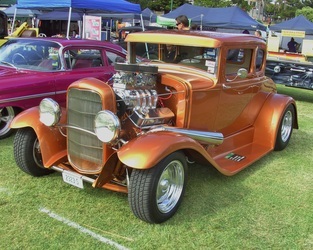 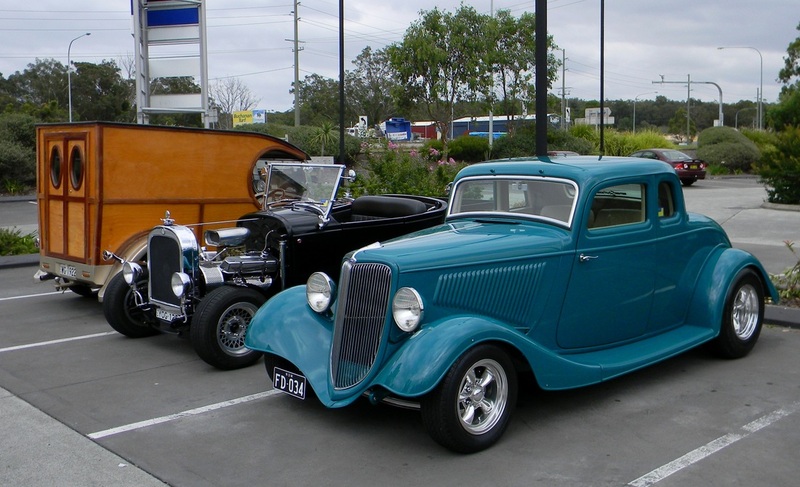 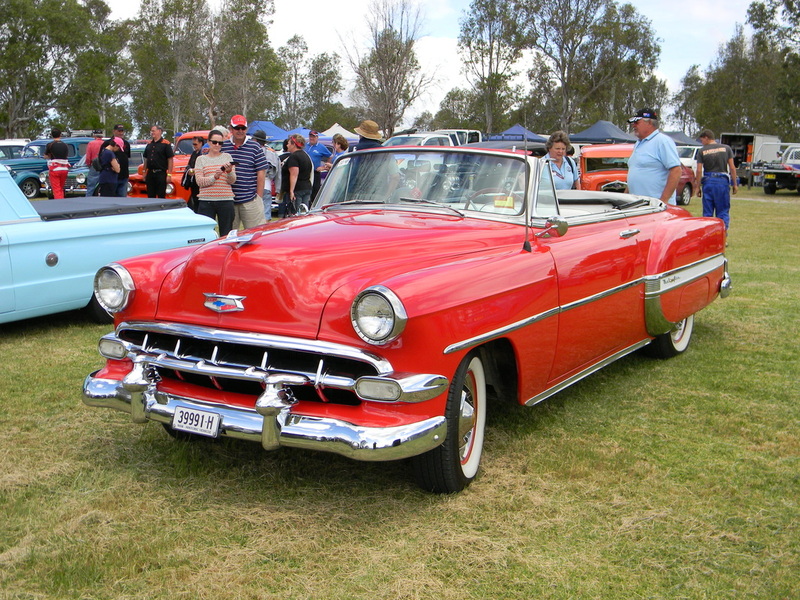 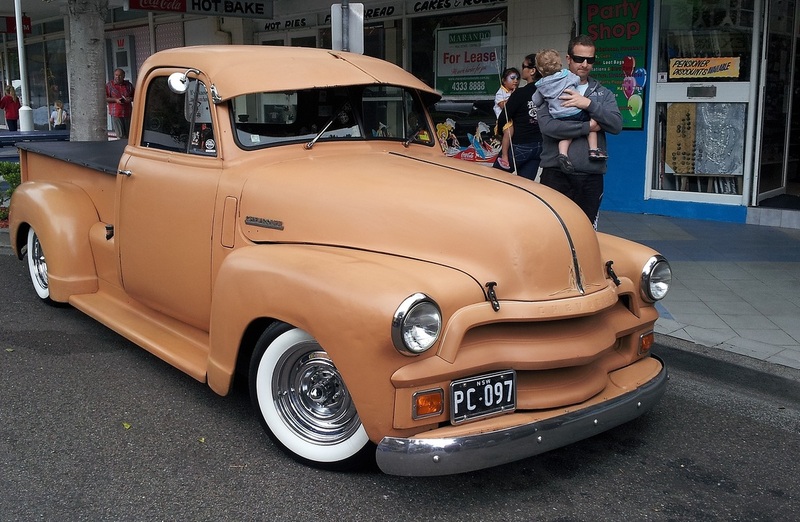 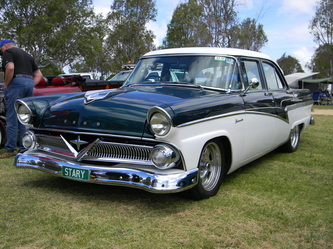 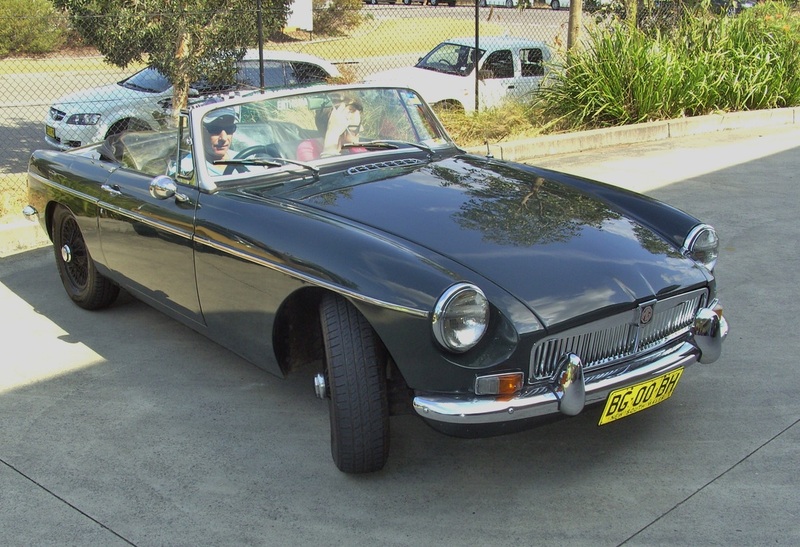 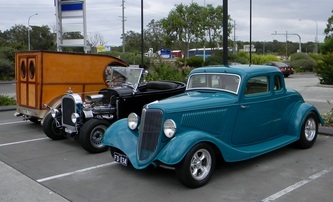 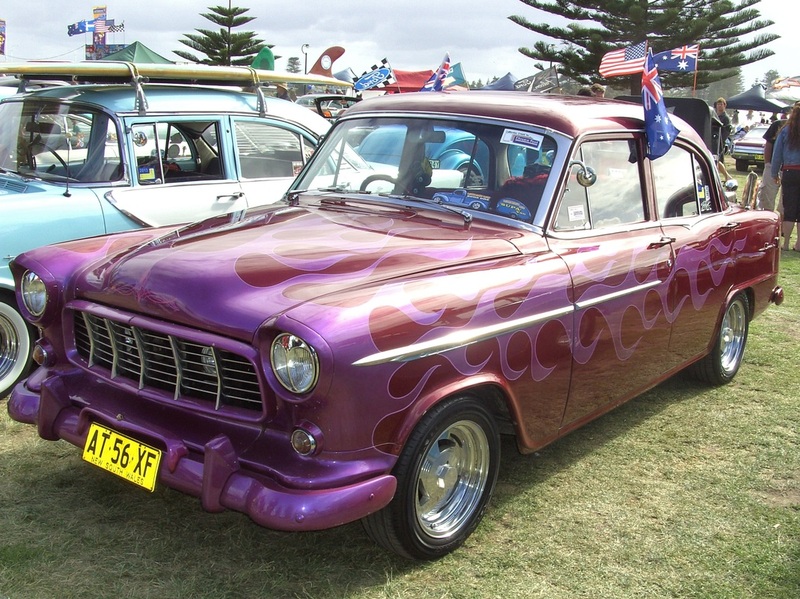 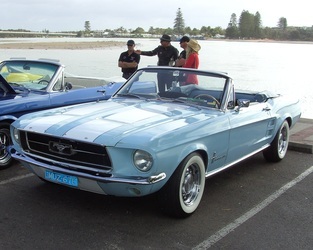 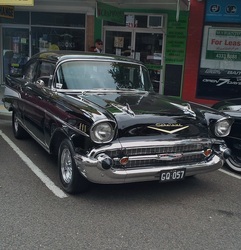 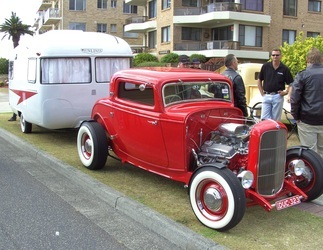 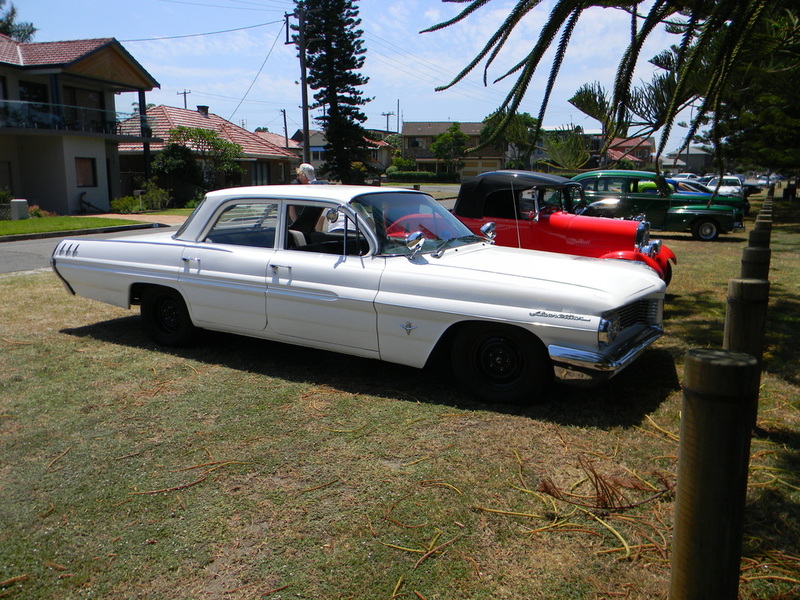 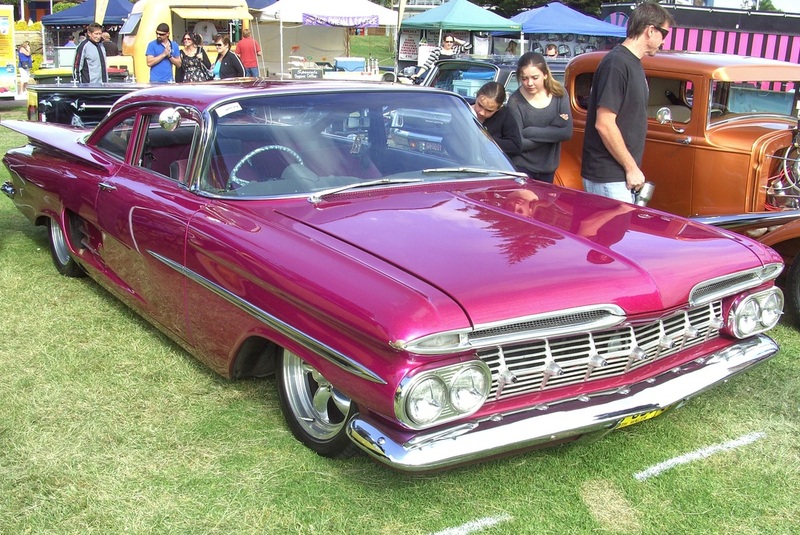 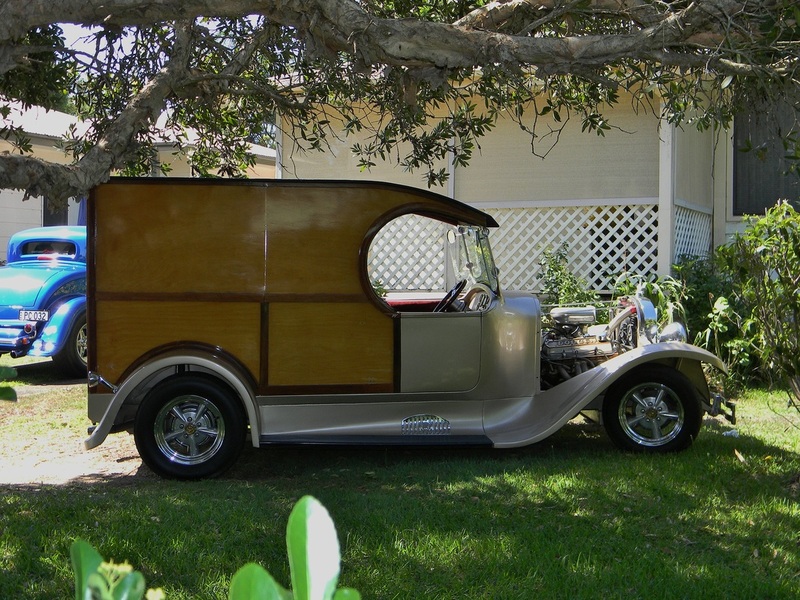 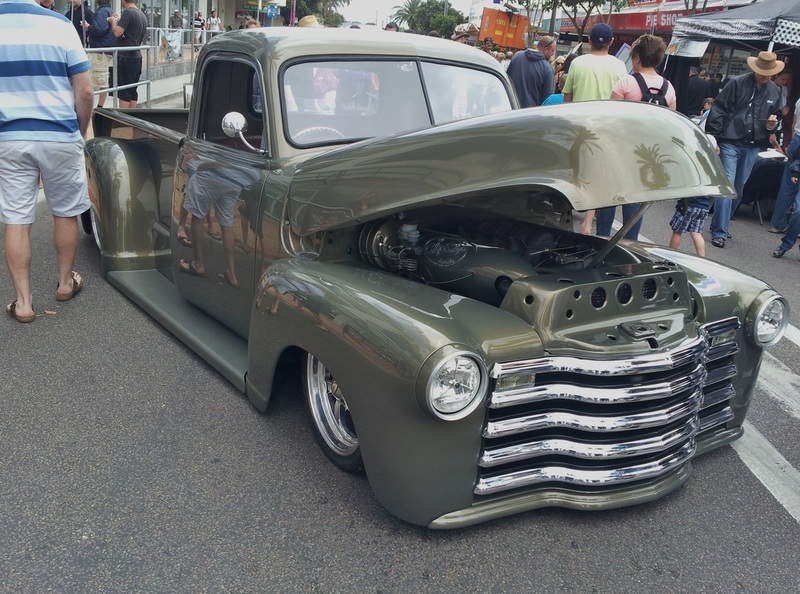 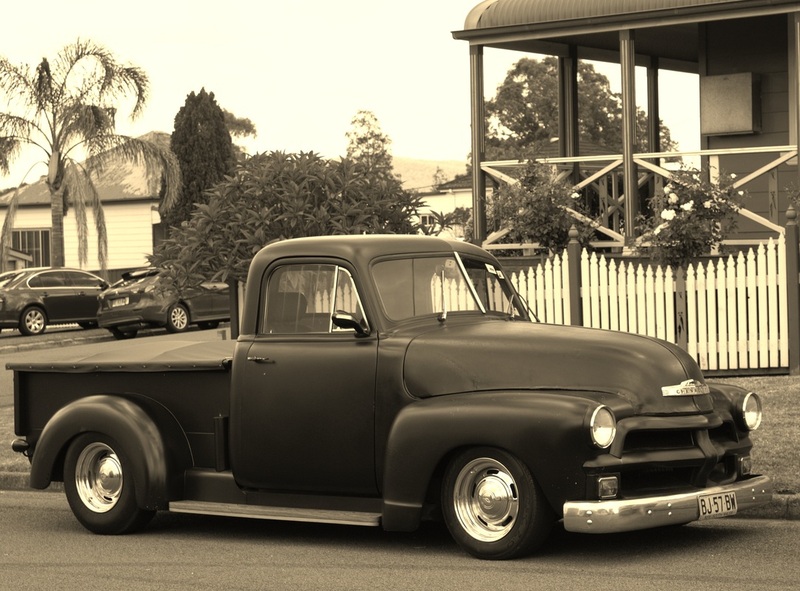 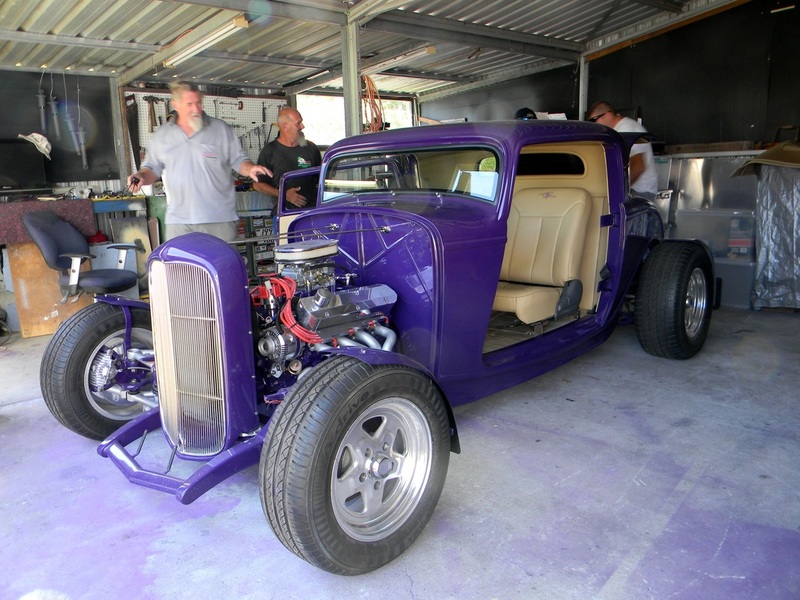 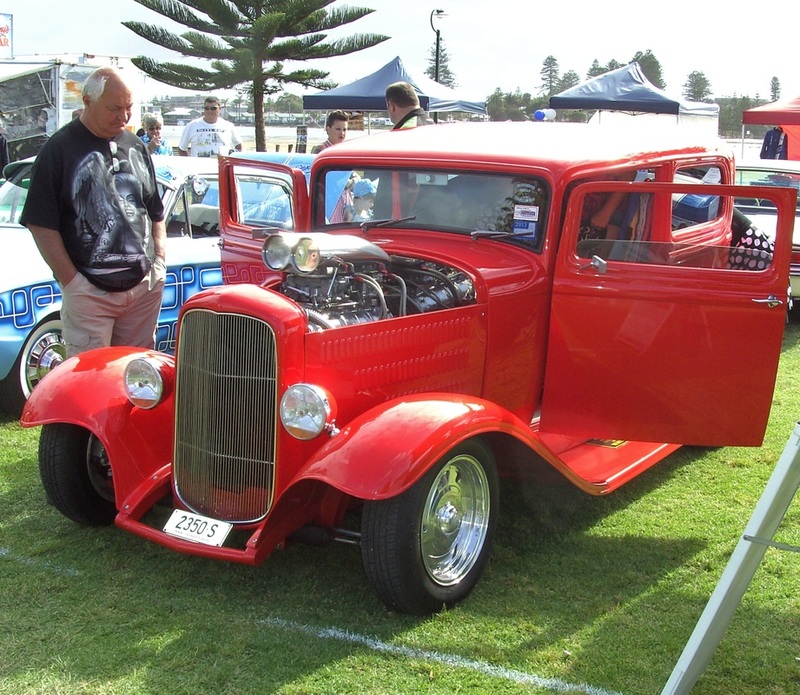 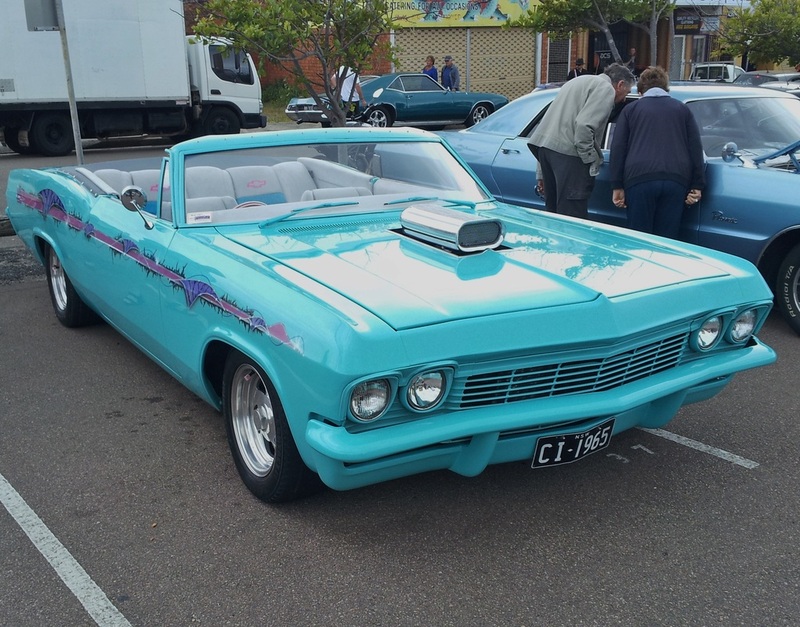 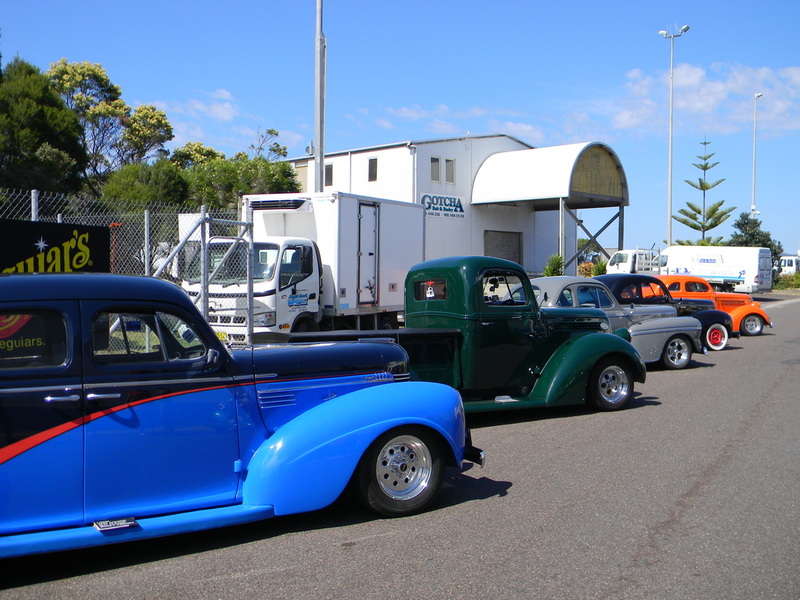 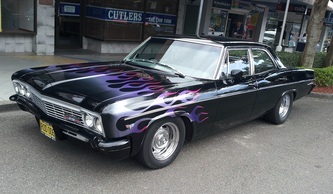 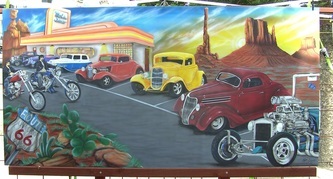 On Sunday morning it was breakfast back at the pub before the show and shine and then a farewell BBQ and presentation was held at the Garden of Eden Caravan Park. 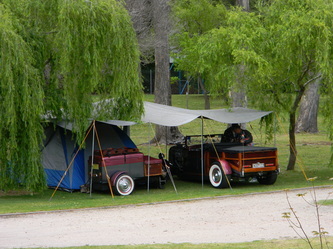 A great weekend with terrific company and we have already booked our camp site for next year. 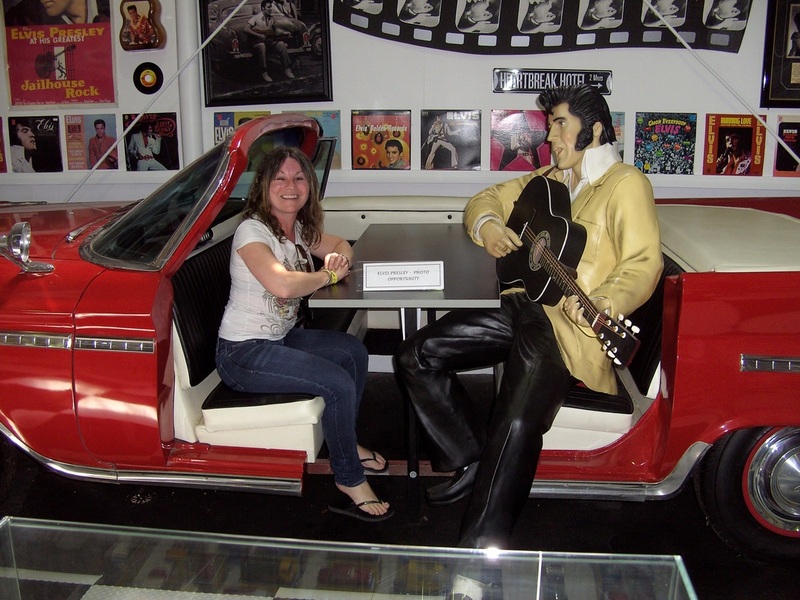 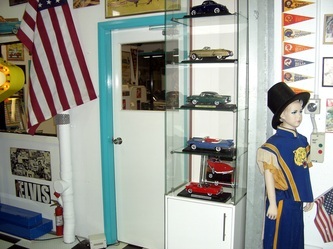 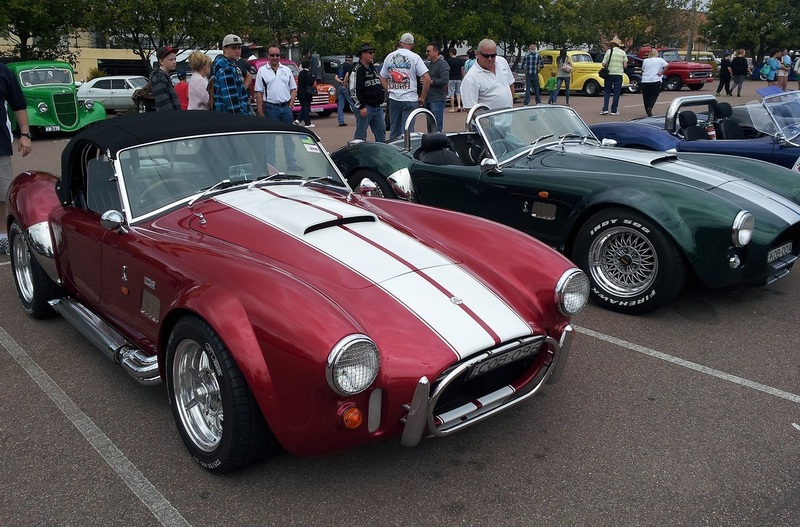 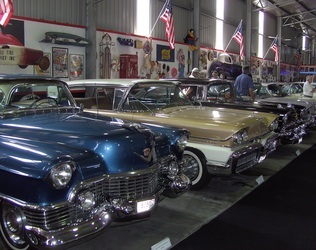 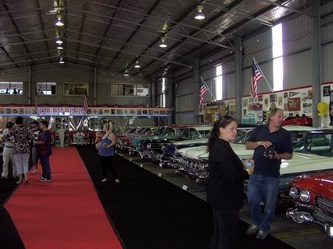 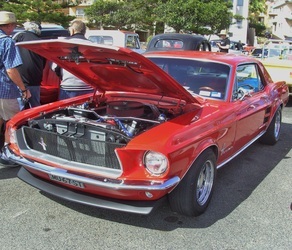 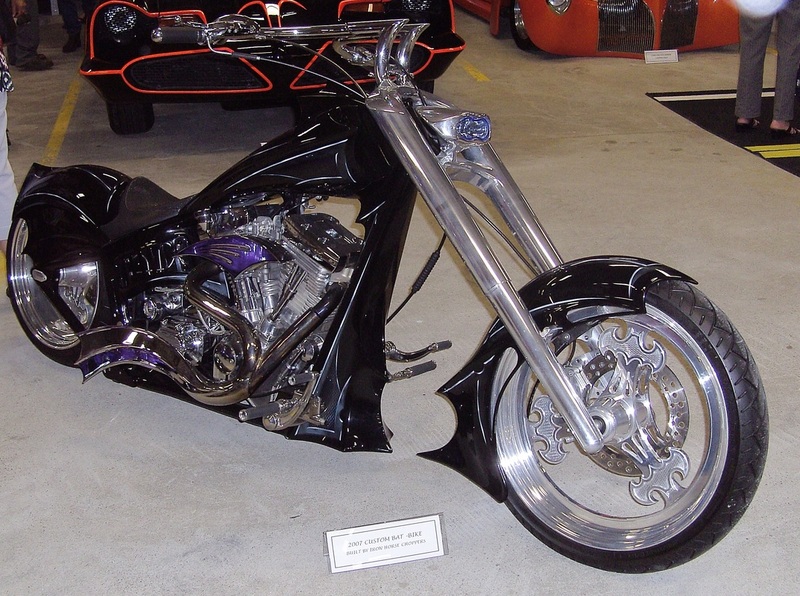 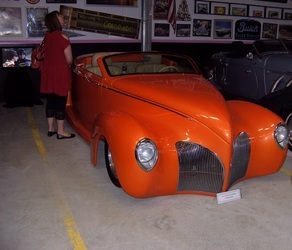 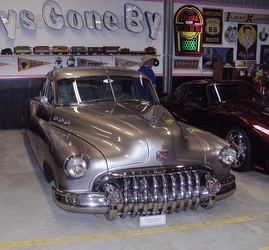 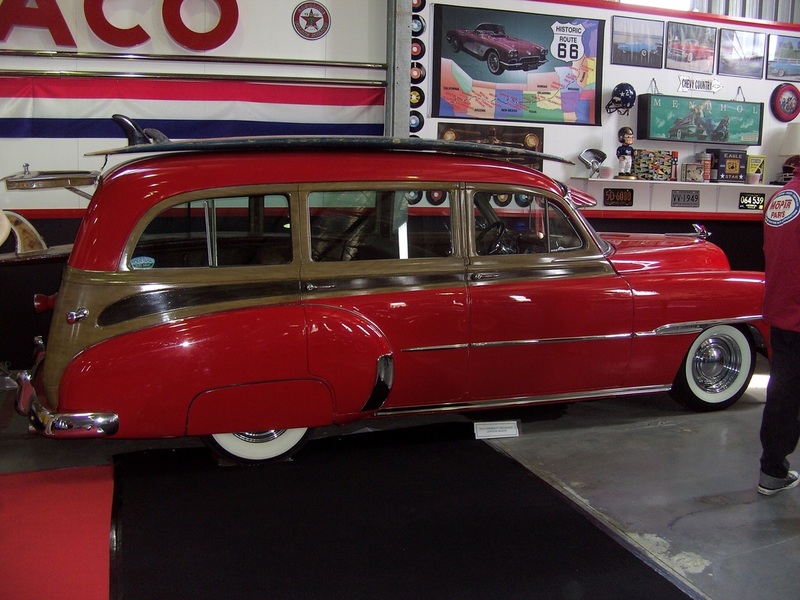 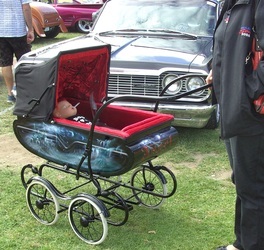 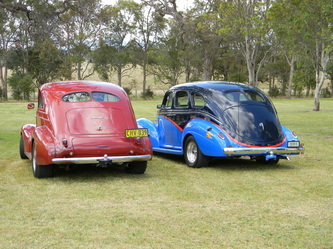 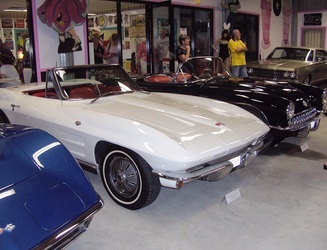 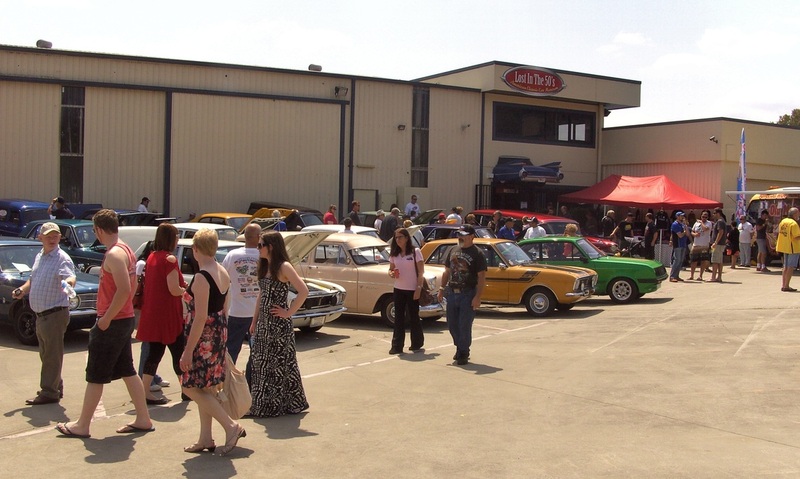 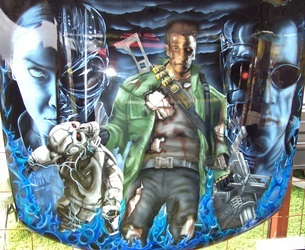 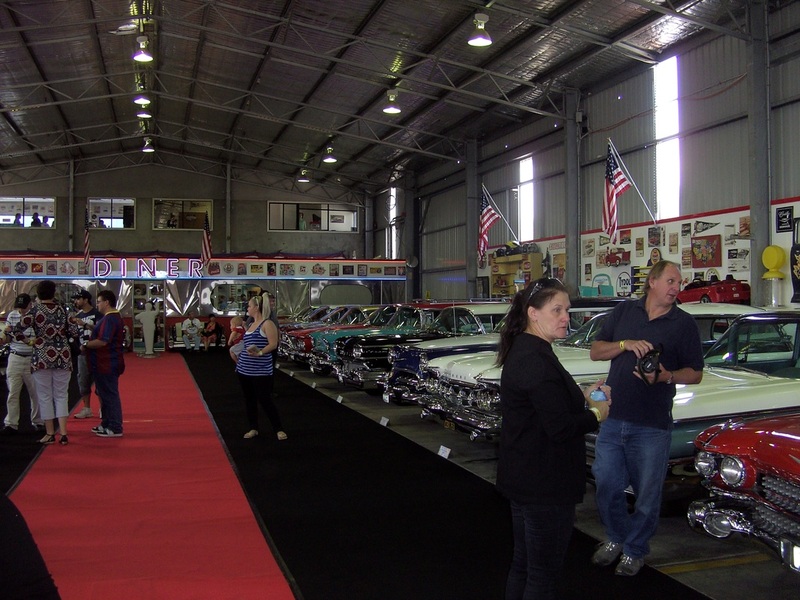 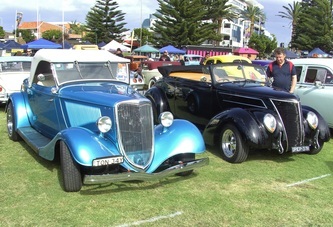 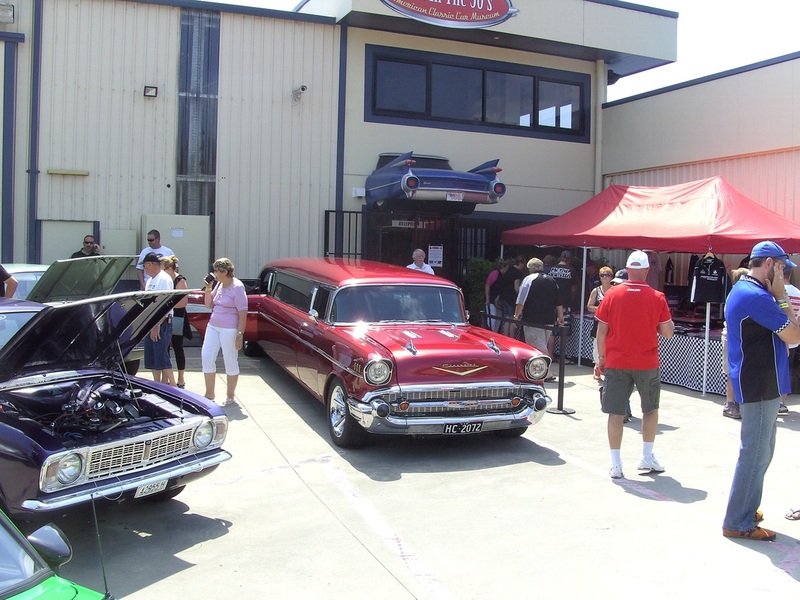 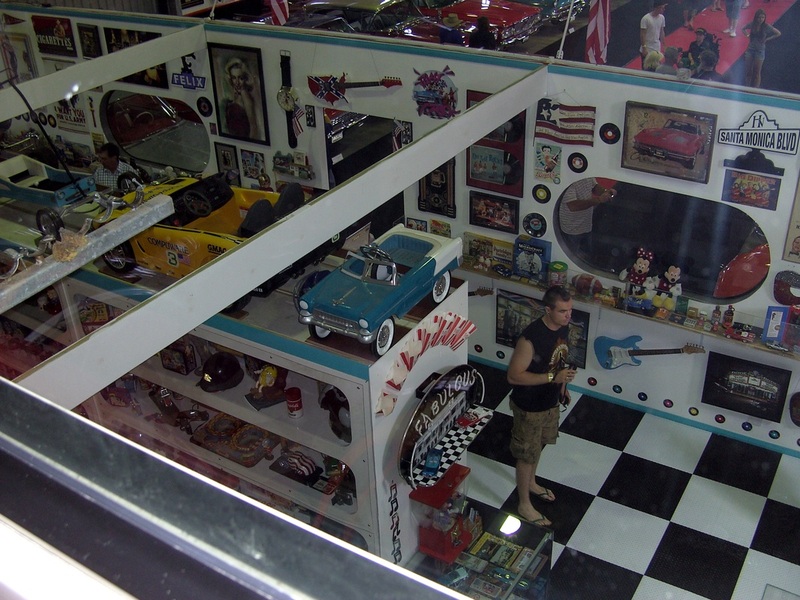 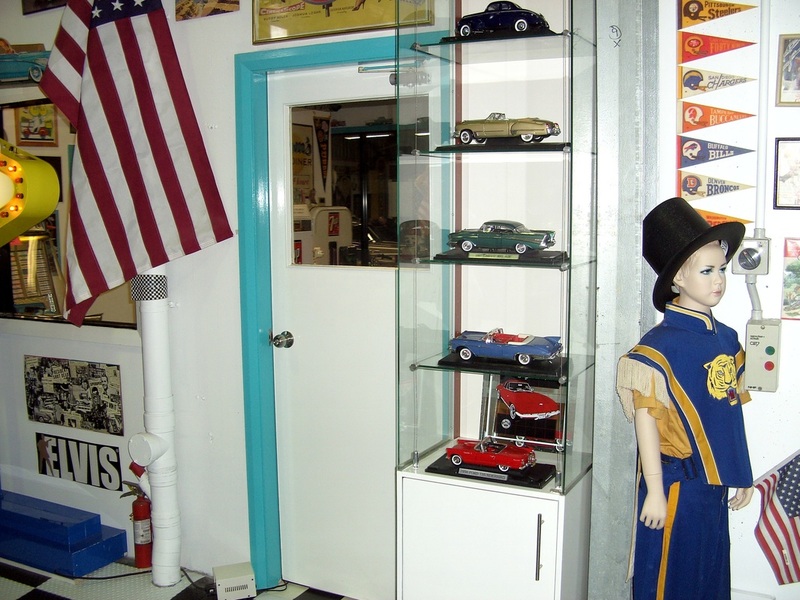 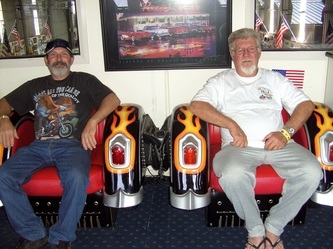 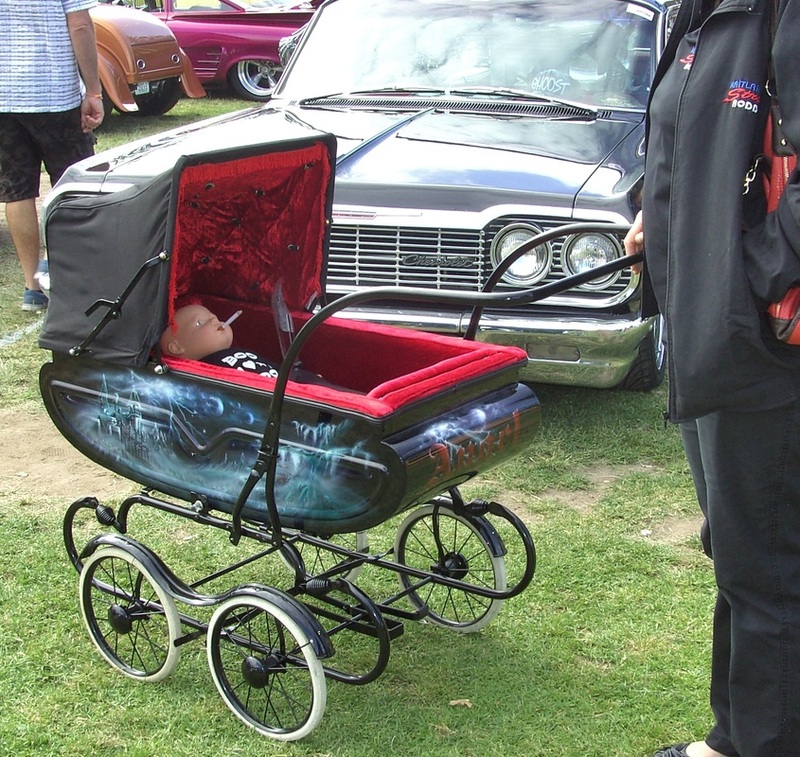 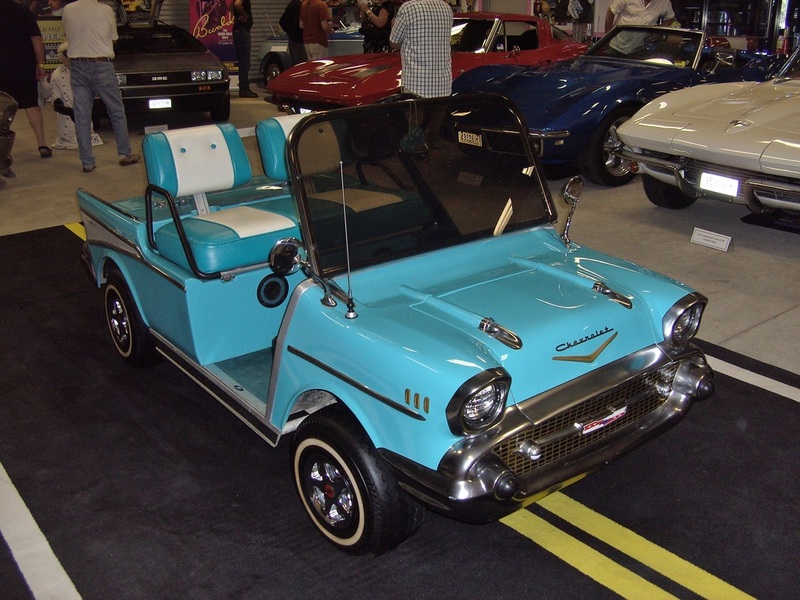 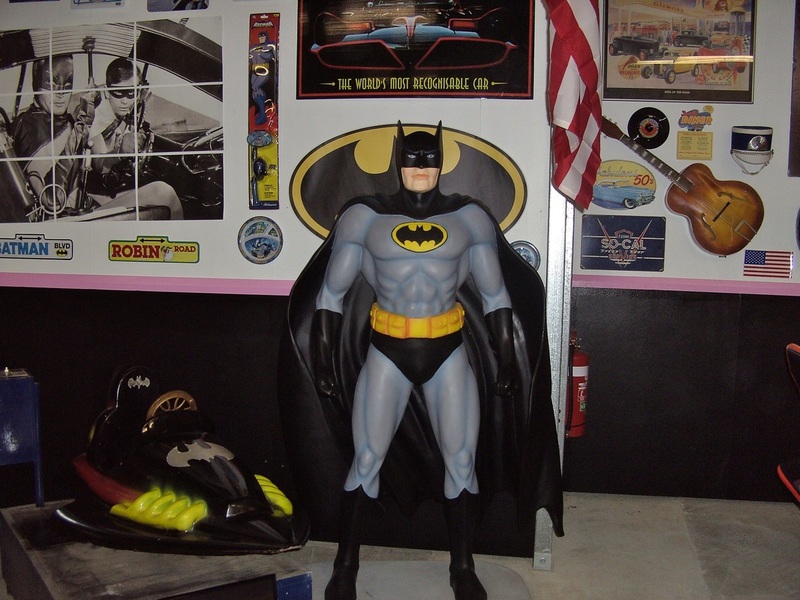 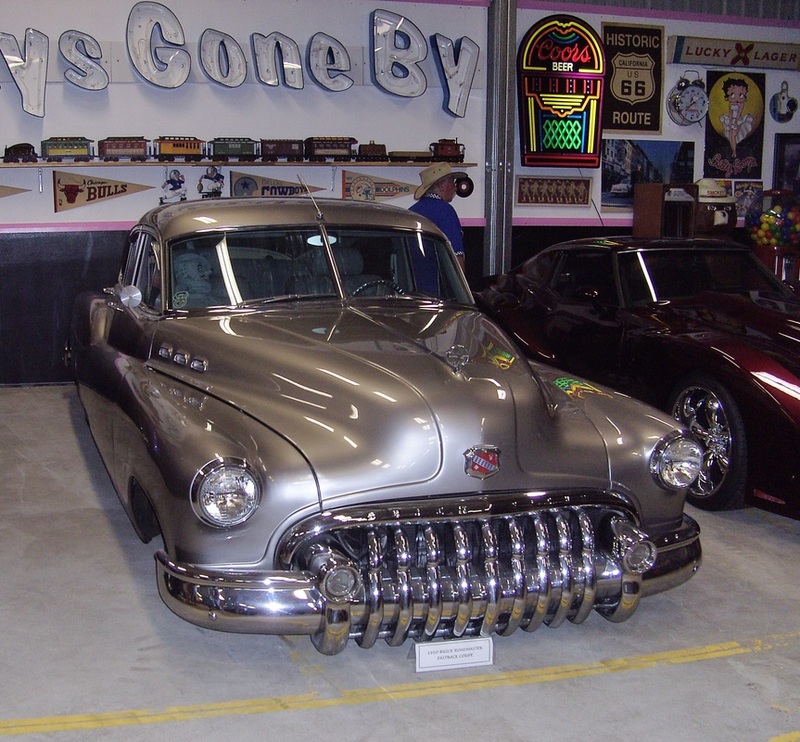 Chromefest held at The Entrance in October was another very successful event. 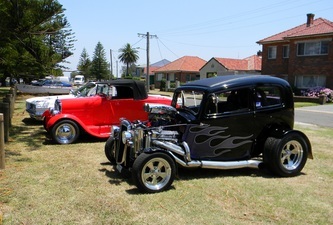 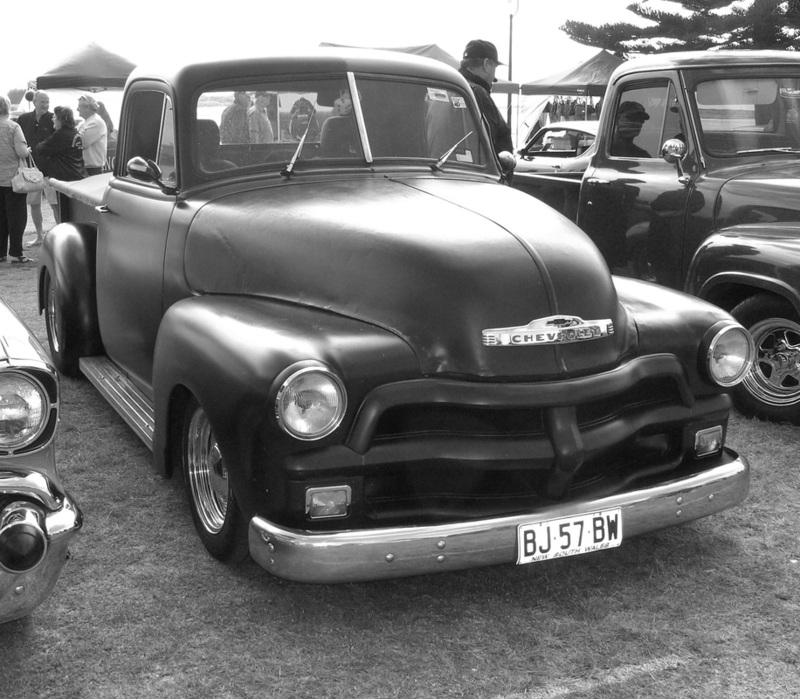 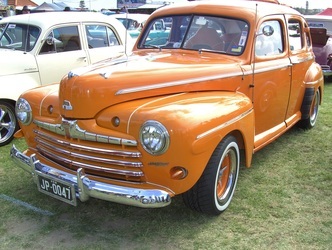 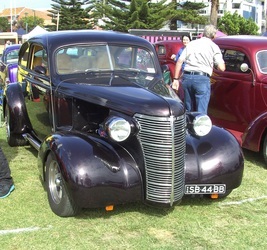 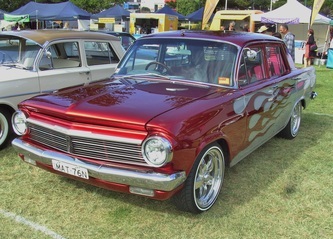 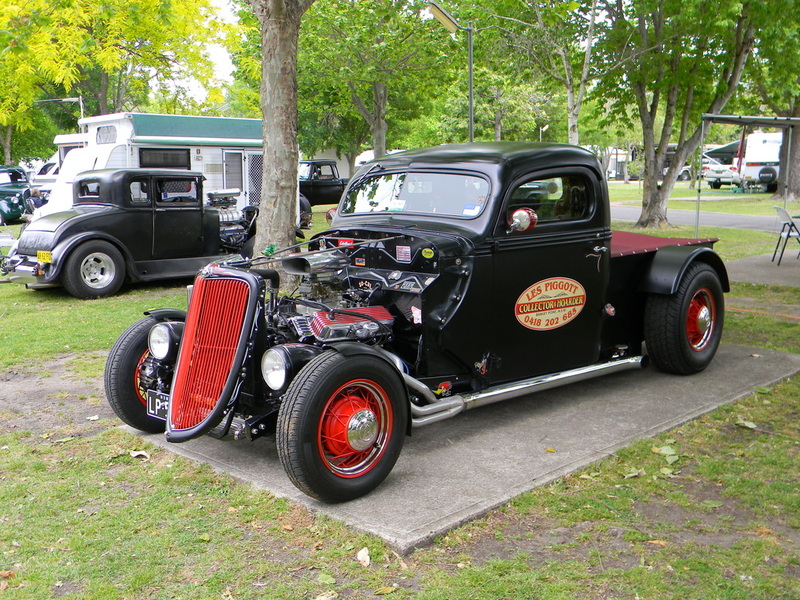 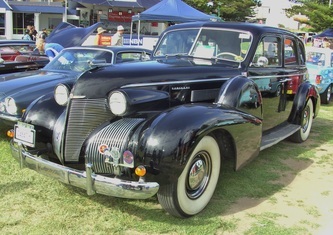 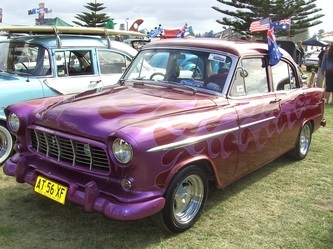 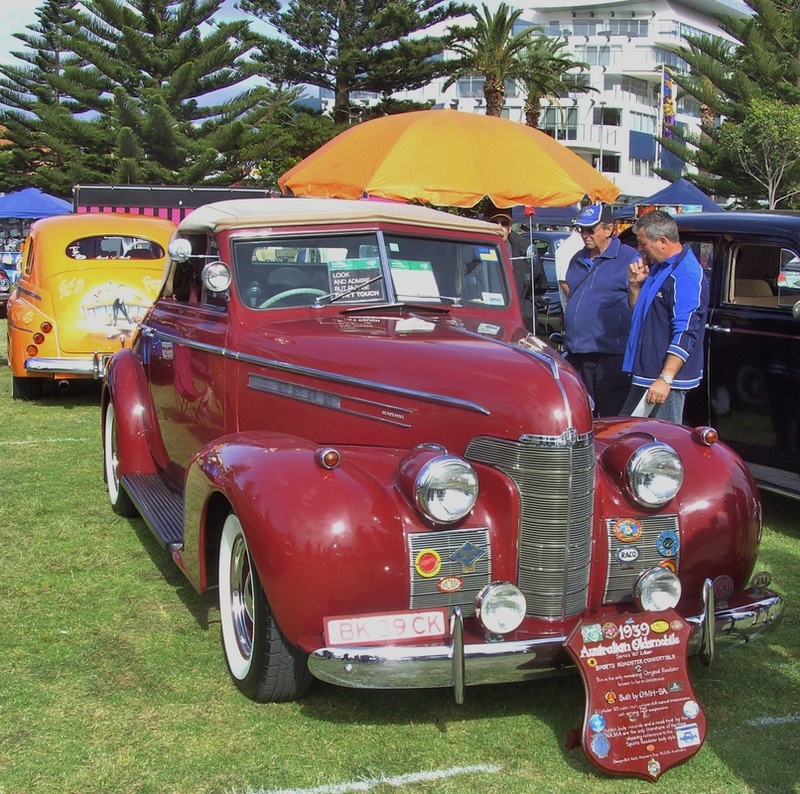 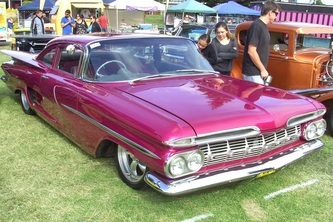 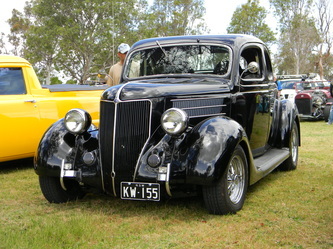 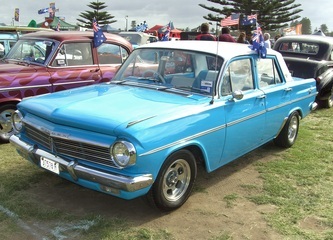 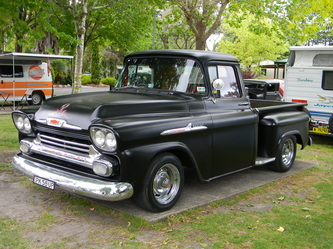 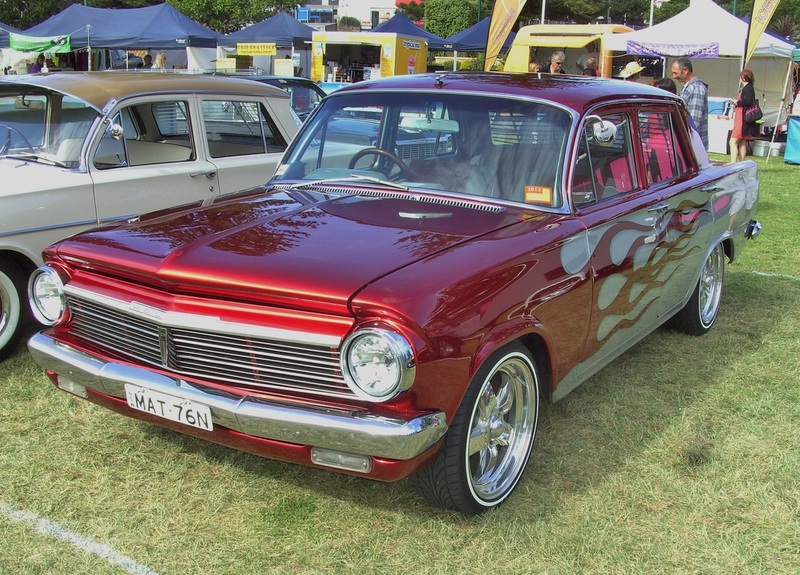 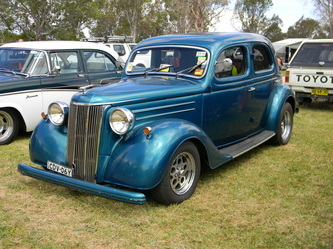 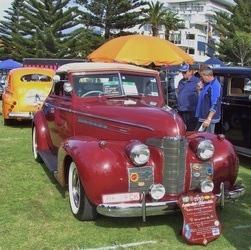 The Show and Shine held on the Sunday had the park and the streets full of Rods, Customs and a great variety of other vehicles. 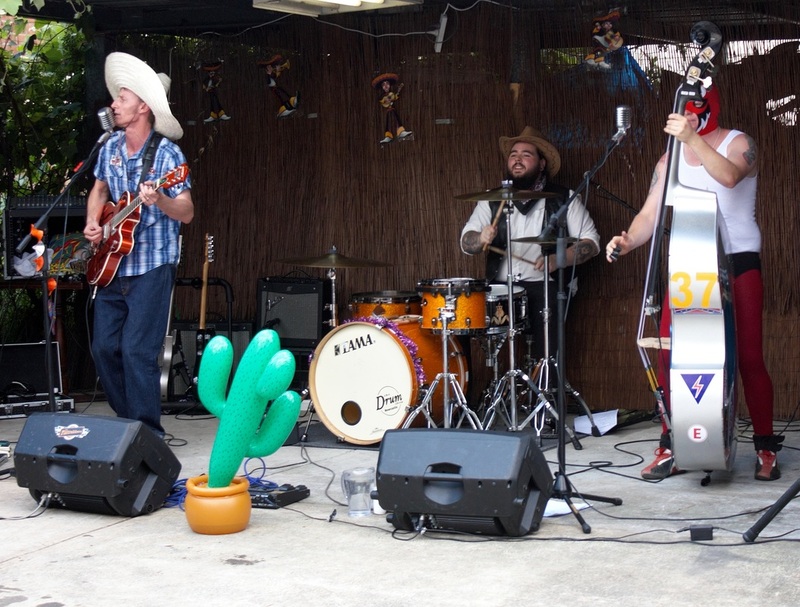 The day was cooler than last year which gave relief to those who suffer in the heat and of course the dancers who enjoyed the live bands and music. Congratulations to all those who organised this event which should be a must on everyone's calendar. 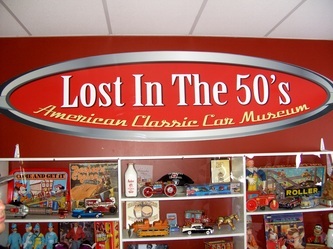 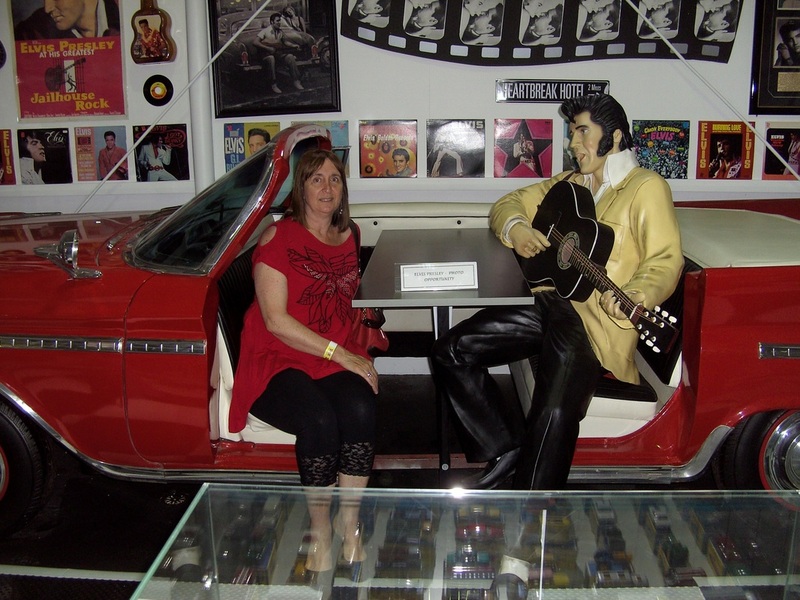 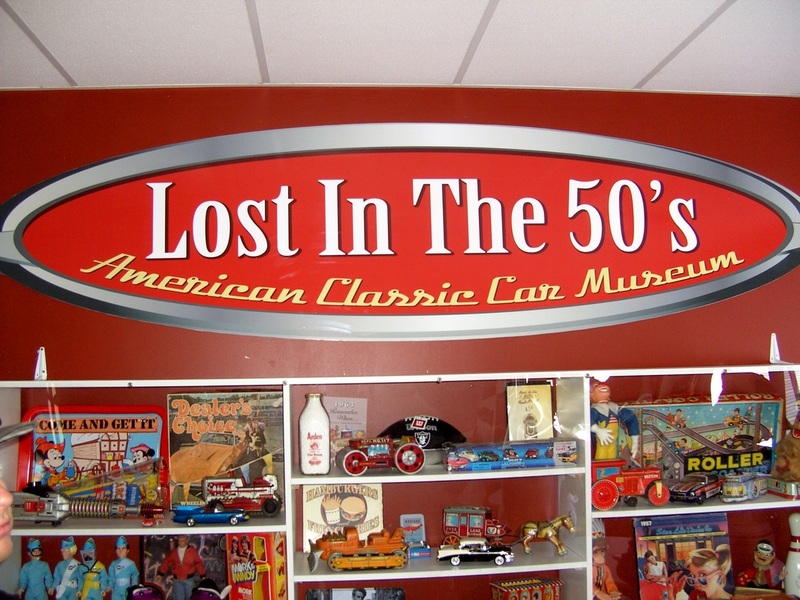 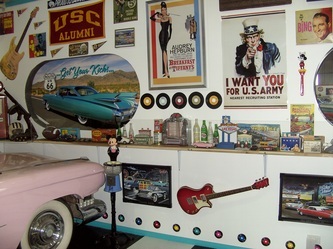 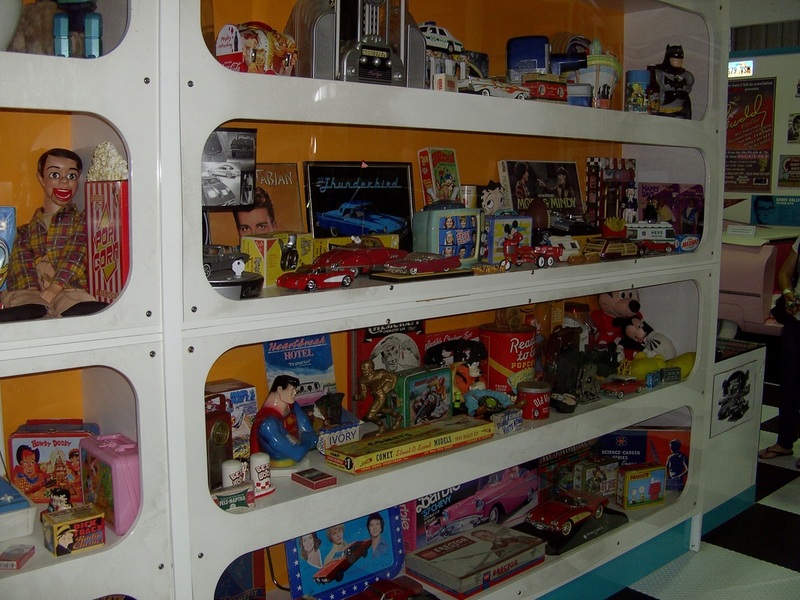 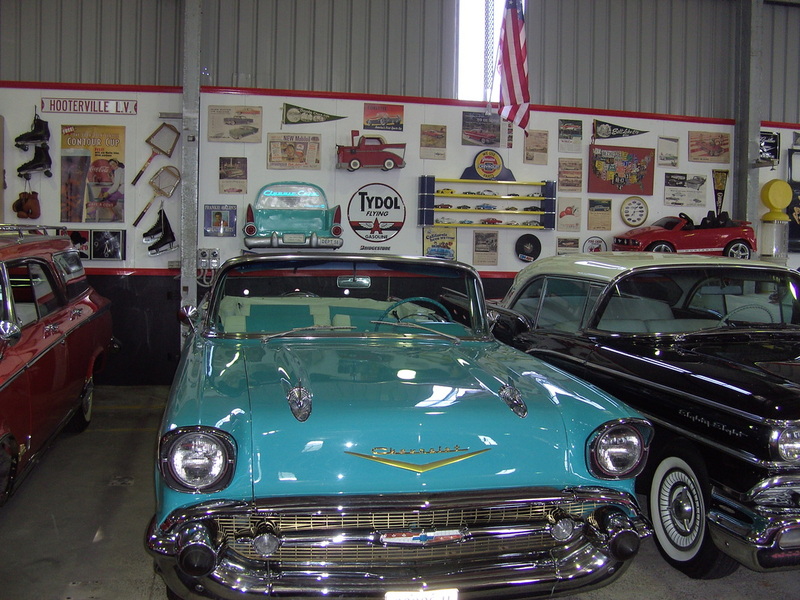 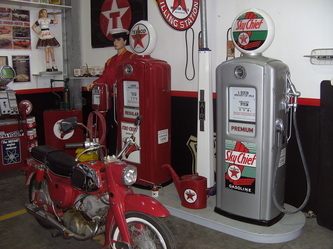 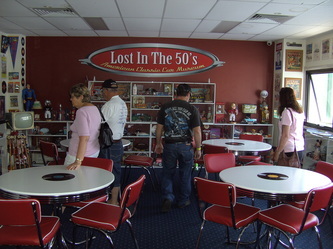 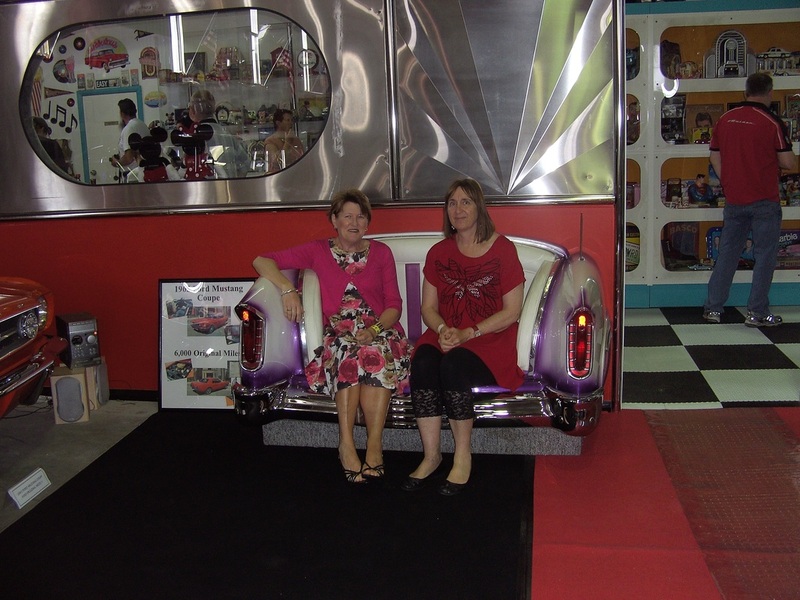 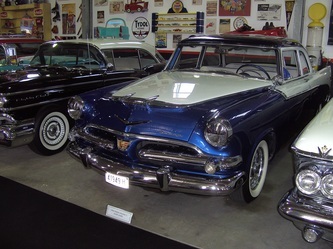 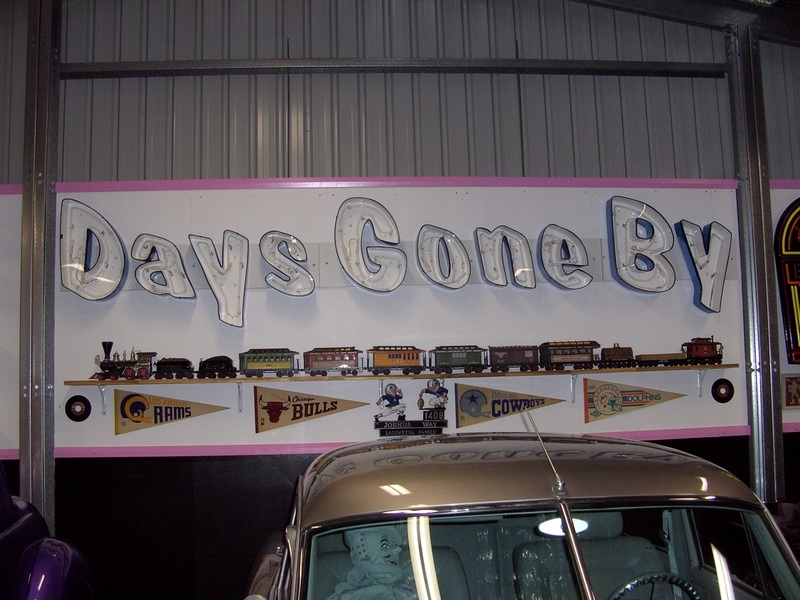 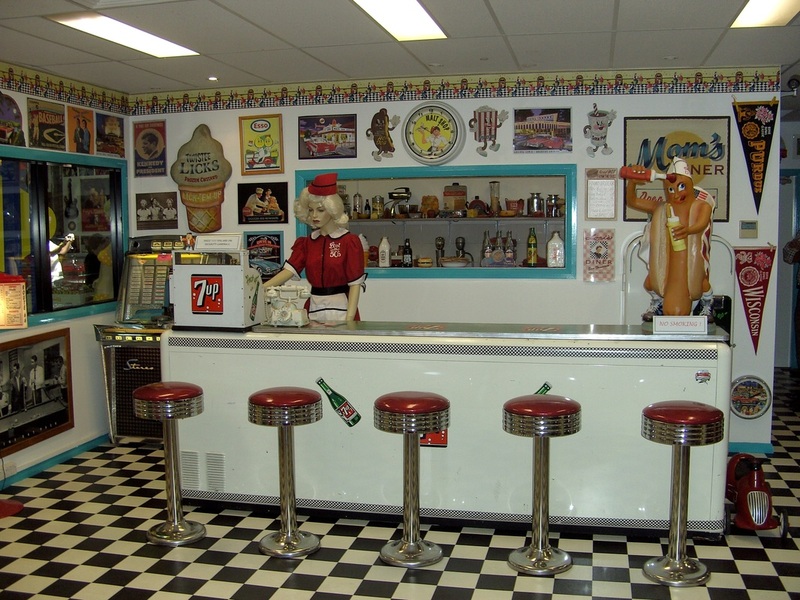 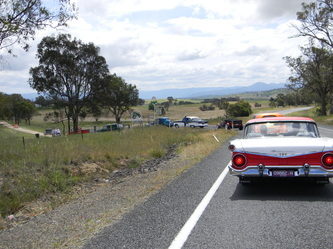 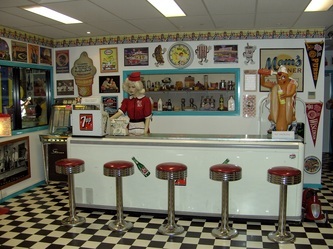 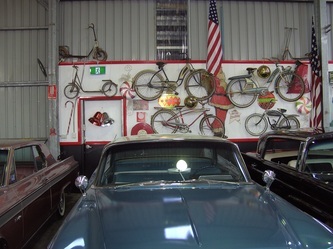 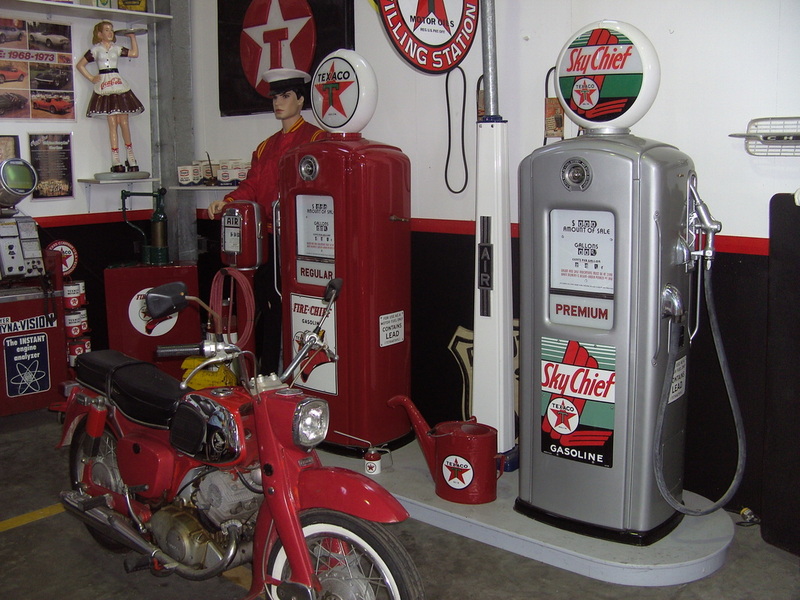 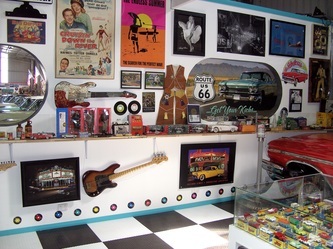 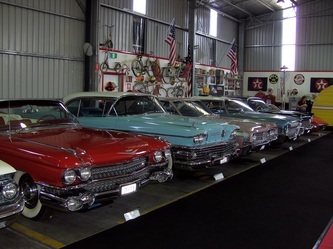 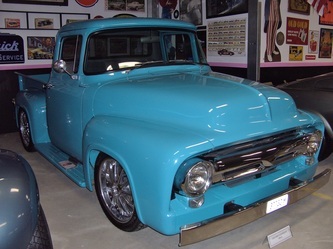 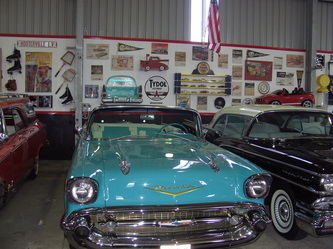 A terrific day was had by all those who attended Lost in the 50's in November 2012. 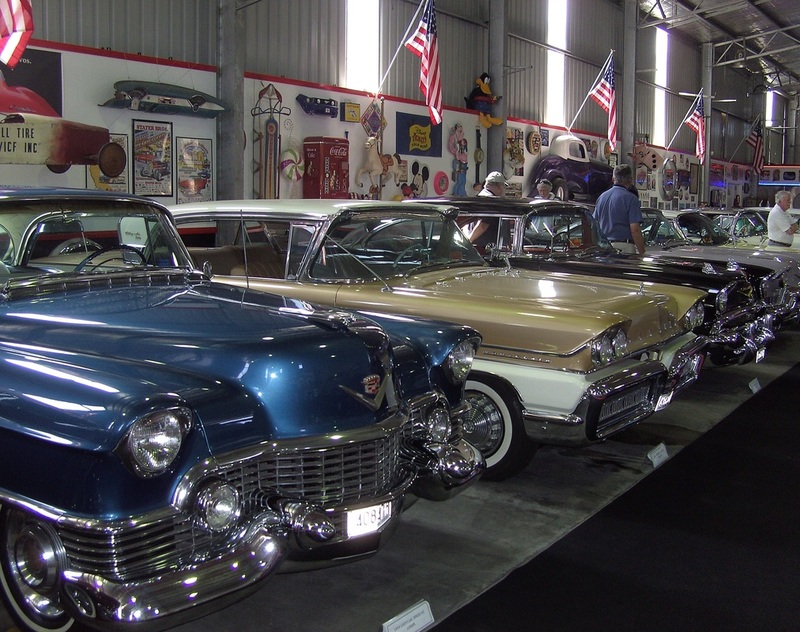 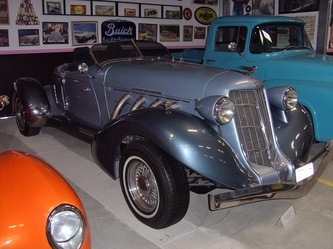 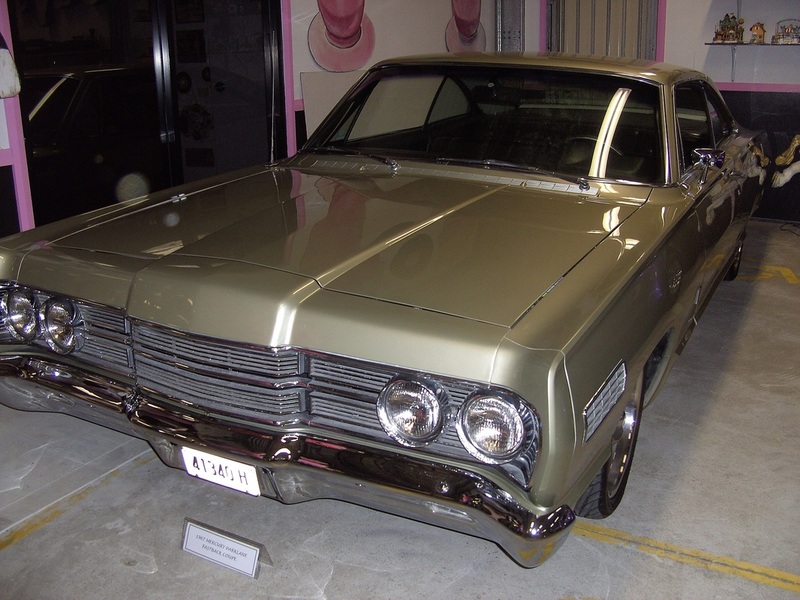 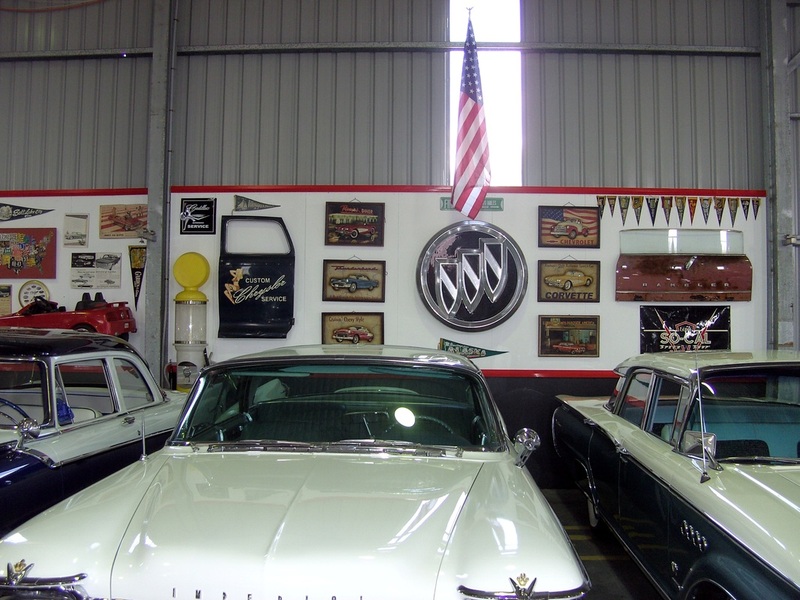 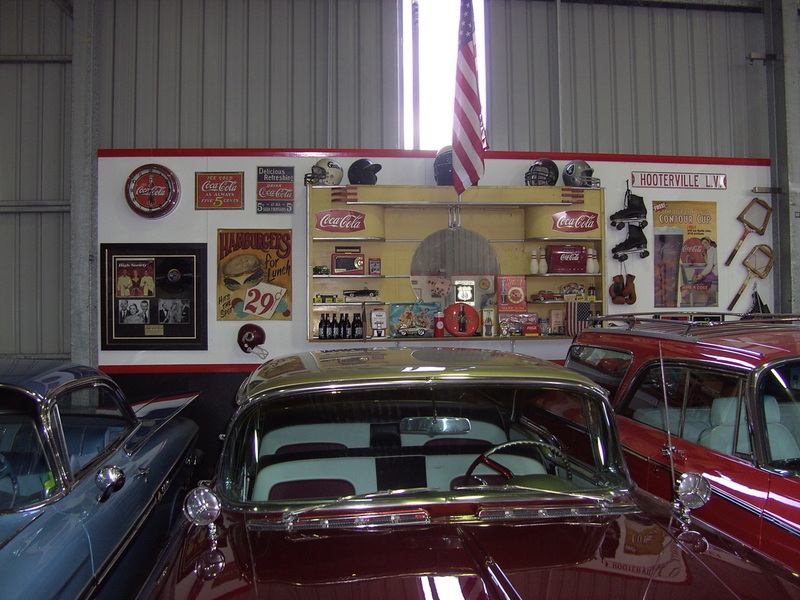 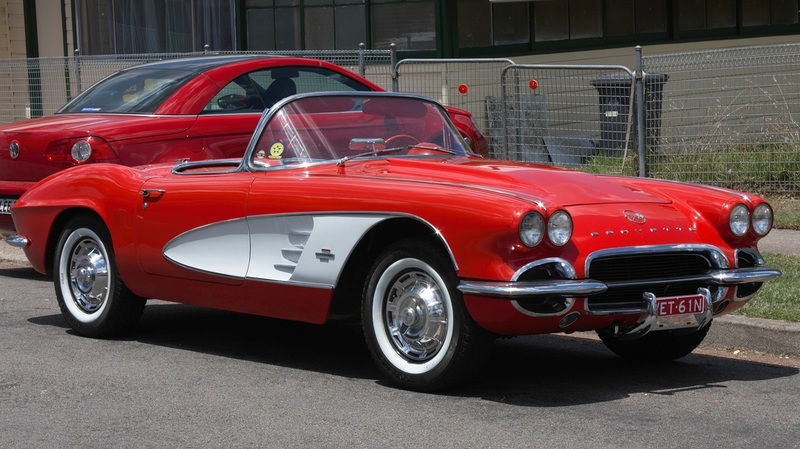 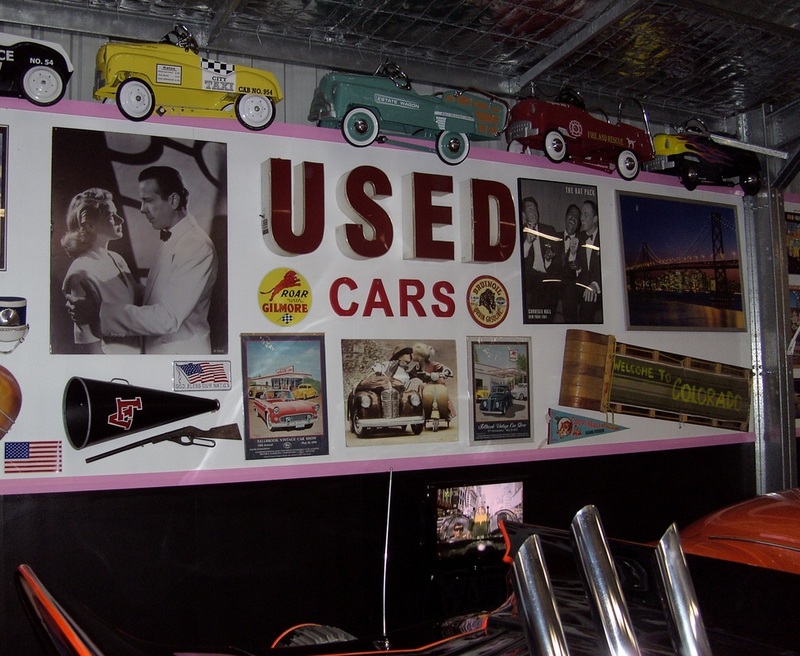 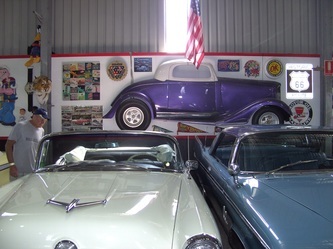 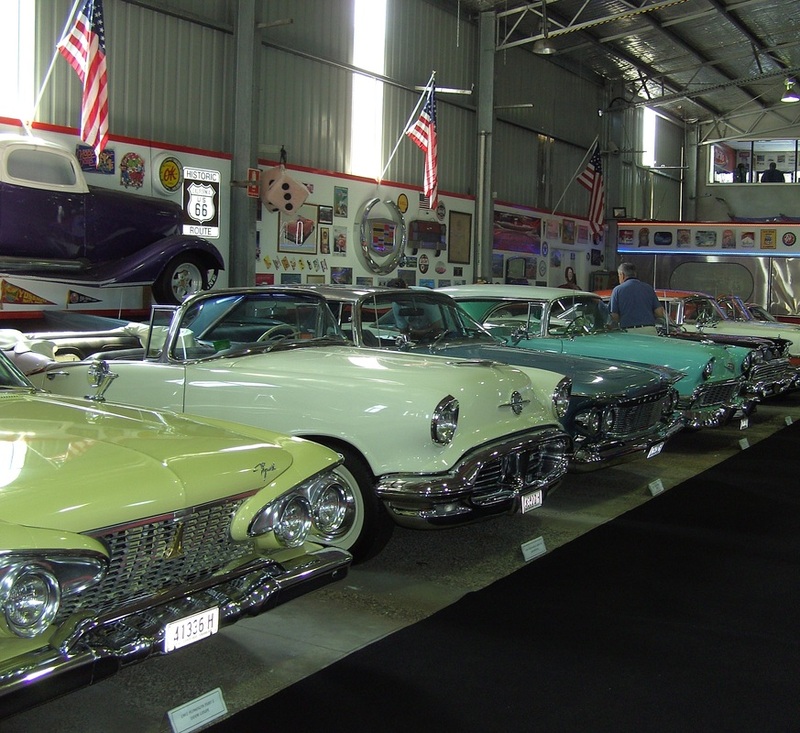 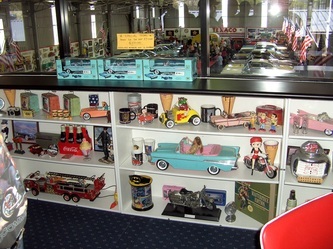 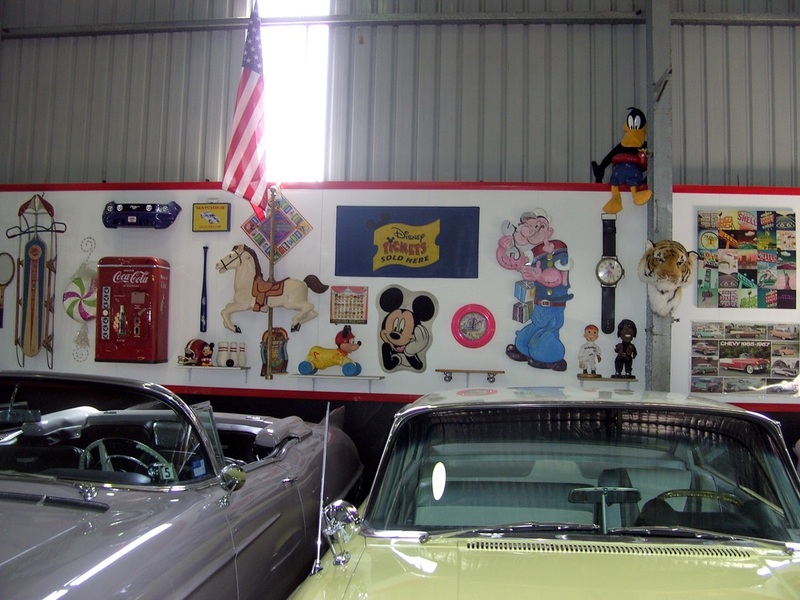 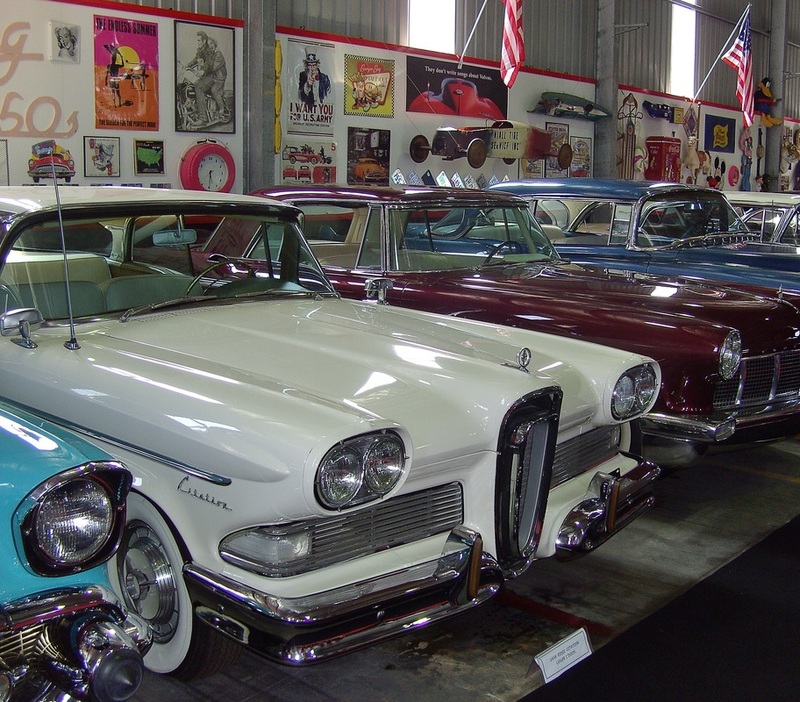 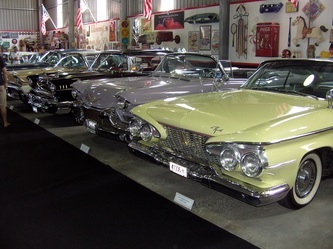 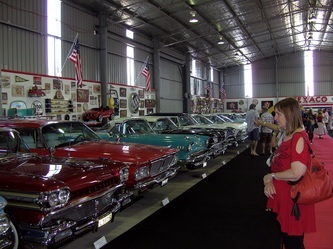 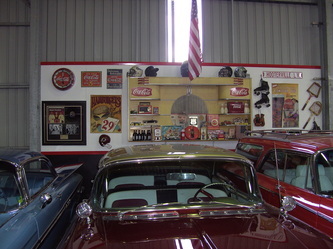 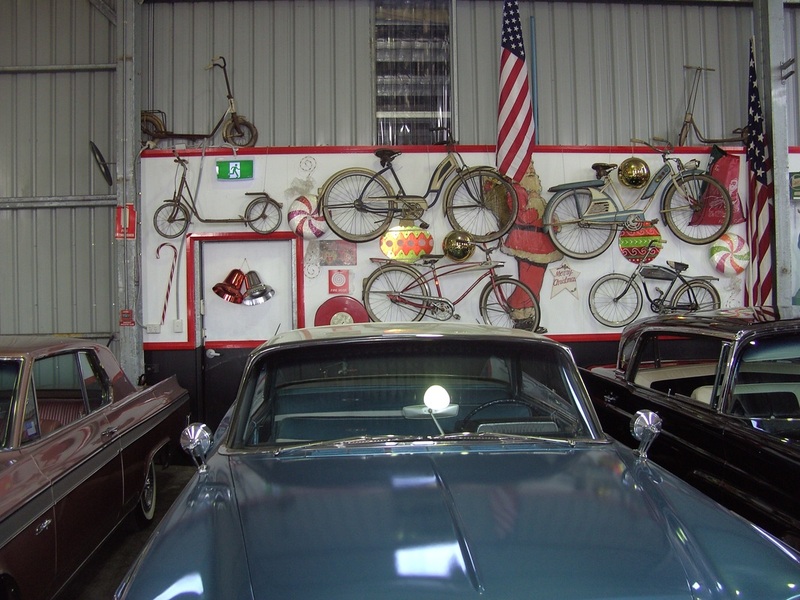 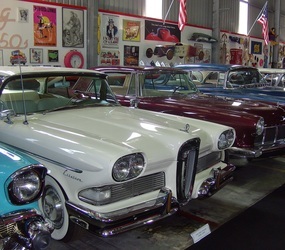 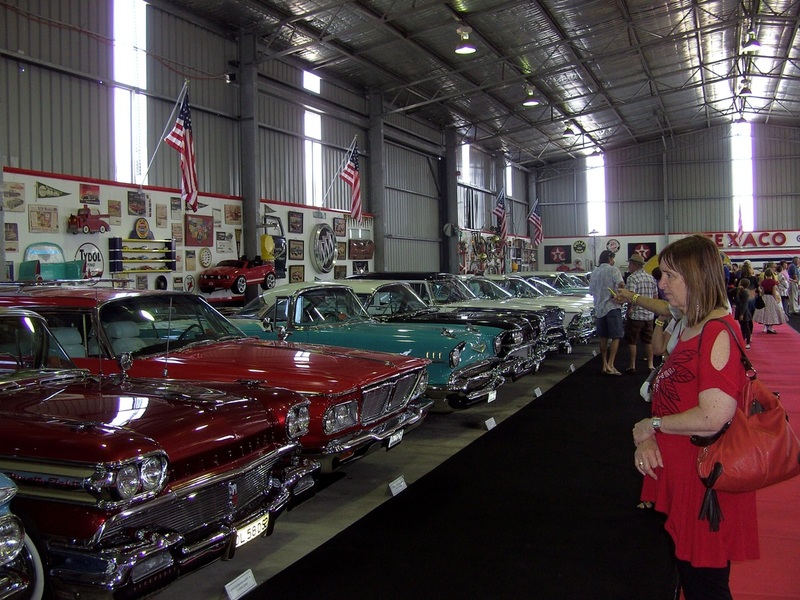 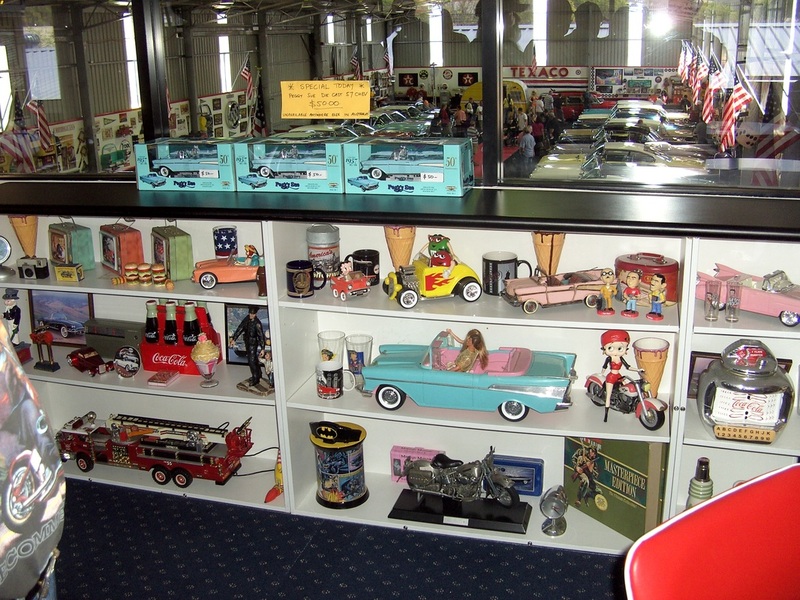 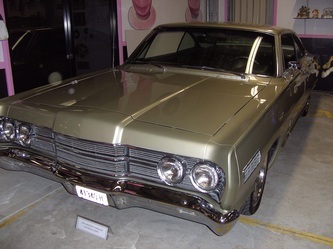 This exhibition of cars and nostalgia is well worth the entry fee and will leave you wanting to come back again as you will never take it all in on one visit. Paul took all the following pictures, had a great day and also won a top 3 prize. A very warm and sunny morning saw a great crowd turn out for Stewart ( Soup ) Campbell's 65th Birthday. 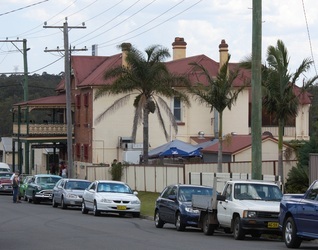 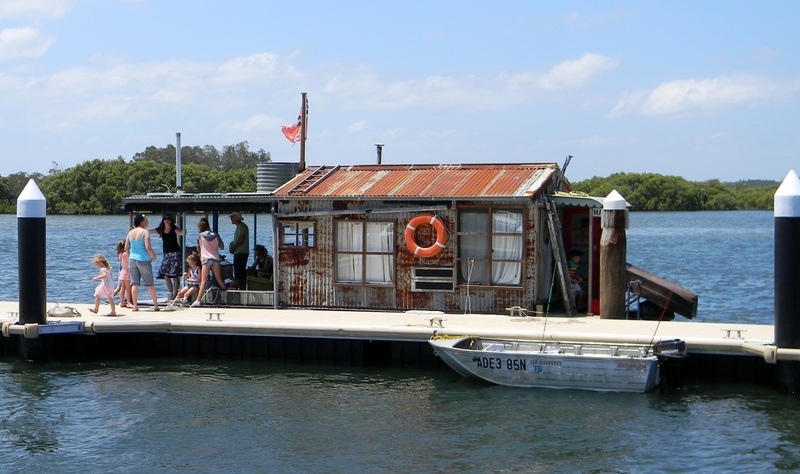 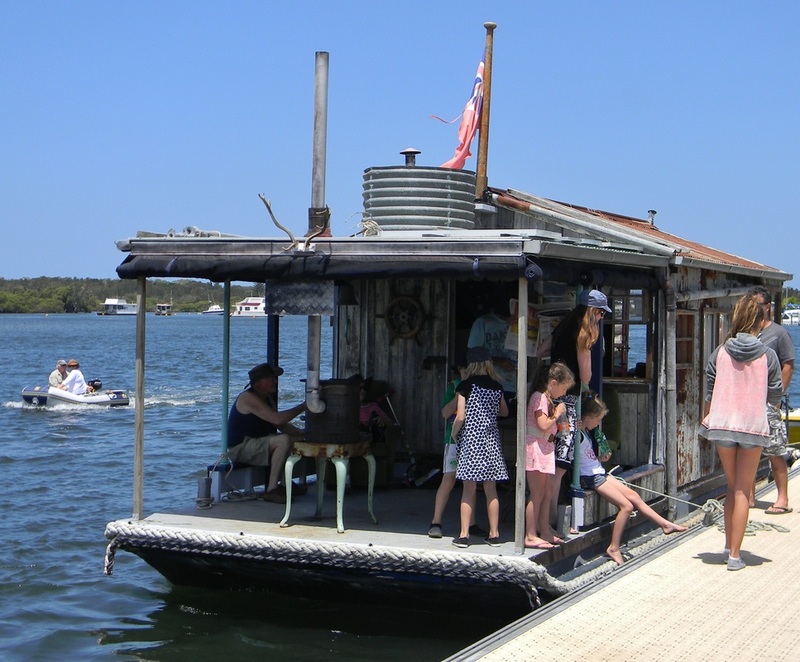 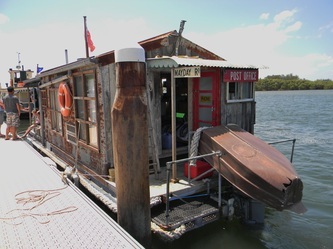 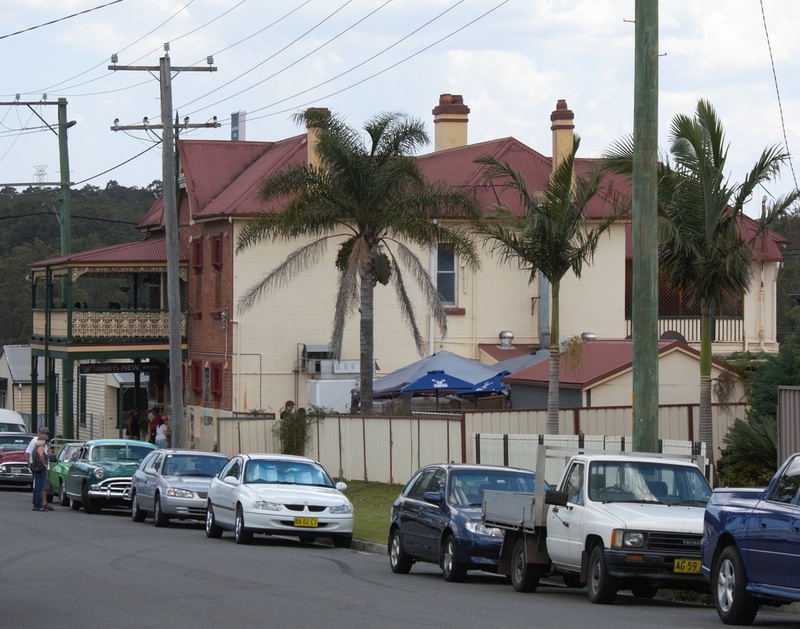 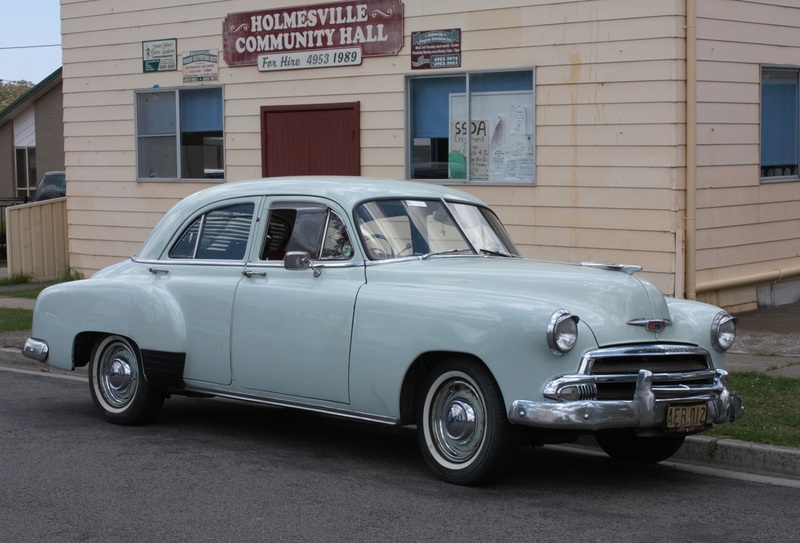 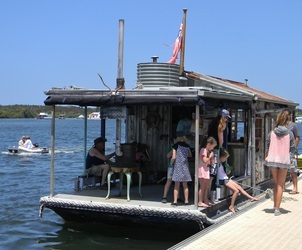 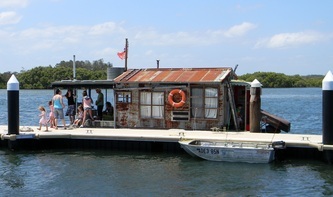 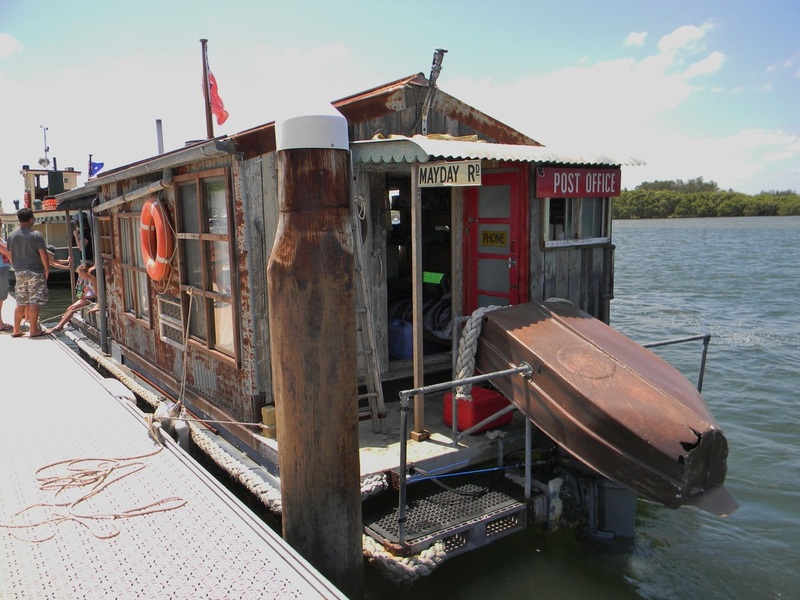 This is the 6th year the event has been held and the Holmesville pub was bursting at the seams. The Flattrakkers started playing and just when you thought things would overheat a southerly came in and helped cool everyone down. 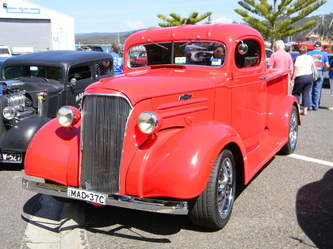 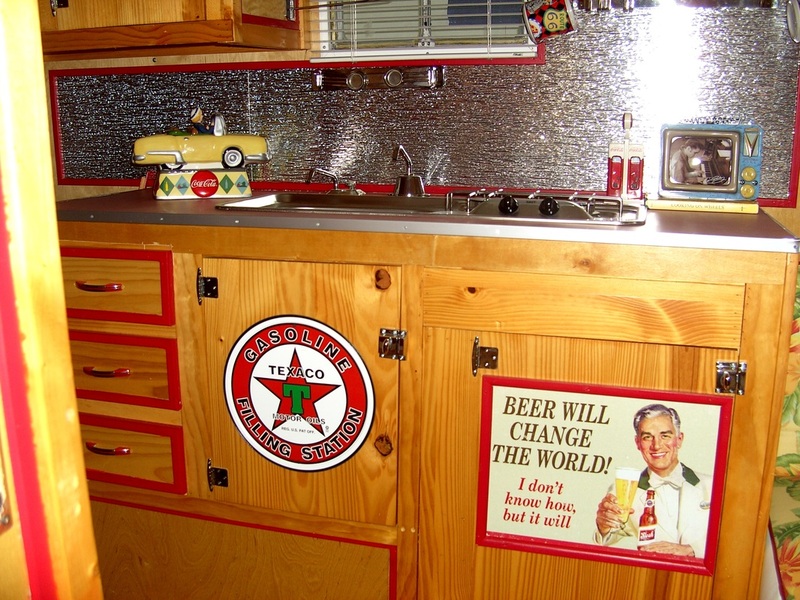 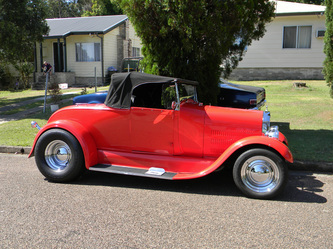 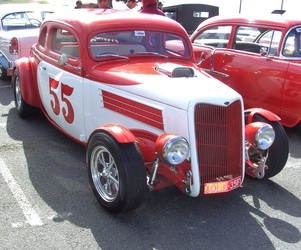 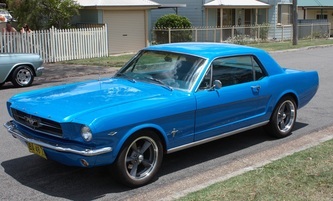 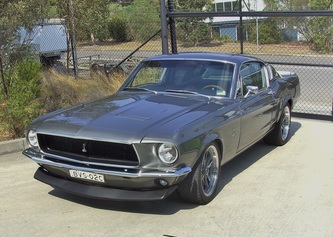 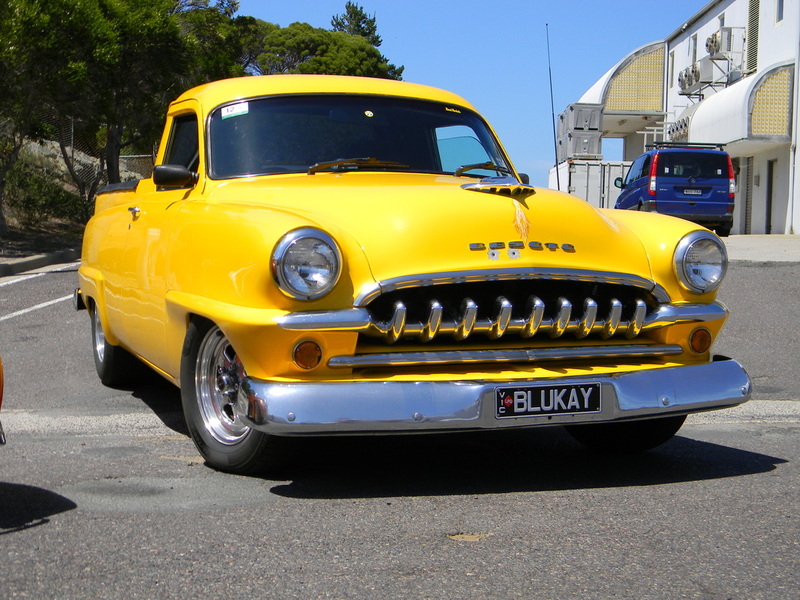 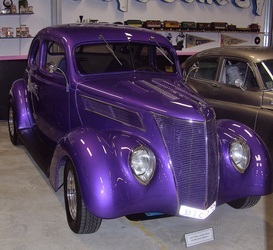 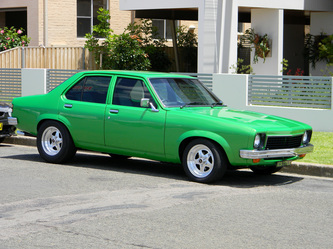 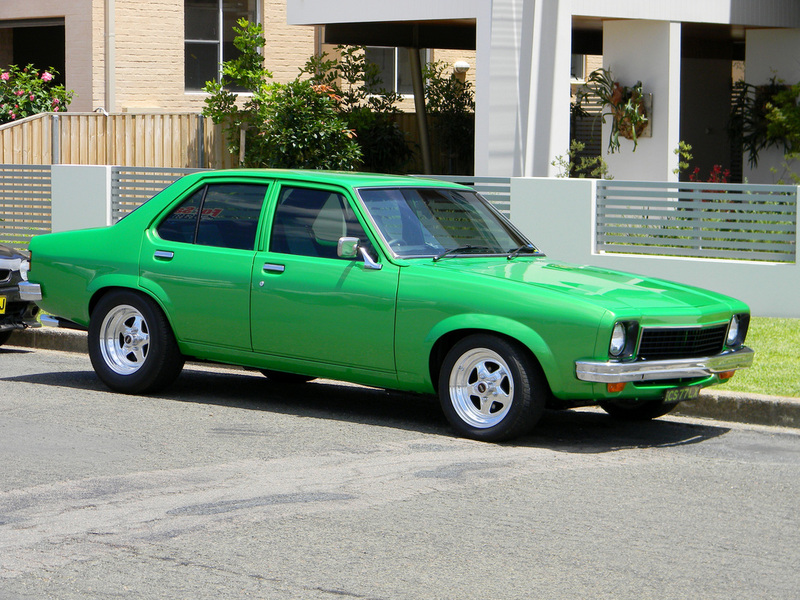 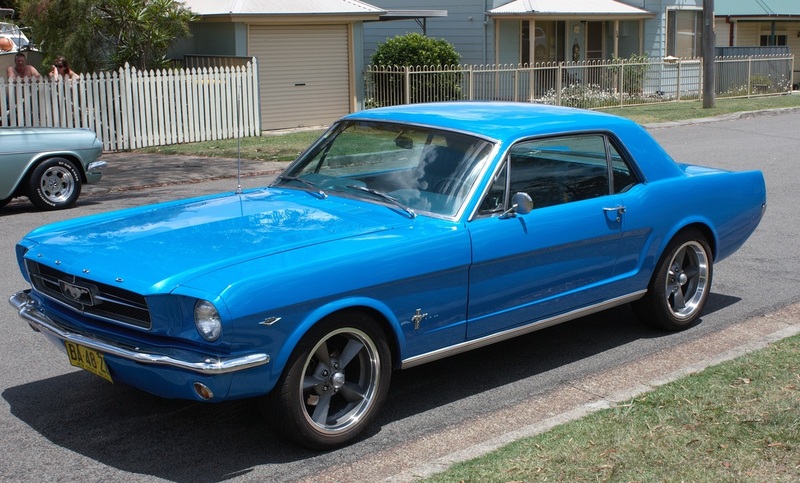 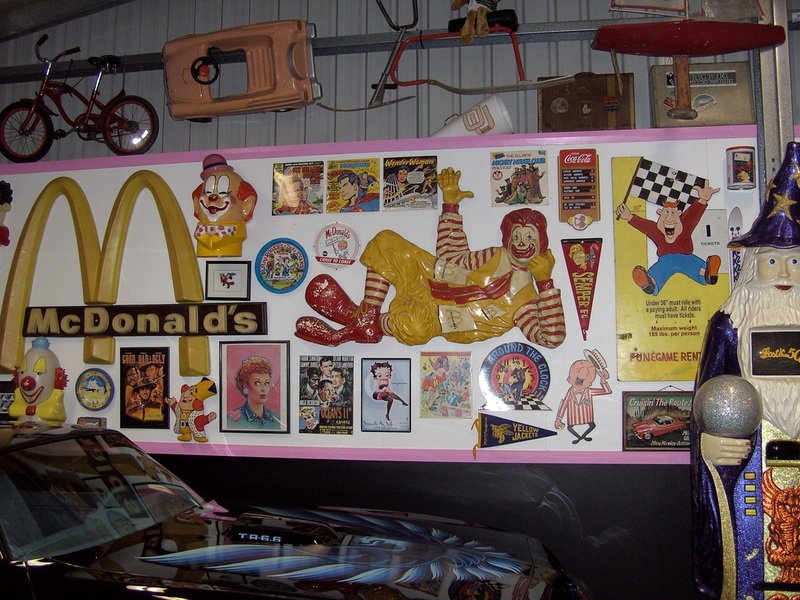 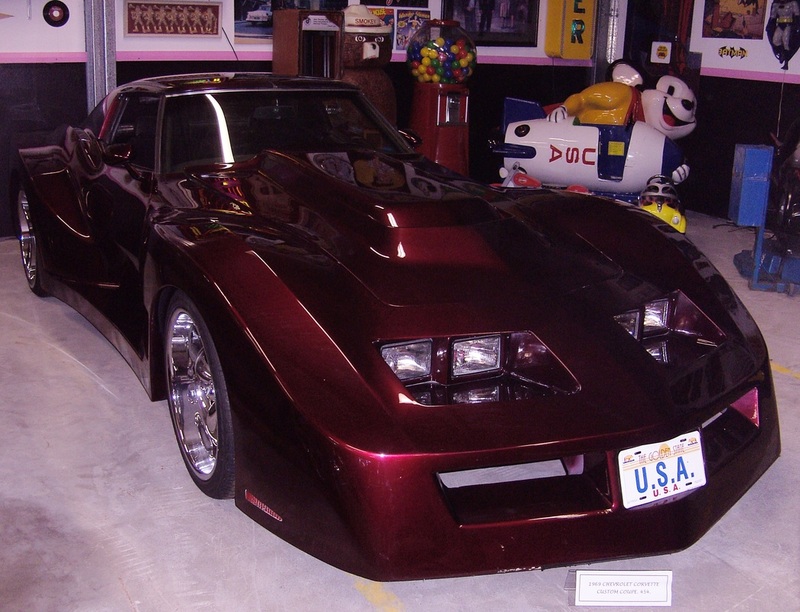 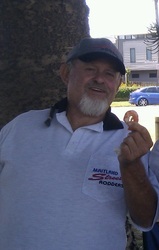 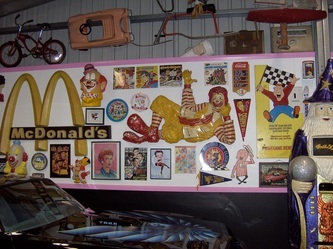 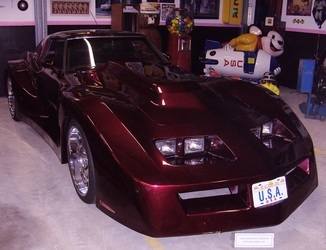 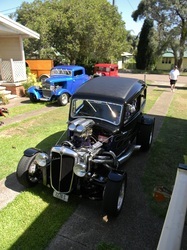 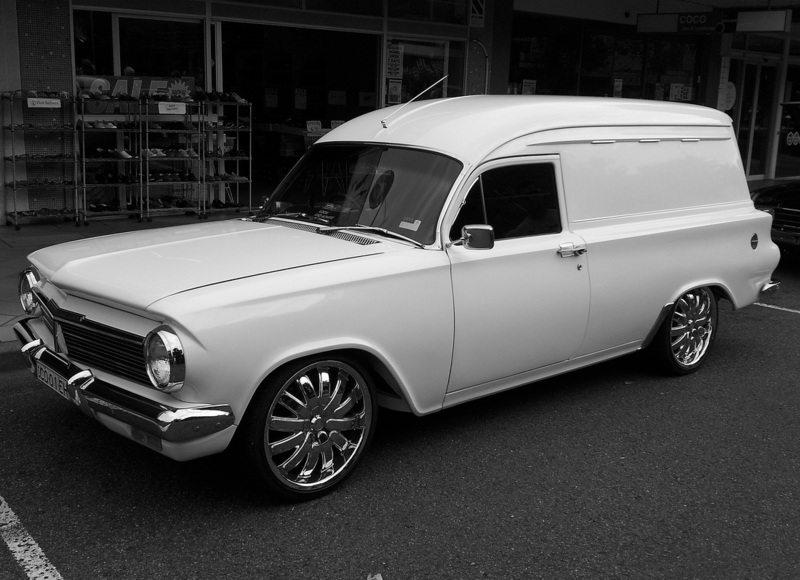 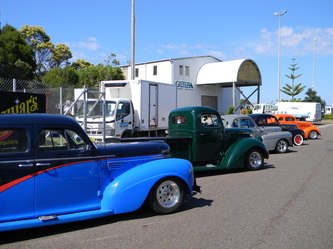 A great day was had by all and it is a tribute to a true Hot Rodder. 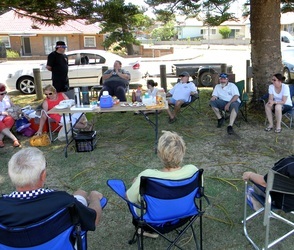 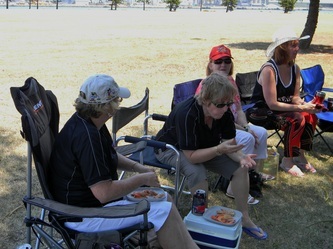 About 22 people turned up to this years Xmas BBQ at Stockton. 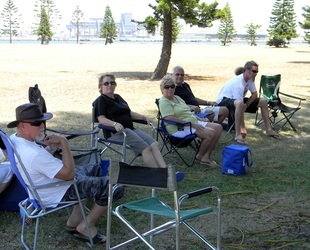 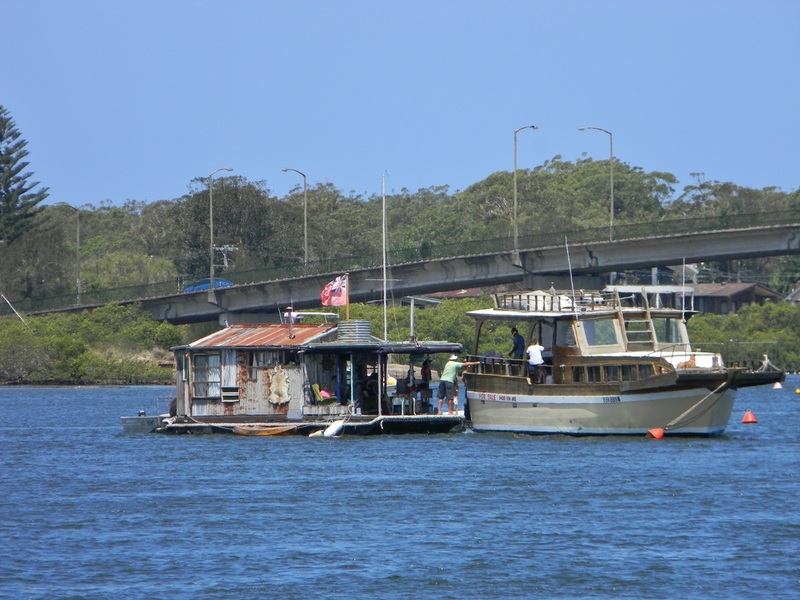 On arrival there was a light North Easterly breeze blowing which kept everyone cool and relaxed. We were all sitting around enjoying the atmosphere and location, eating prawns and thanking our lucky stars that Noel was not there so we could all have more prawns than usual. Next it was time to light the BBQ and as we did the day turned from idyllic to catastrophic as one of the strongest southerly changes we have ever seen hit Stockton. 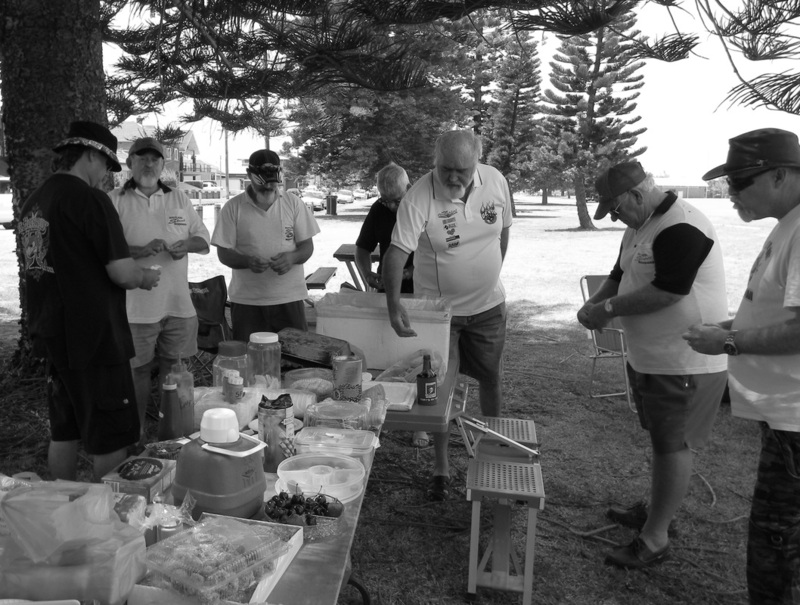 Somehow the BBQ managed to cook the meat, with the help of everyone acting as a human wind break, but the weather became so unpleasant that as soon as we all finished eating we packed up and left. 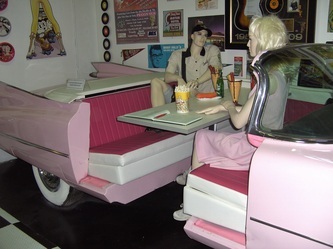 We have had two attempts to hold Xmas parties at Stockton and the weather has spoilt both, so a new venue will need to be found or it will be back to the Drive-In. 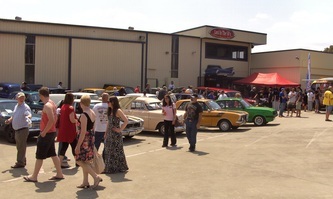 On the 29th December 2012 the last event of the year was held. This saw 18 rods and other vehicles travel to Tea Gardens to have lunch at the pub and then back to see the progress made on the building of Kim's rod. 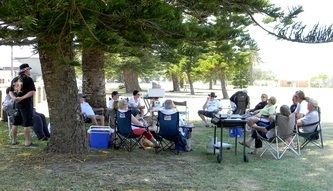 It was a great day with fine weather and good company and nearly everything went well. As usual though someone always has trouble and this time it was Bob's turn with the alternator bolts sheering off as he arrived in Tea Gardens and the back brakes sticking on the way home. 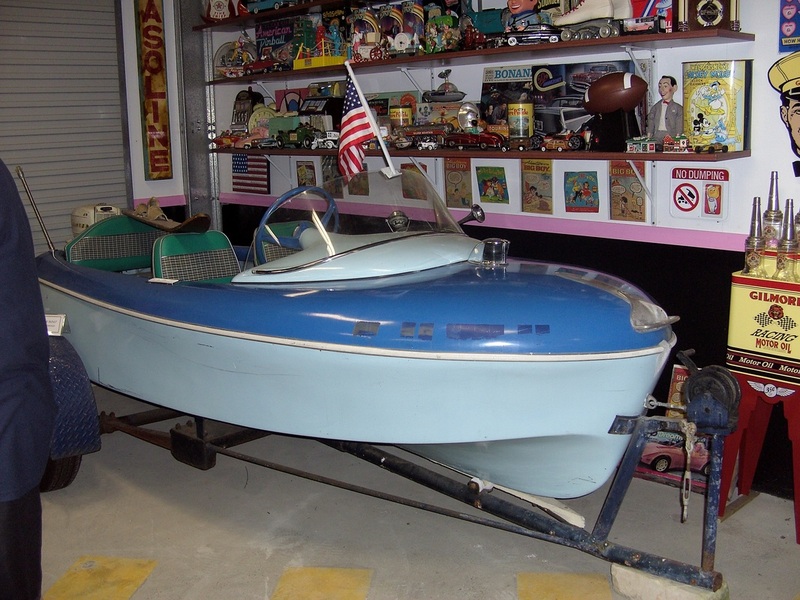 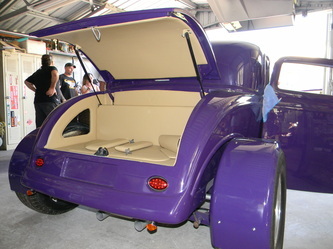 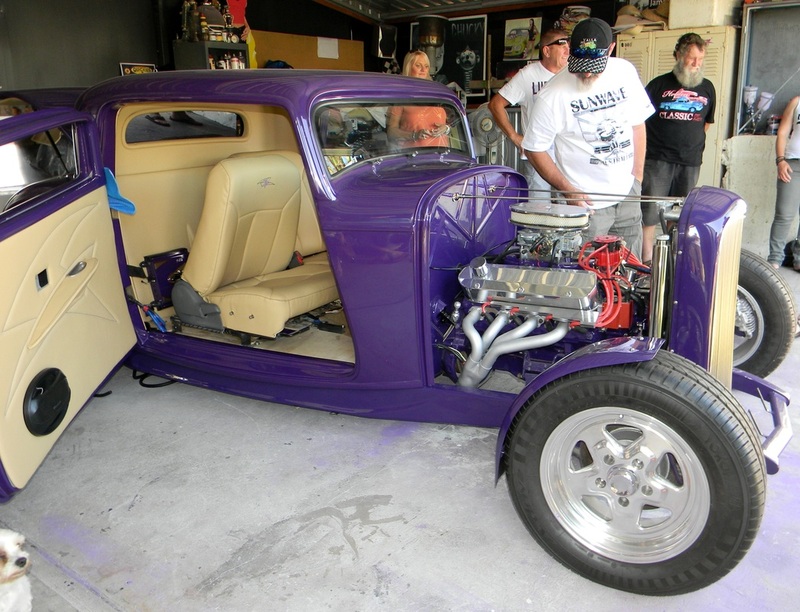 Kim's rod is nearing completion and it looks great, she will owe Darryl lots when this build is finished.